Mukai Haguroyama castle (向羽黒山城, also called as Iwasaki castle) is located over the body of Iwasakiyama mountain, one of 180 meter height from hillside in Aizumisato town. 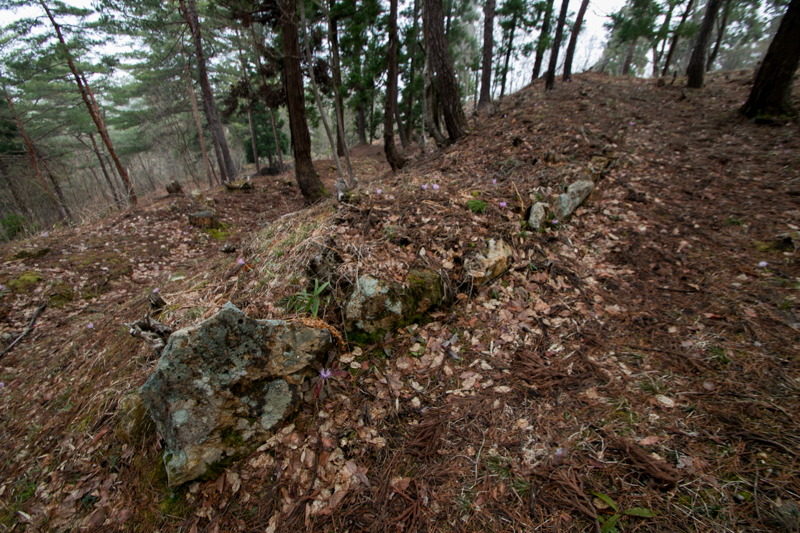 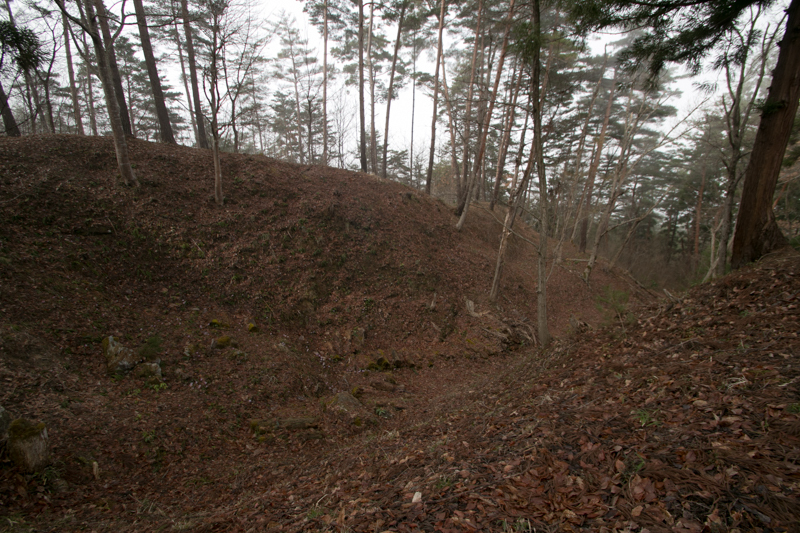 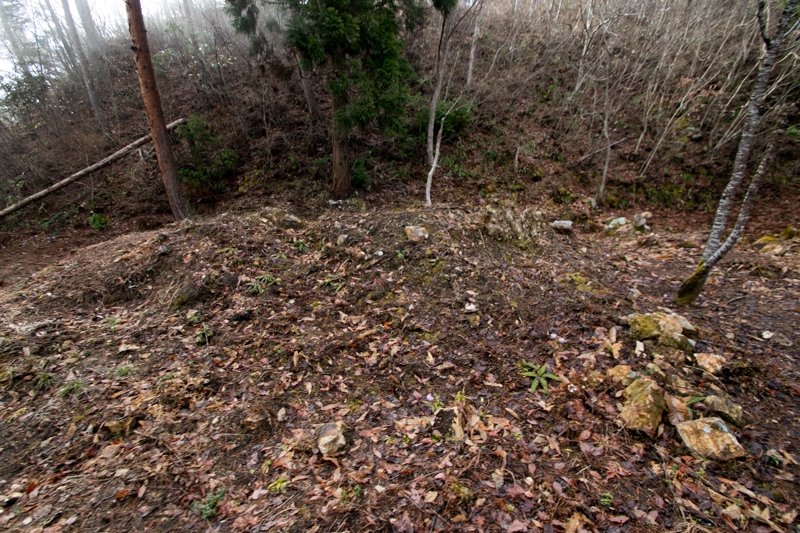 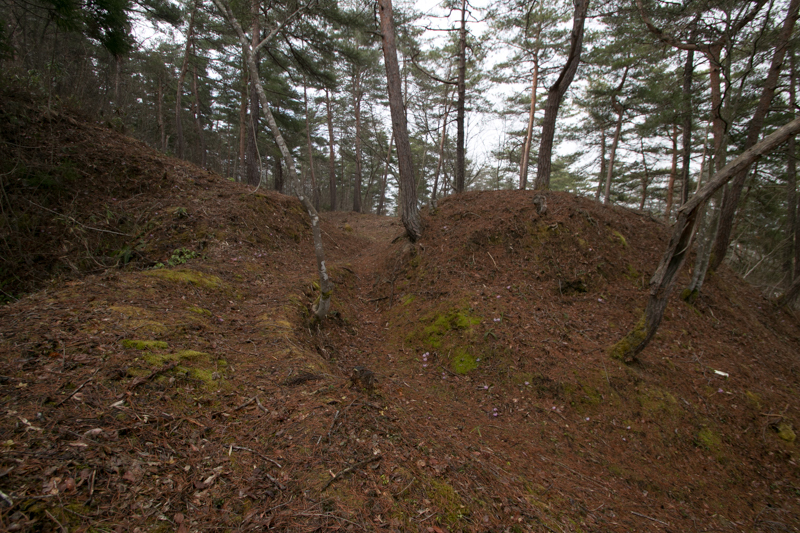 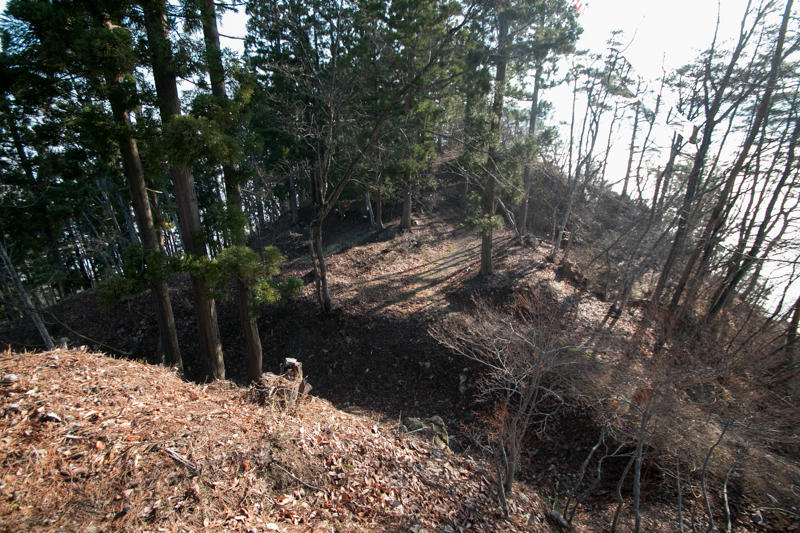 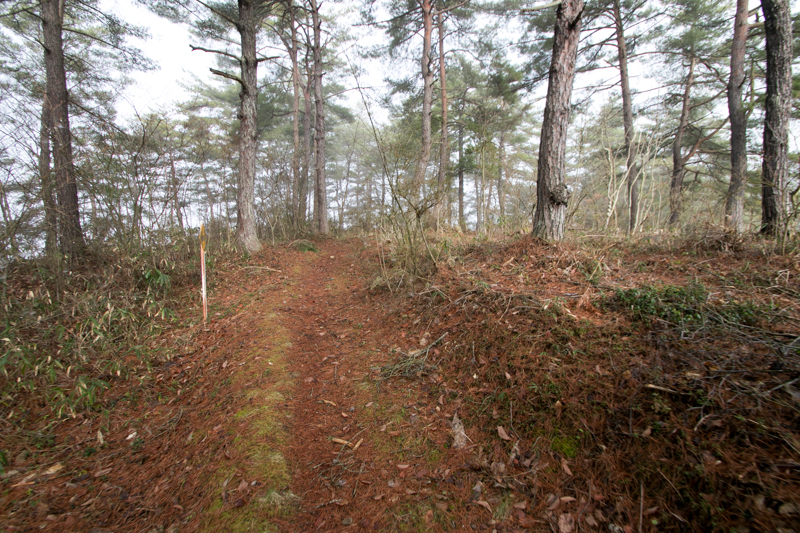 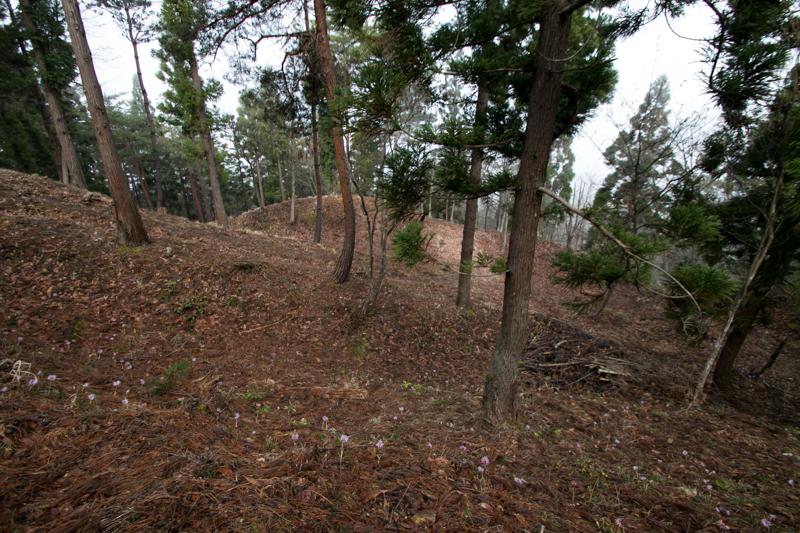 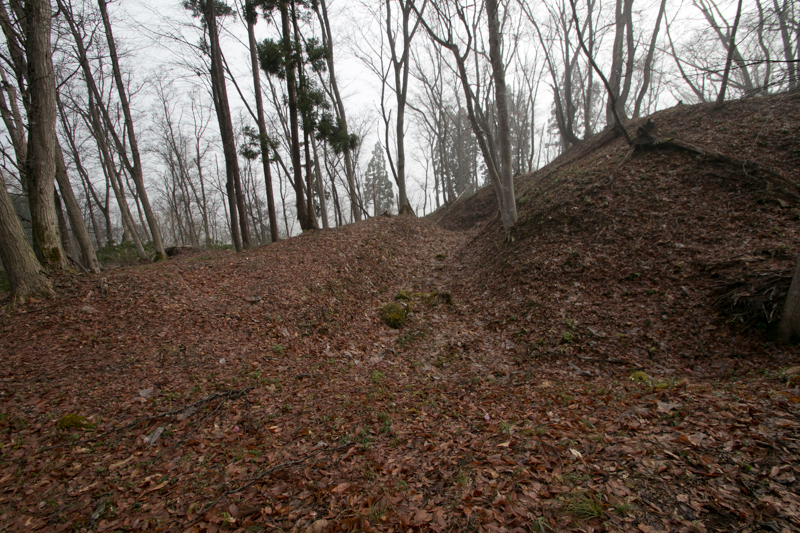 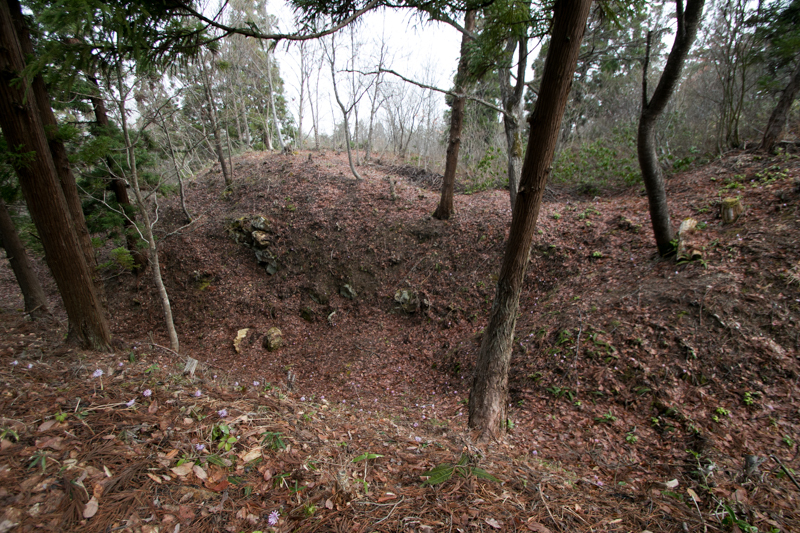 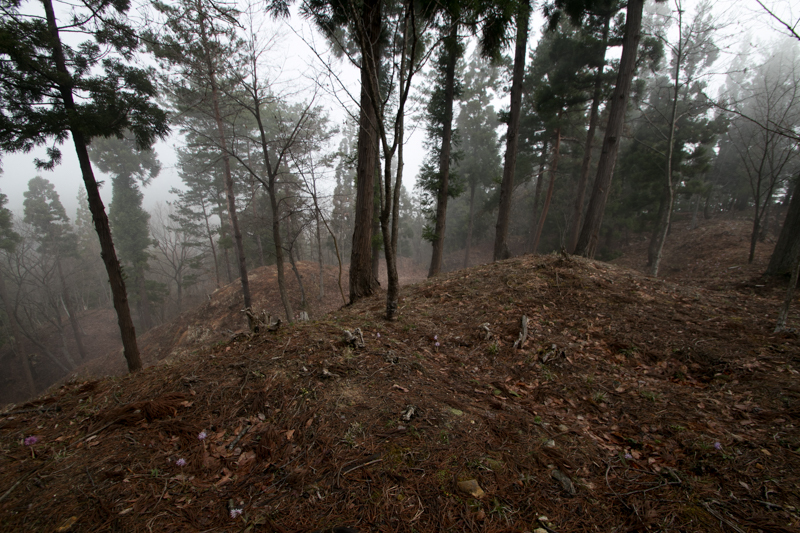 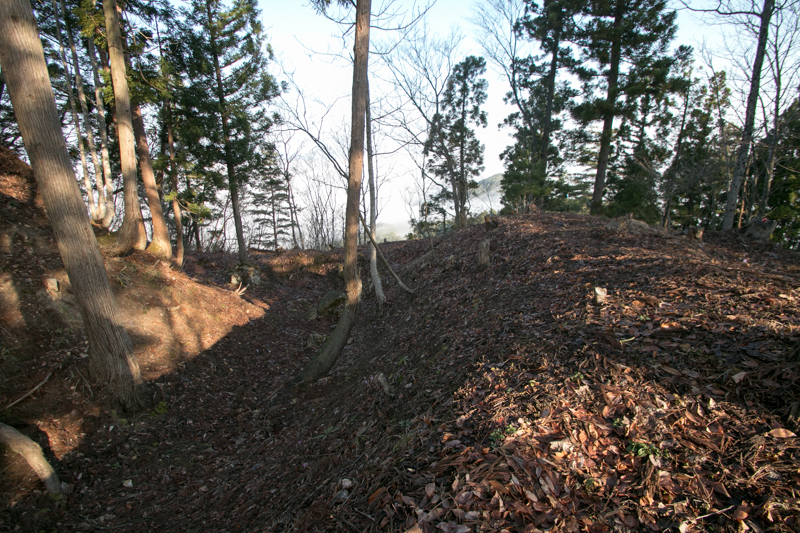 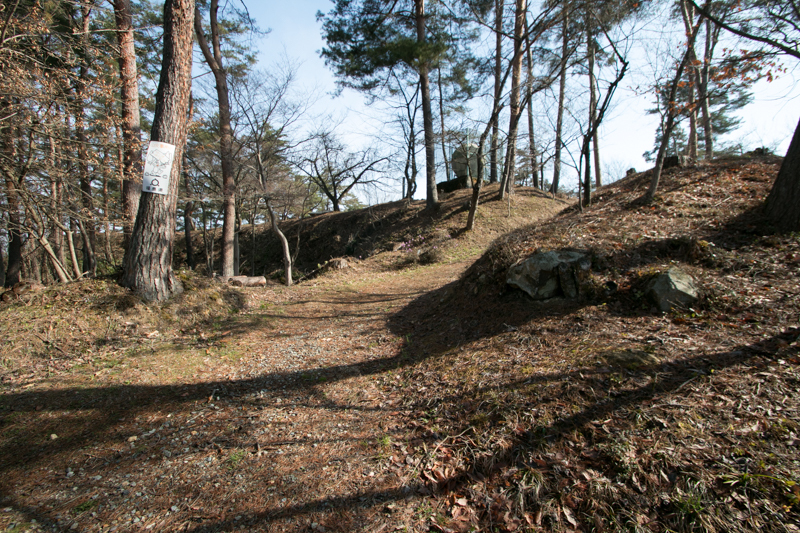 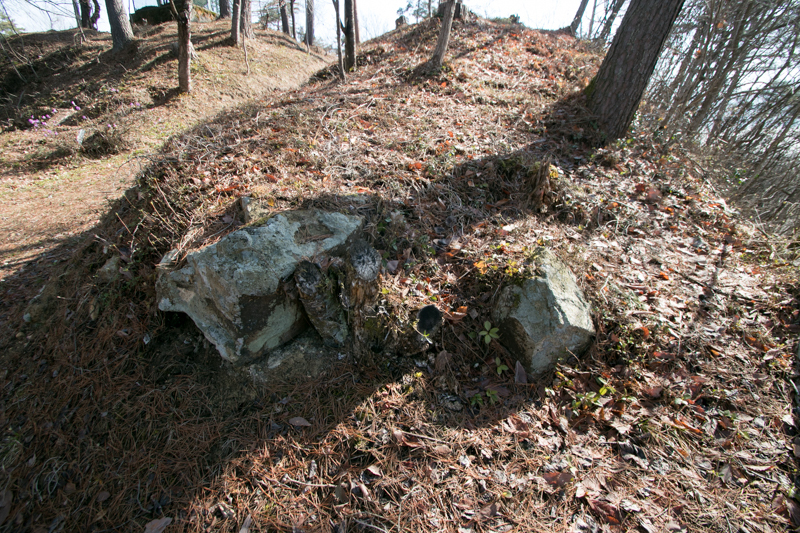 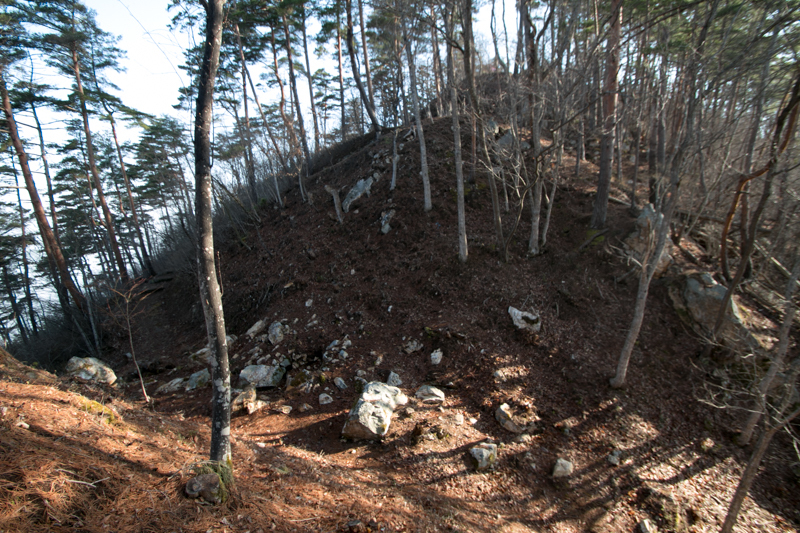 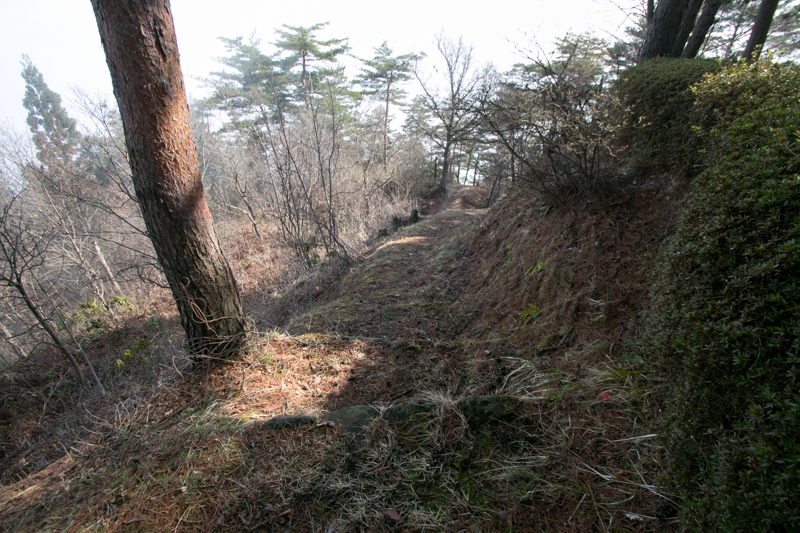 The site of this castle is just beside Agagawa river, and places at 10 km southwest of Aizu Wakamatsu castle. 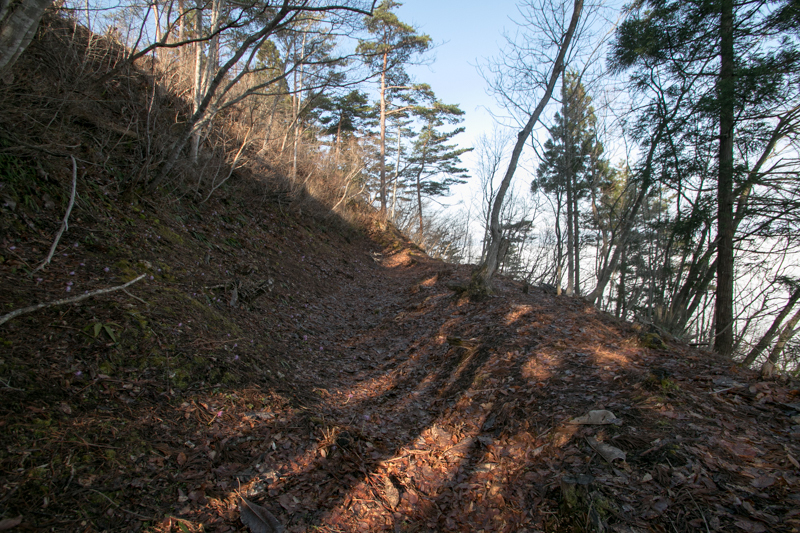 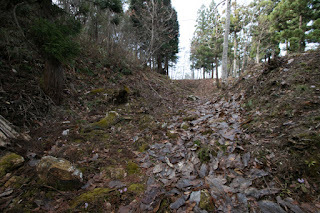 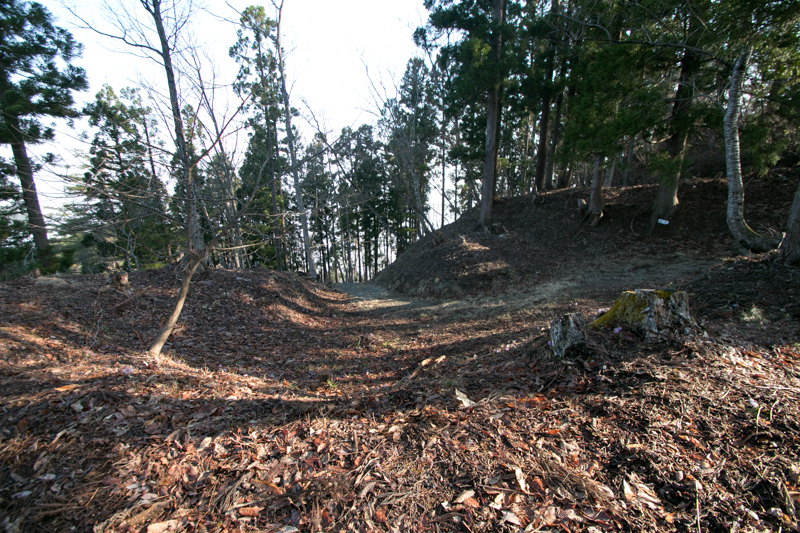 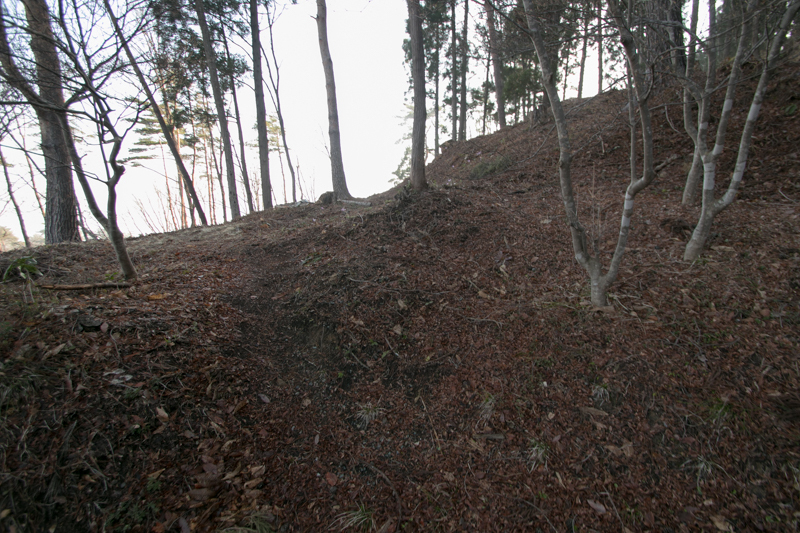 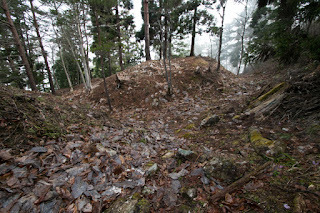 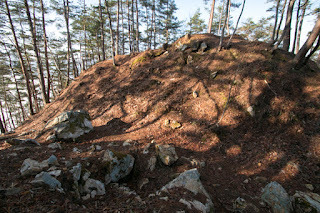 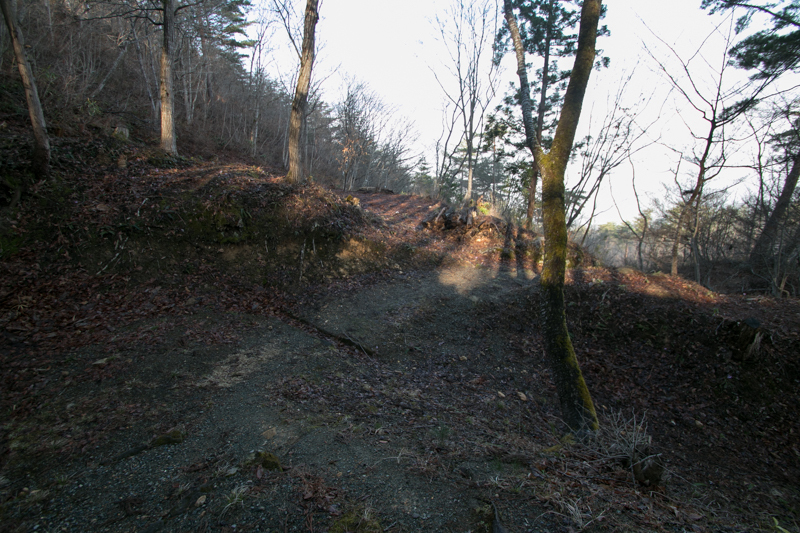 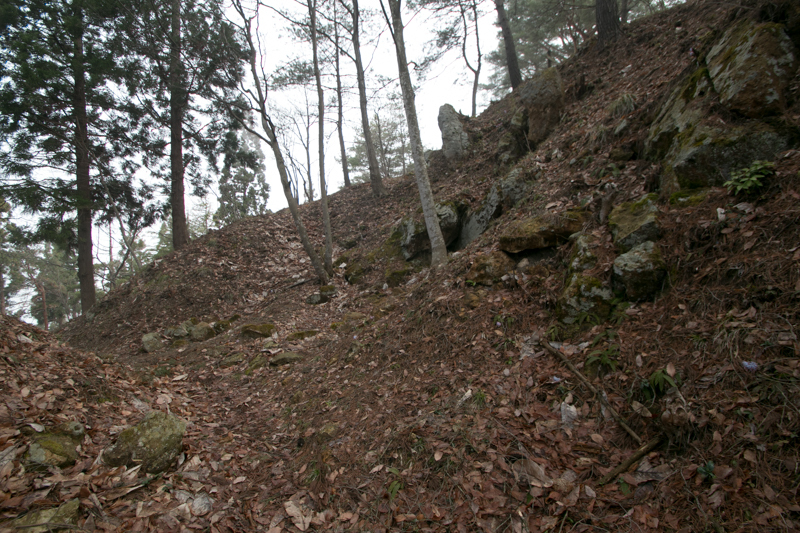 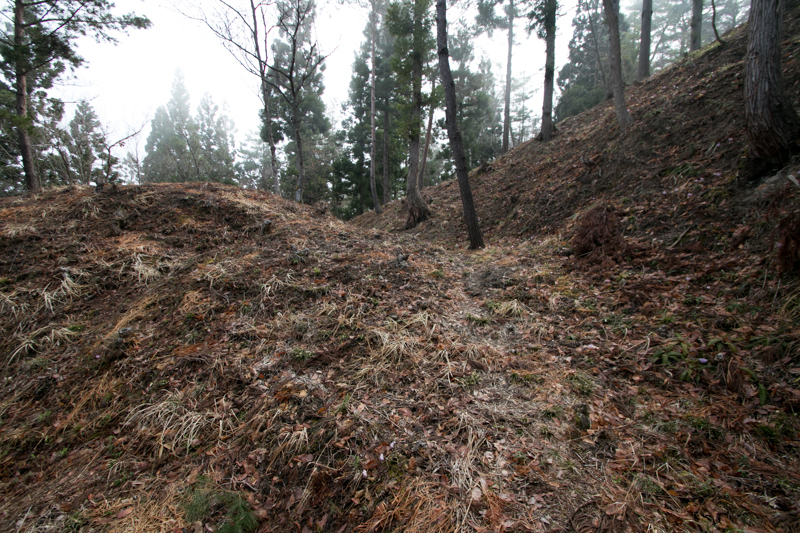 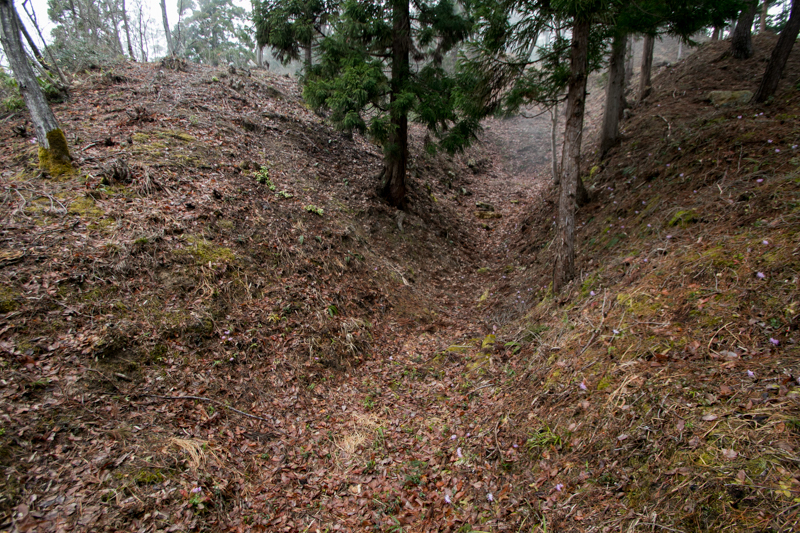 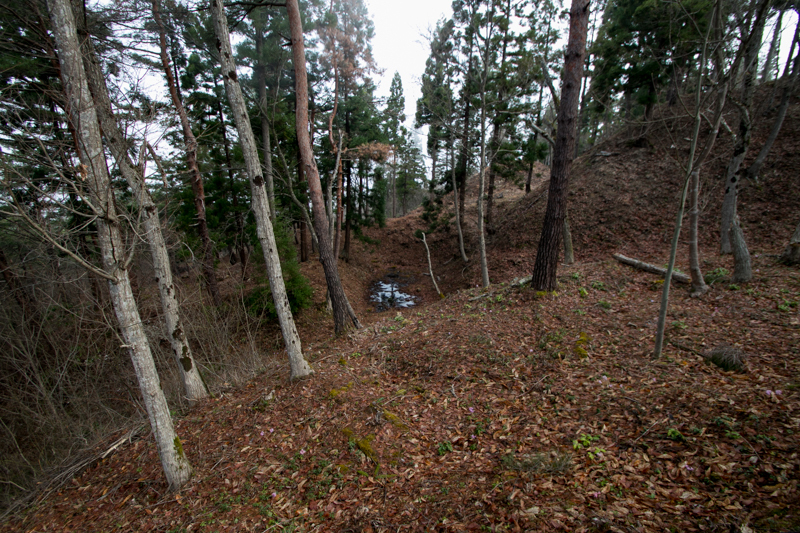 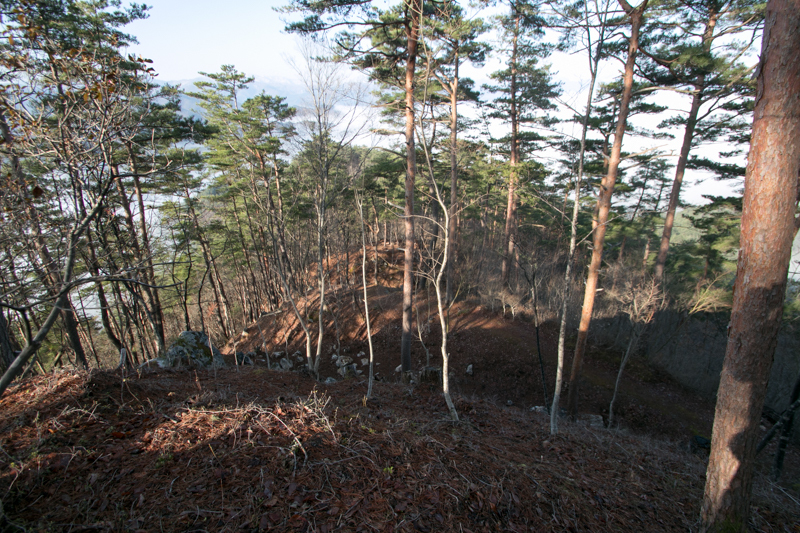 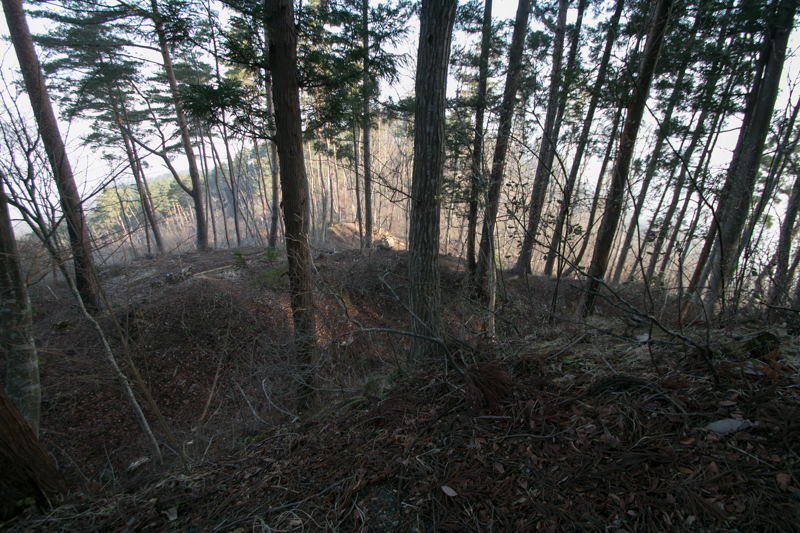 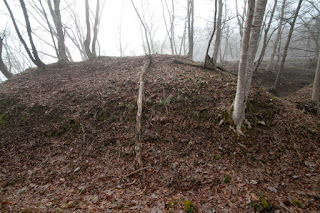 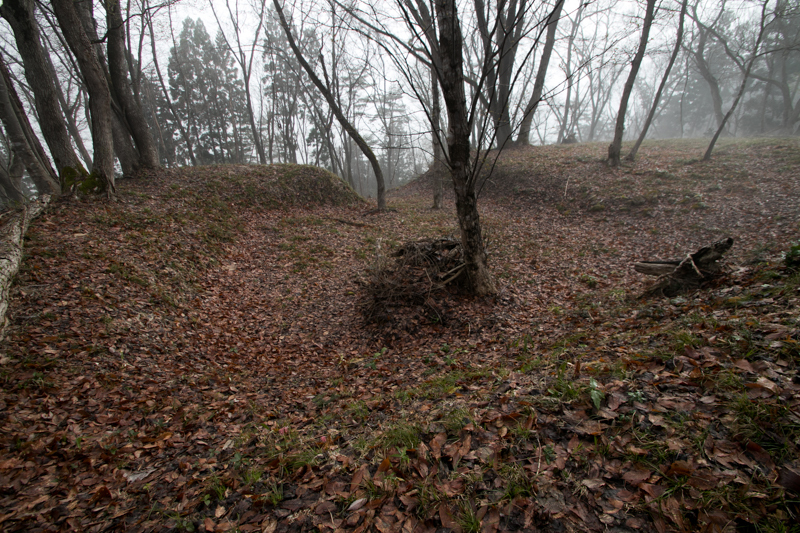 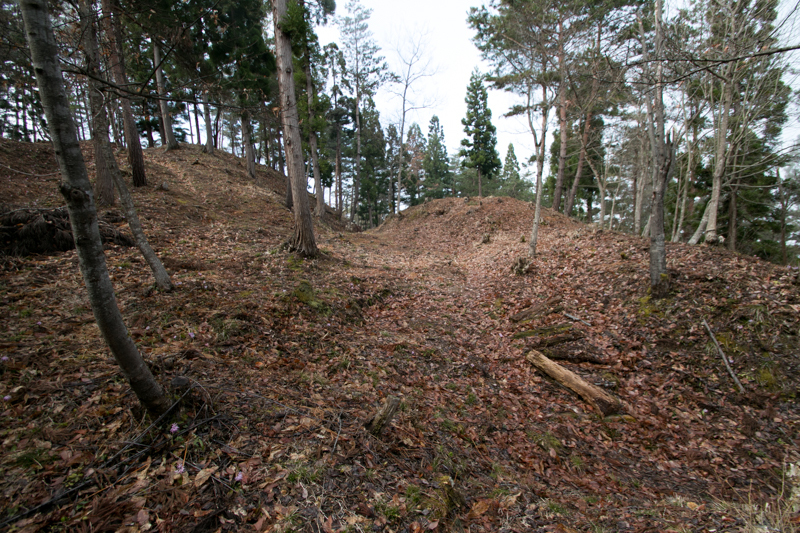 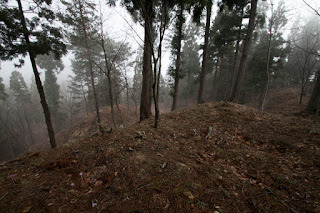 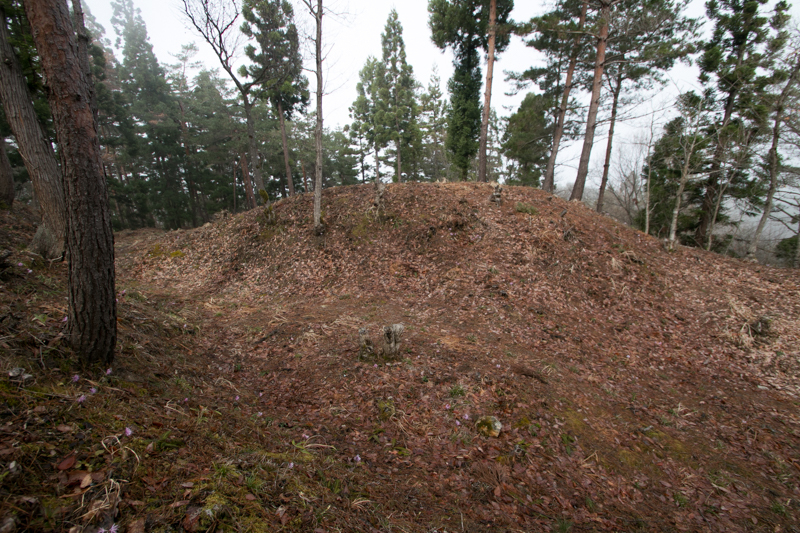 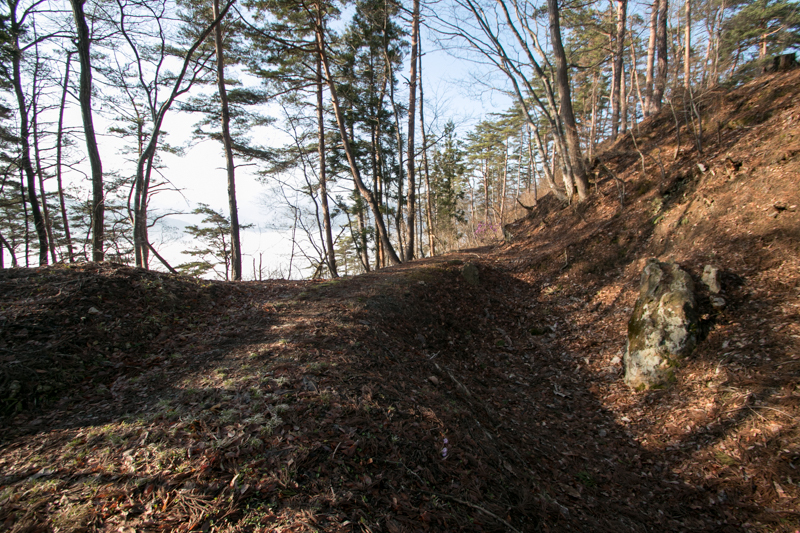 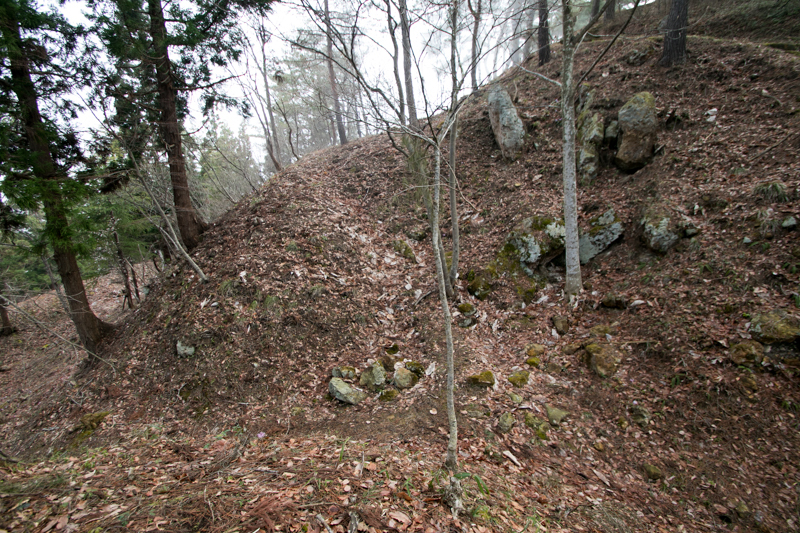 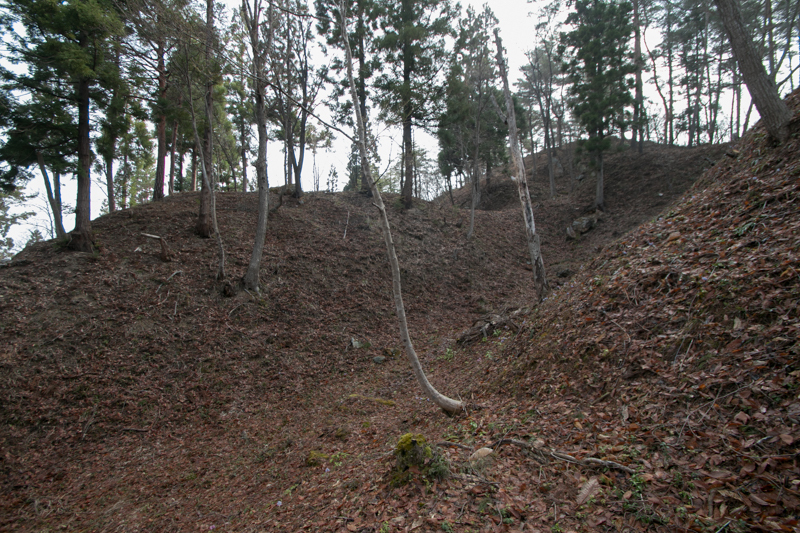 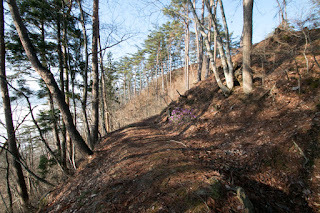 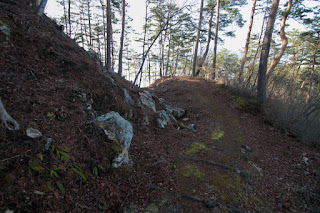 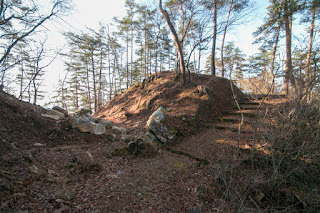 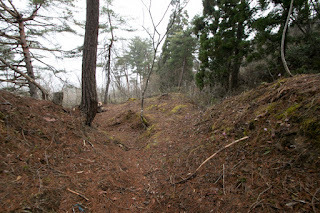 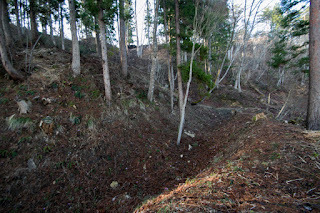 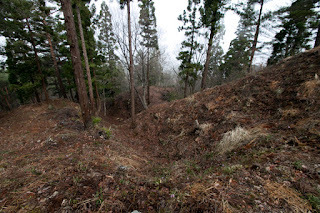 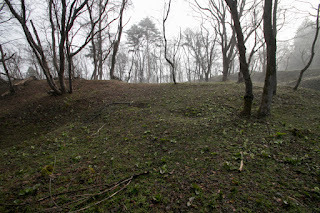 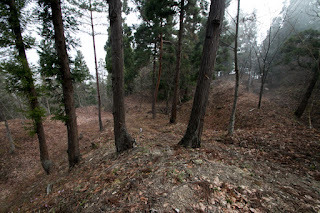 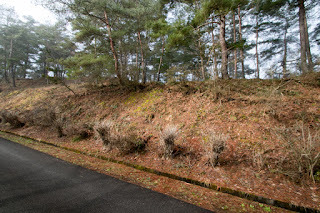 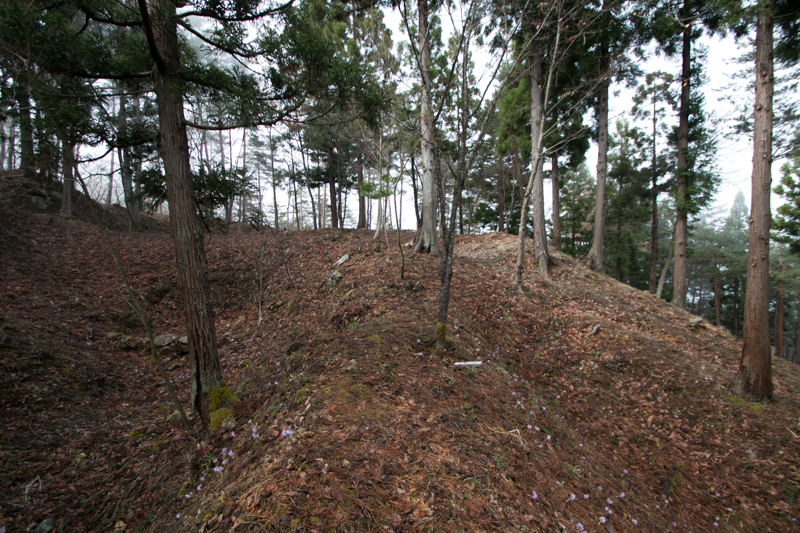 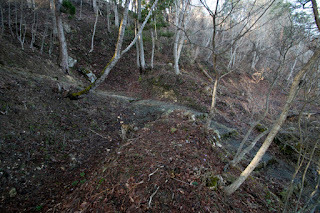 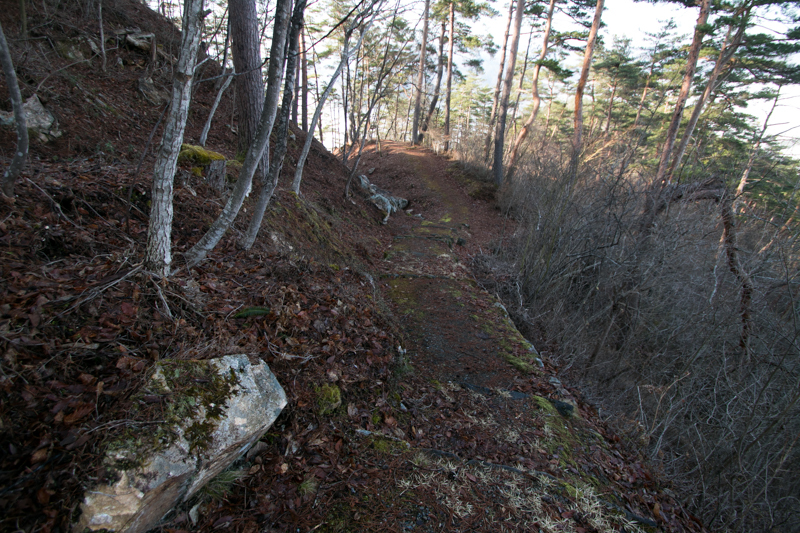 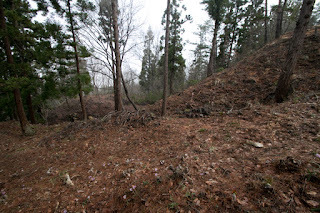 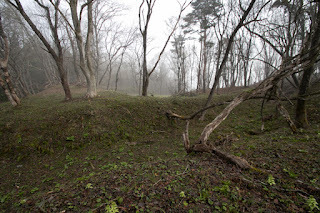 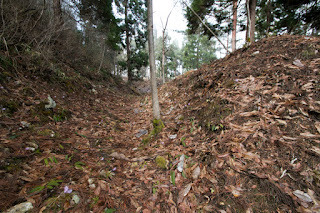 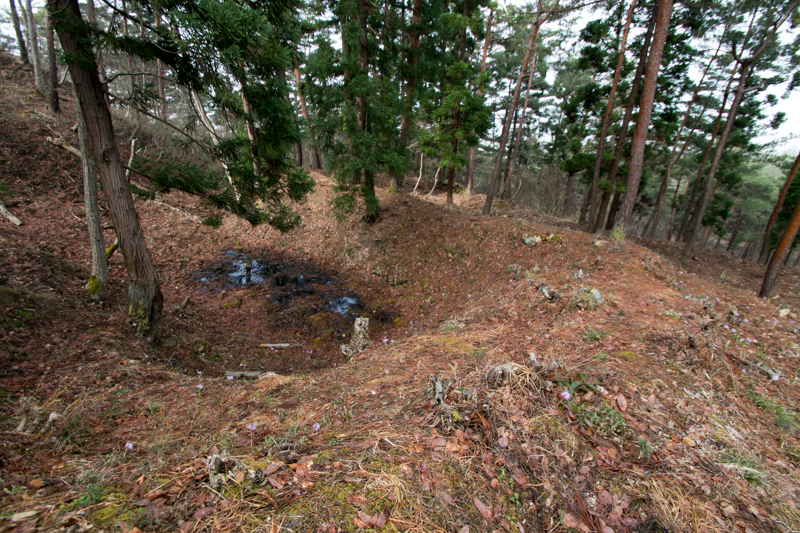 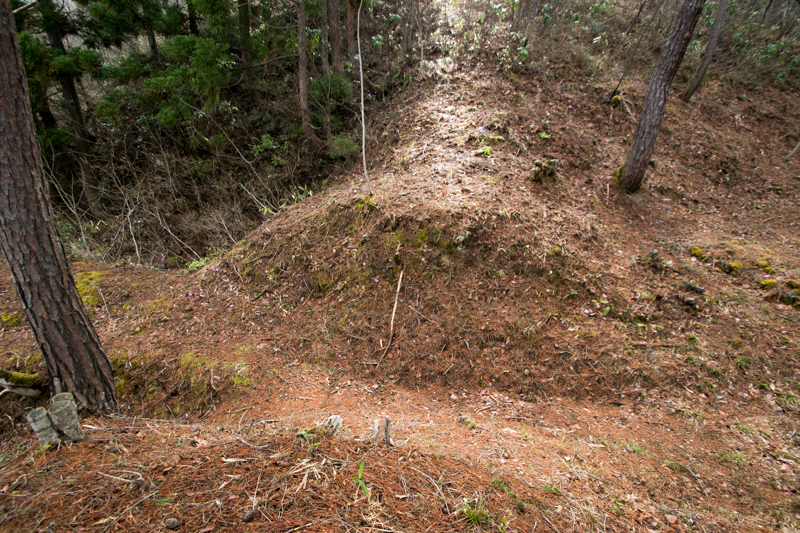 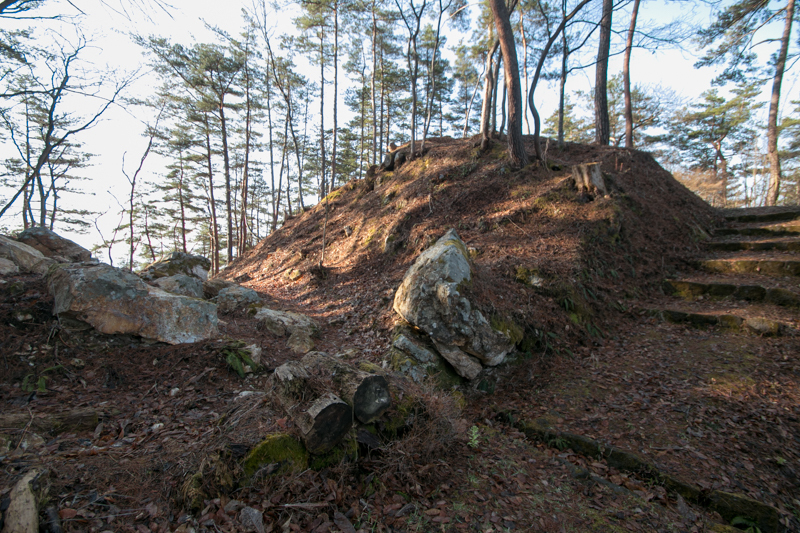 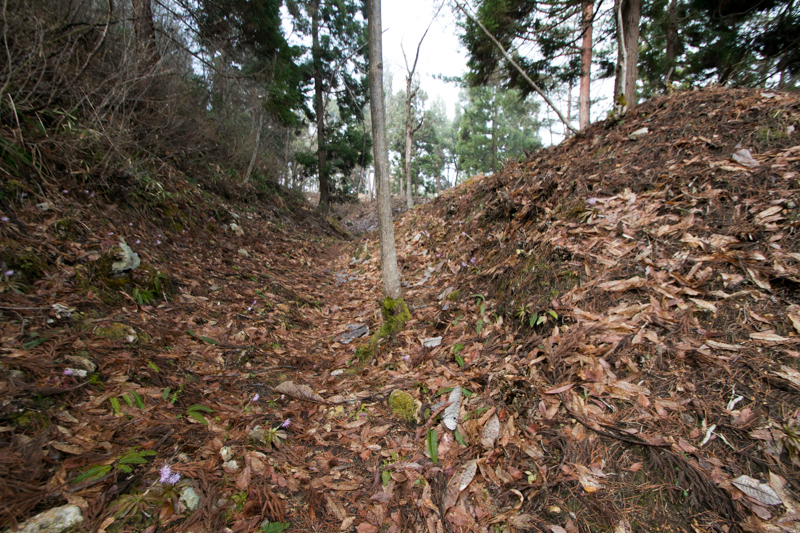 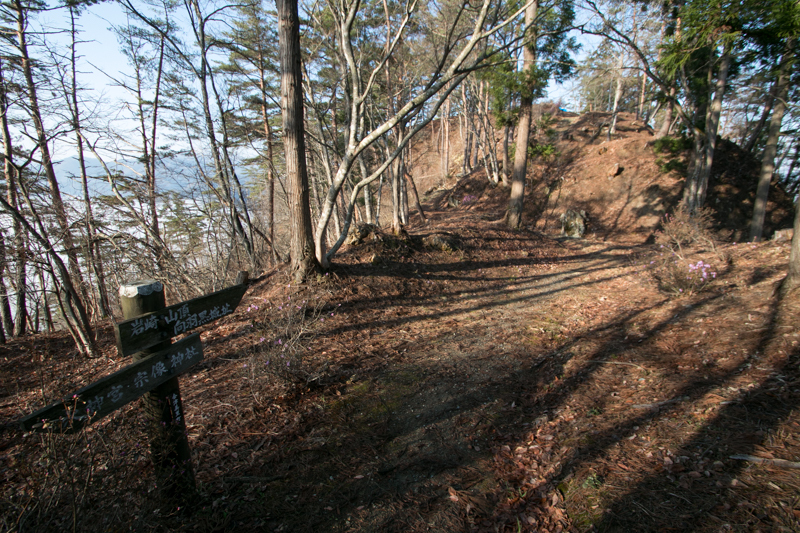 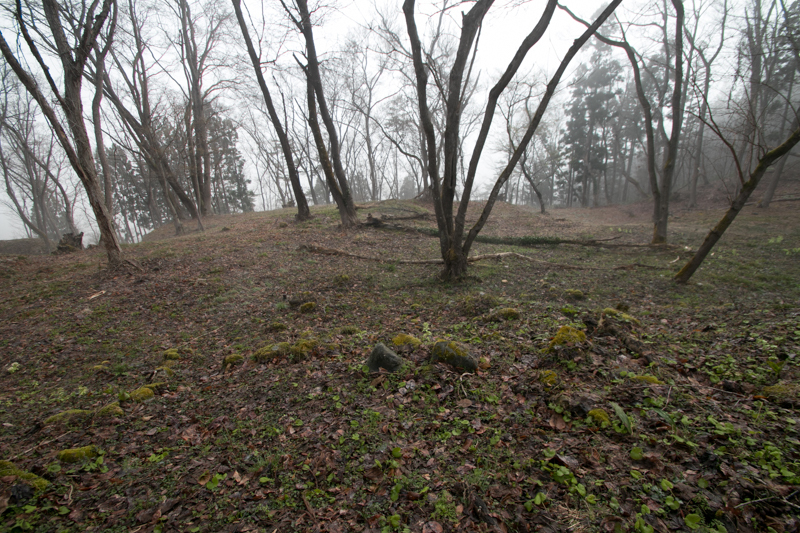 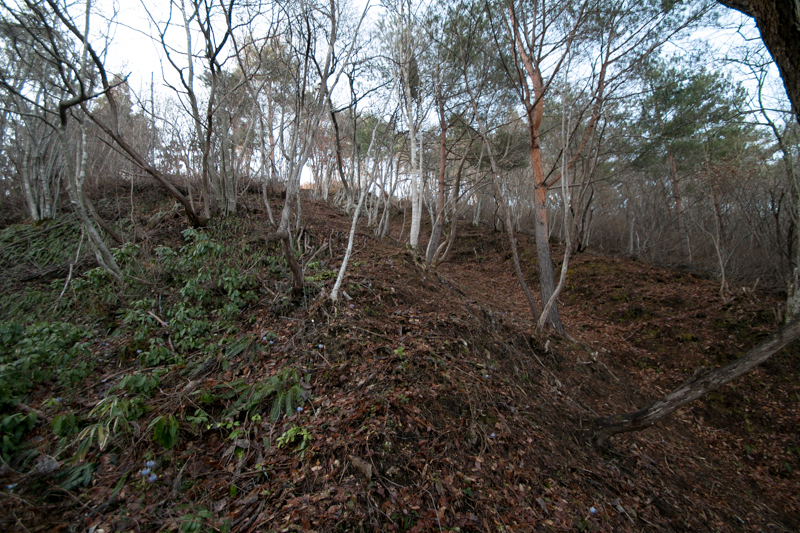 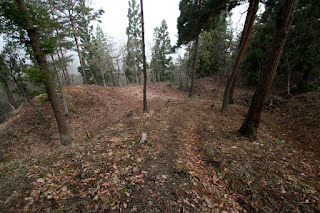 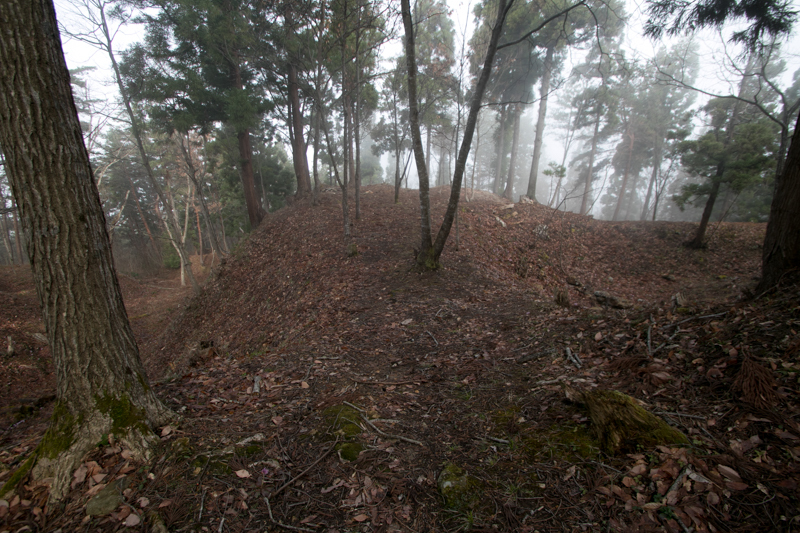 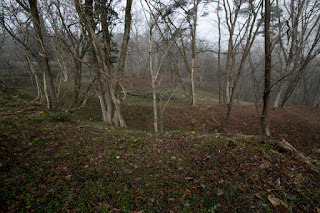 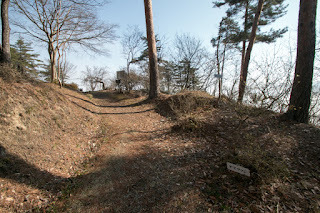 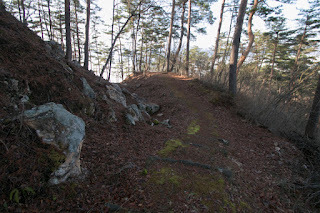 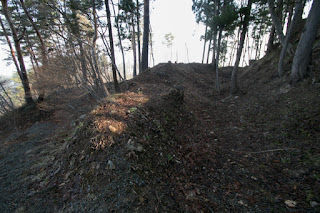 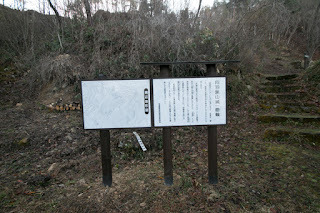 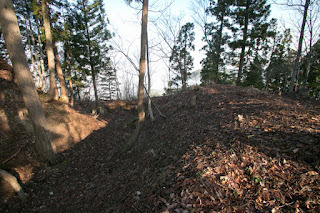 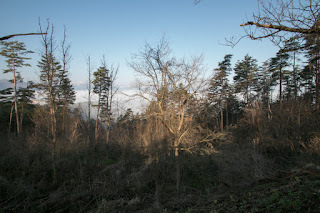 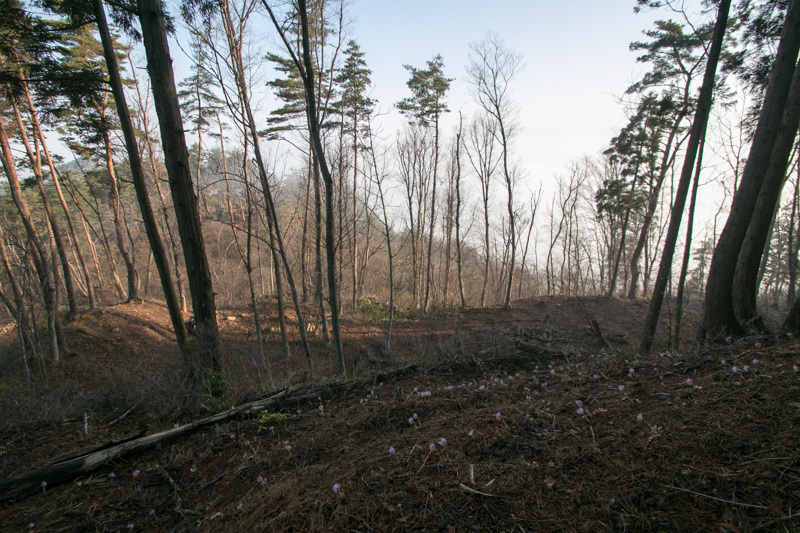 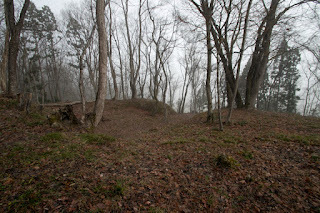 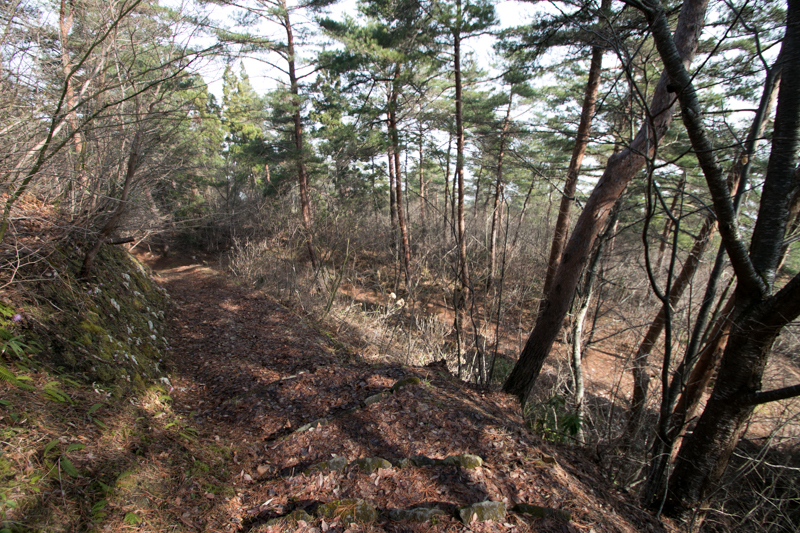 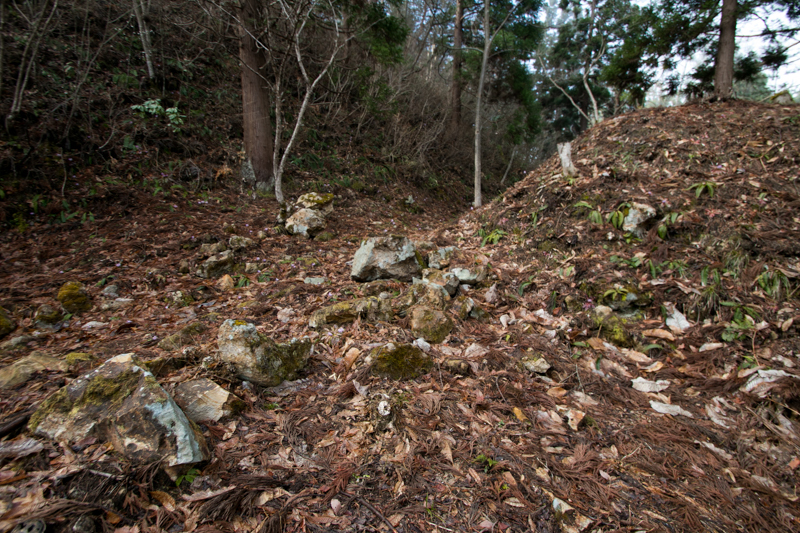 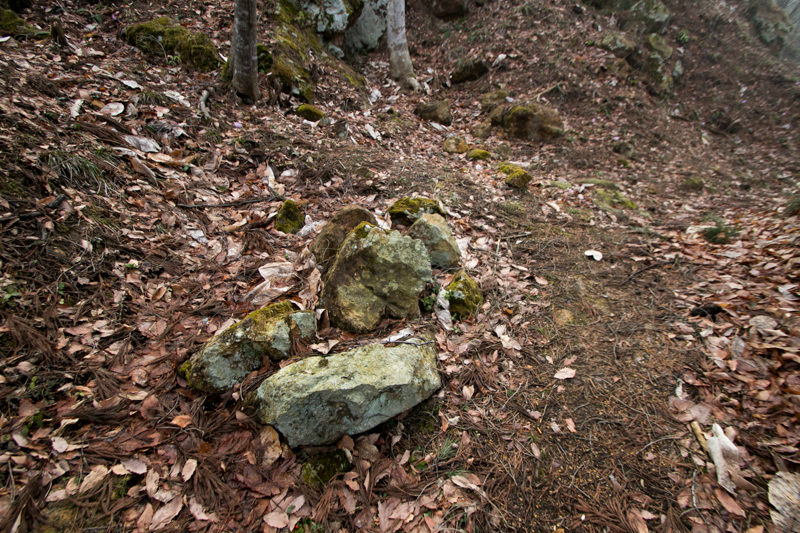 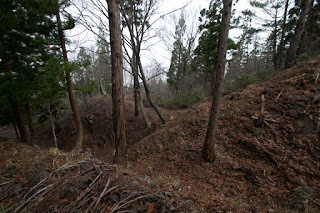 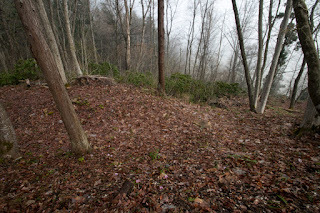 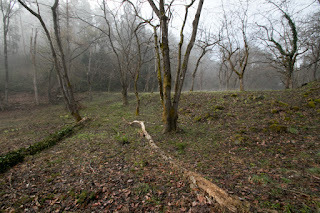 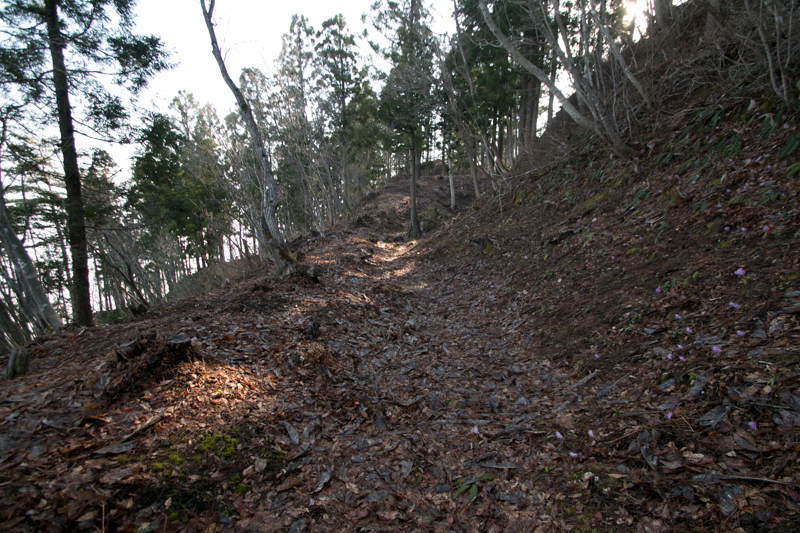 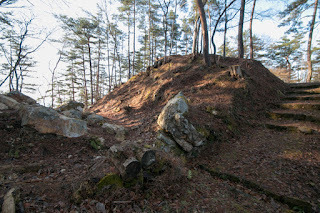 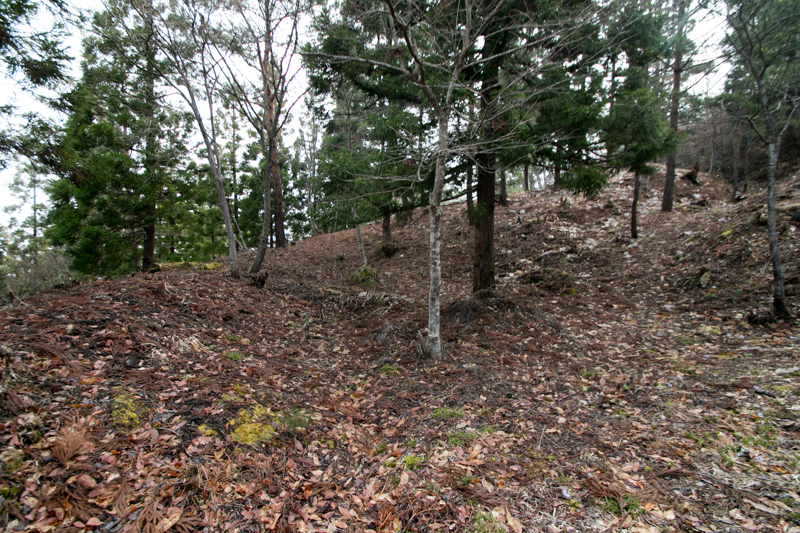 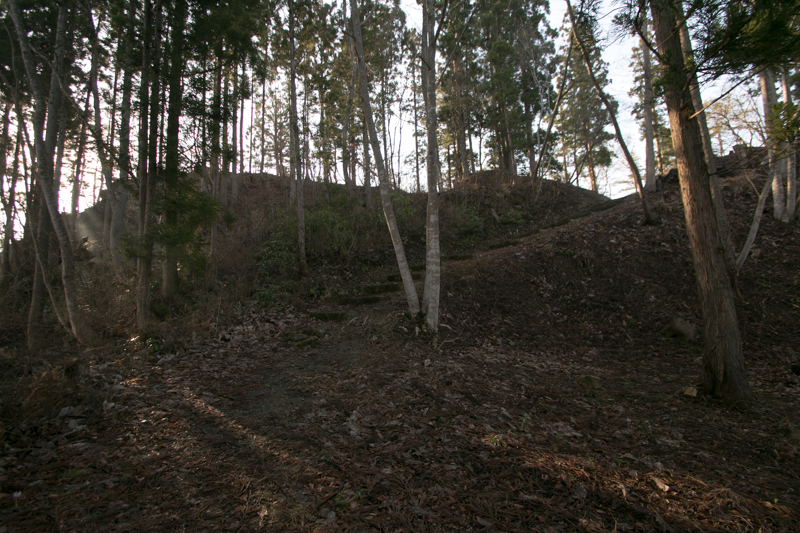 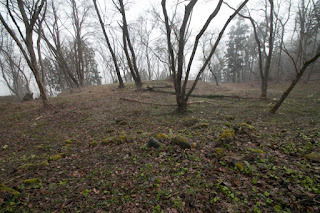 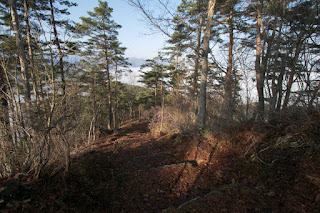 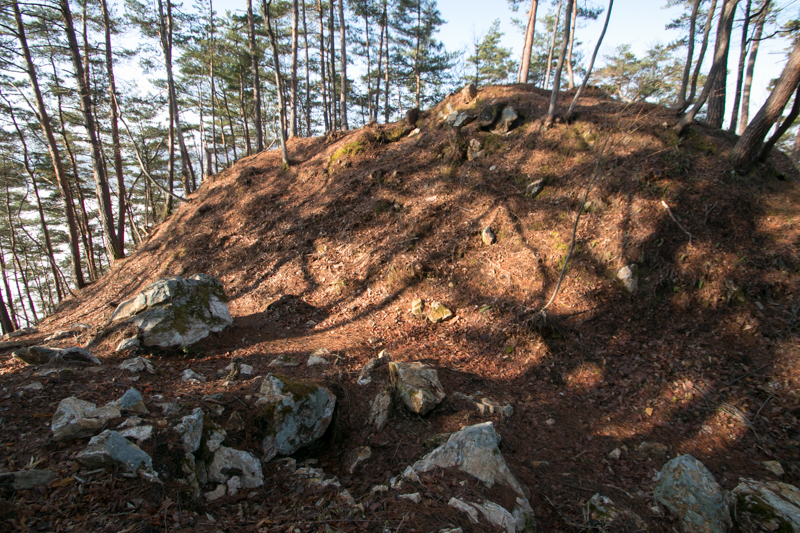 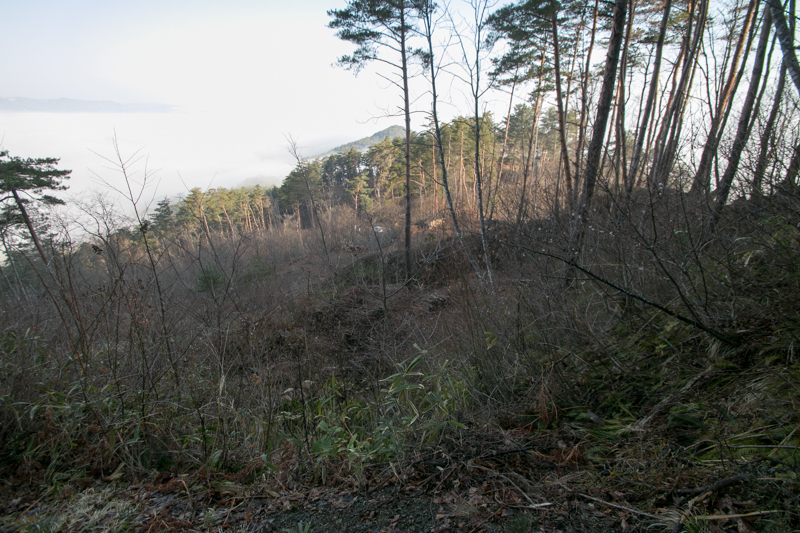 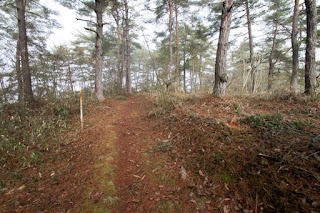 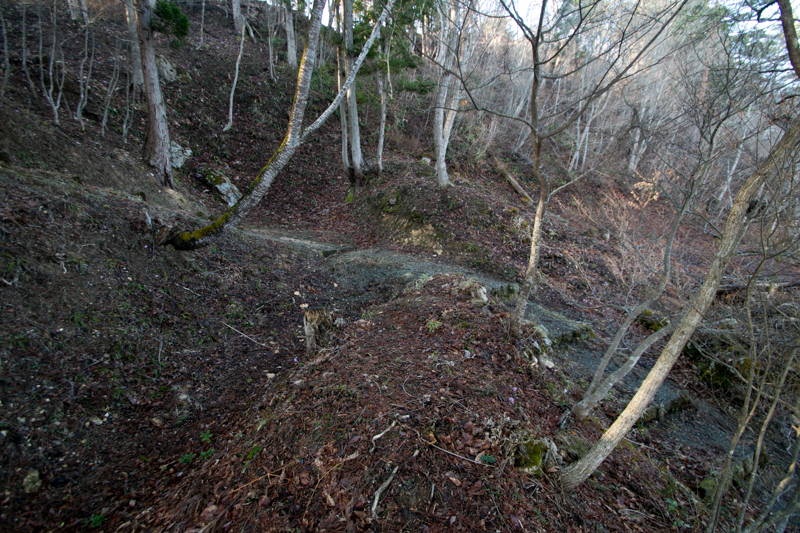 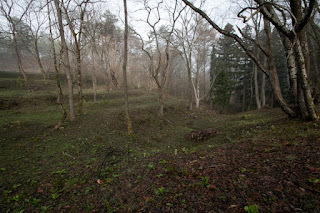 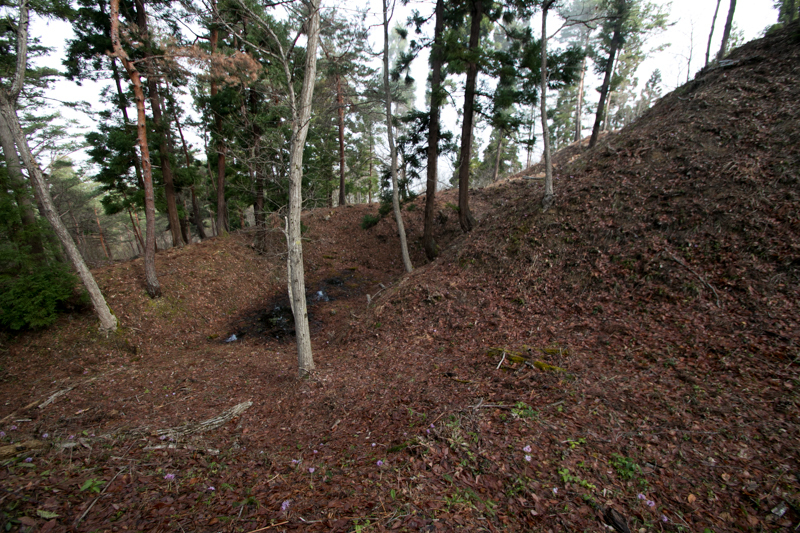 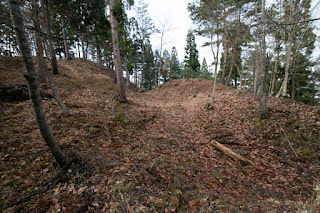 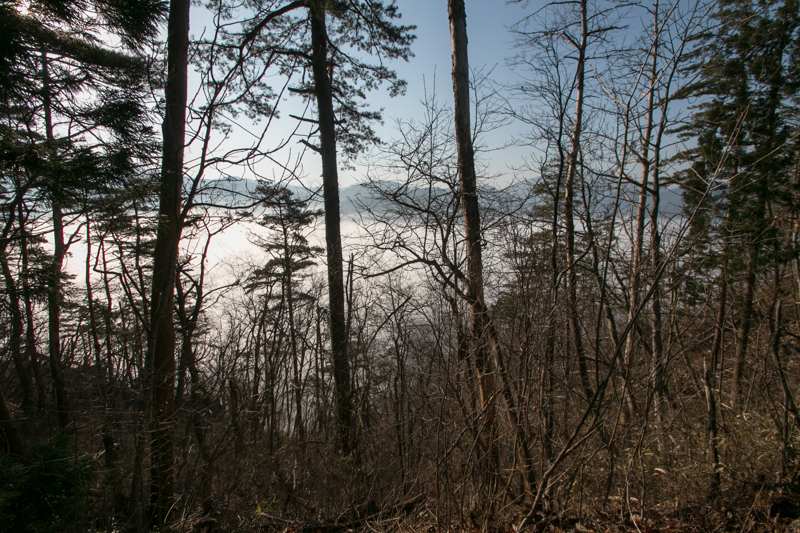 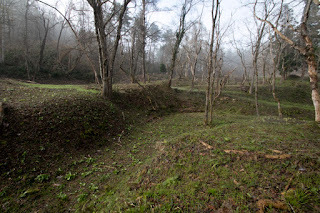 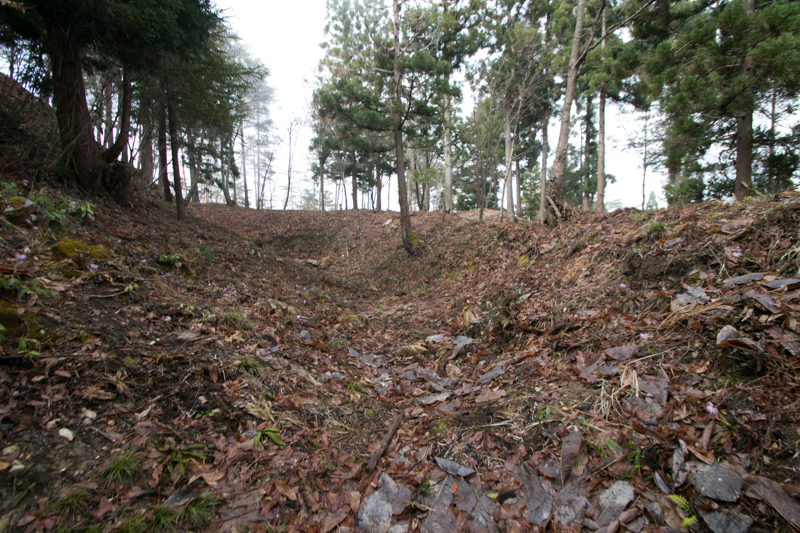 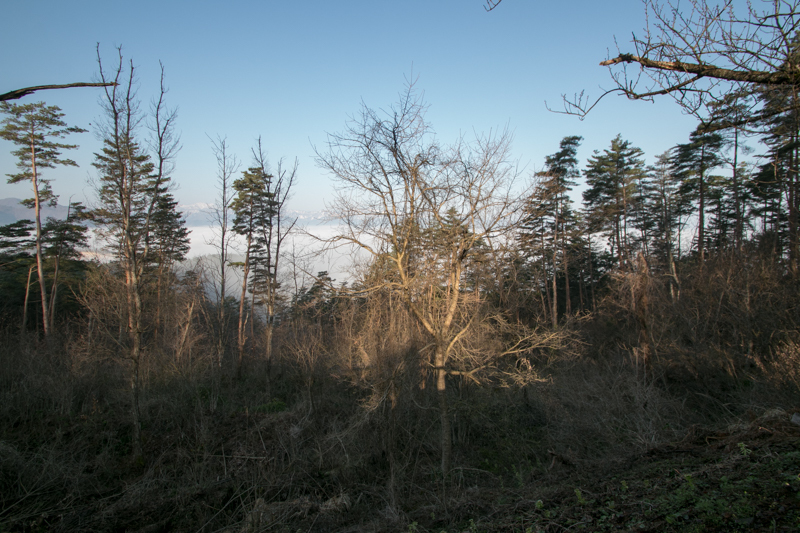 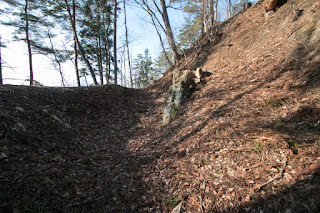 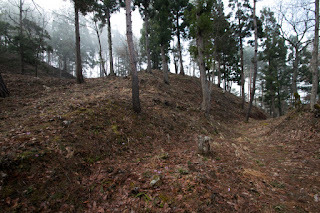 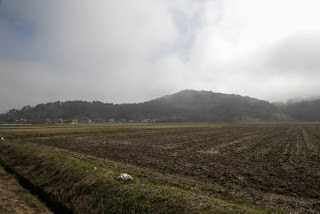 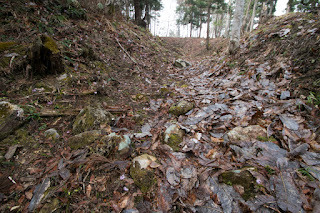 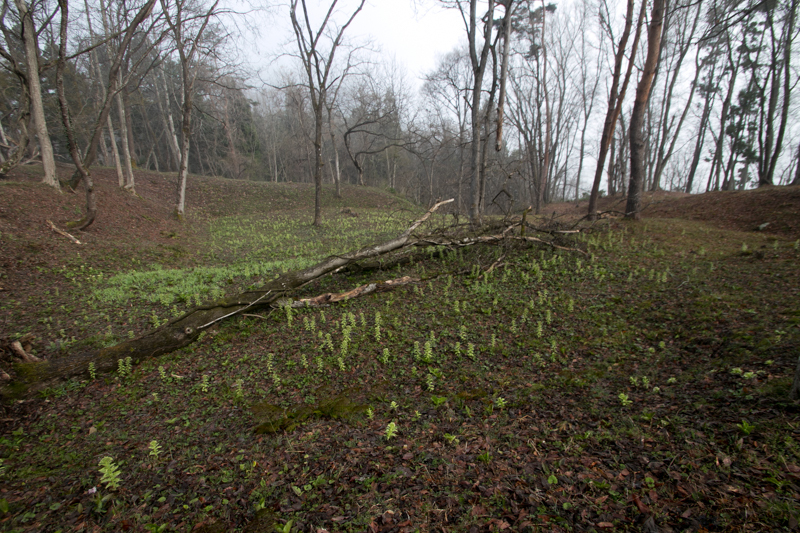 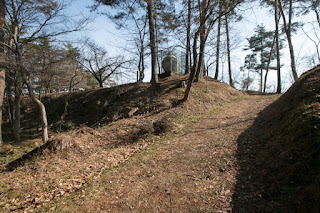 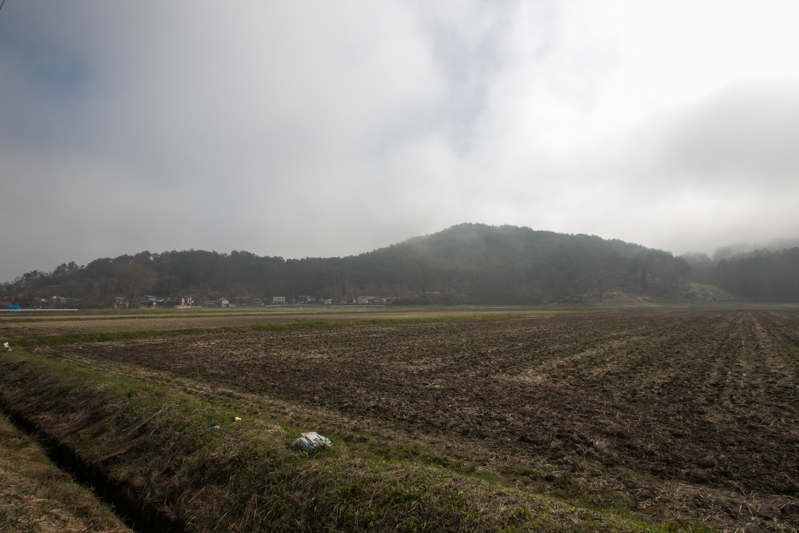 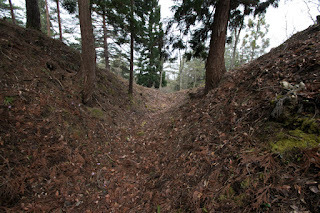 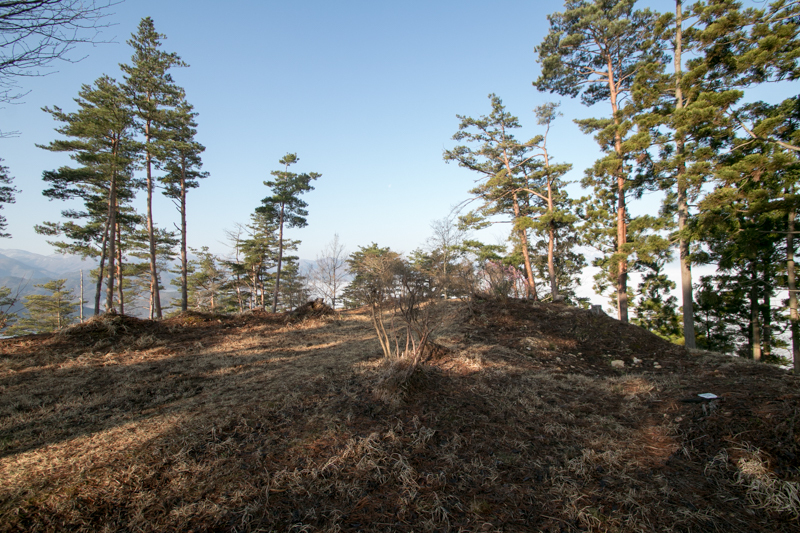 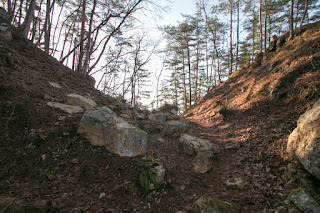 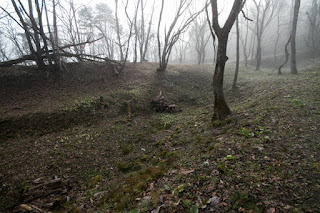 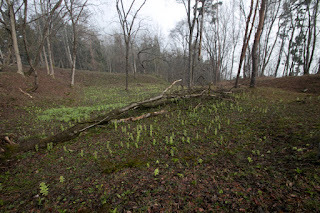 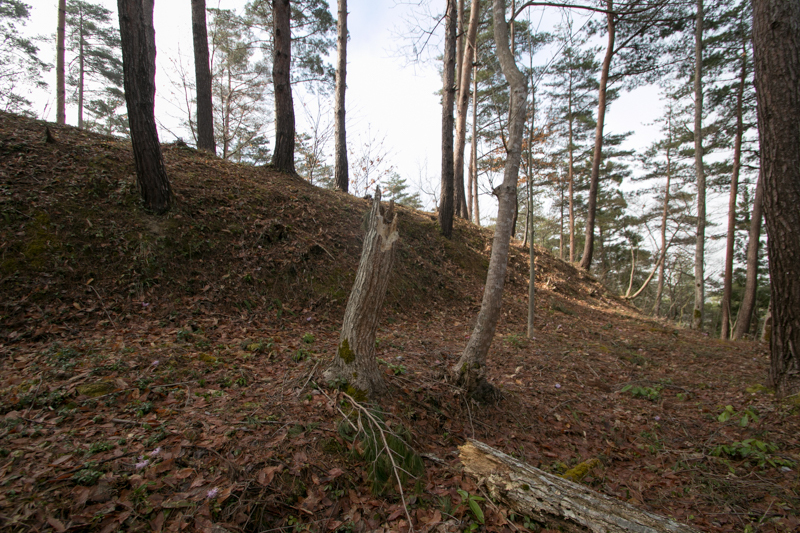 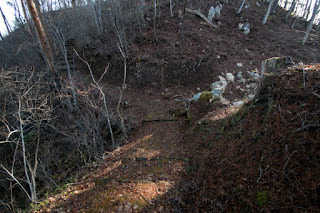 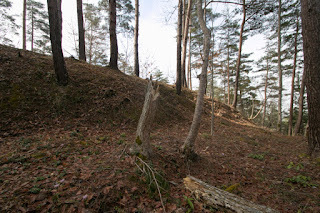 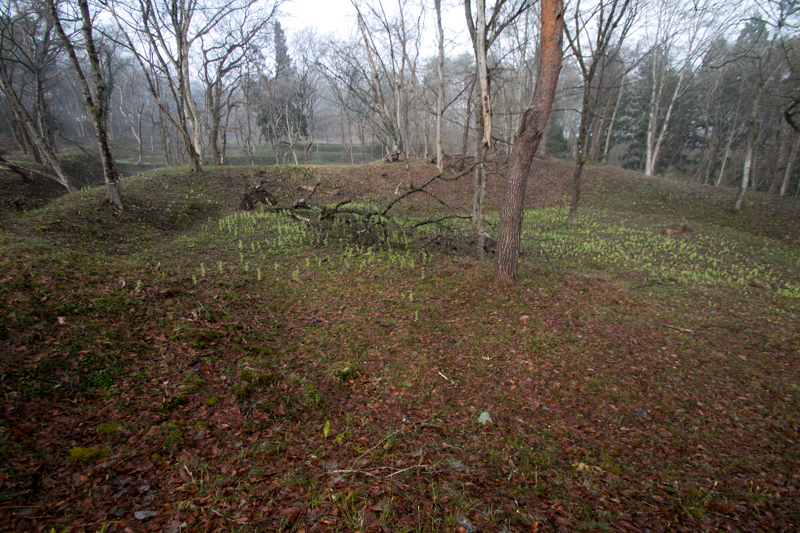 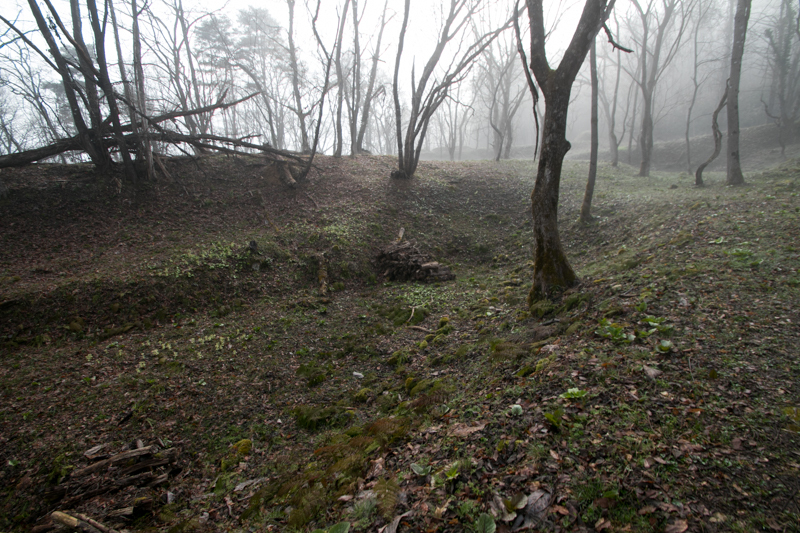 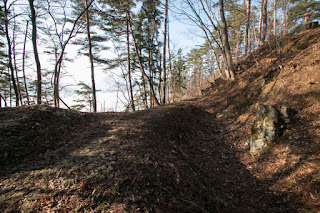 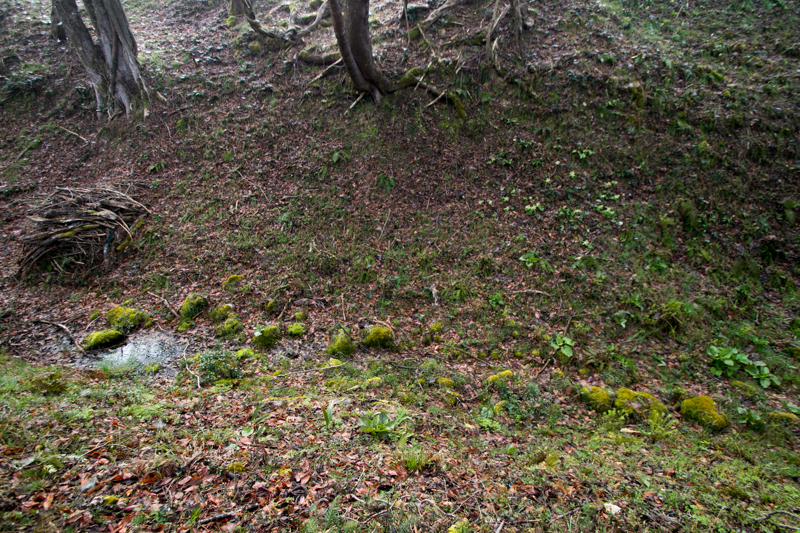 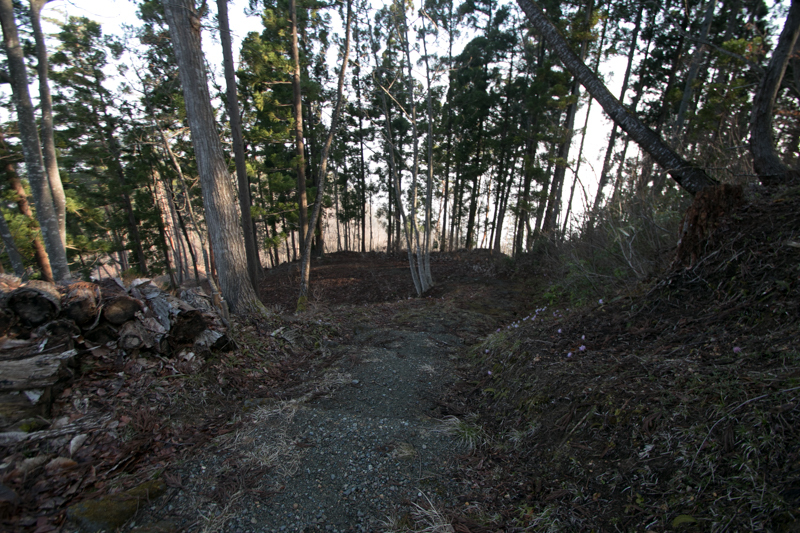 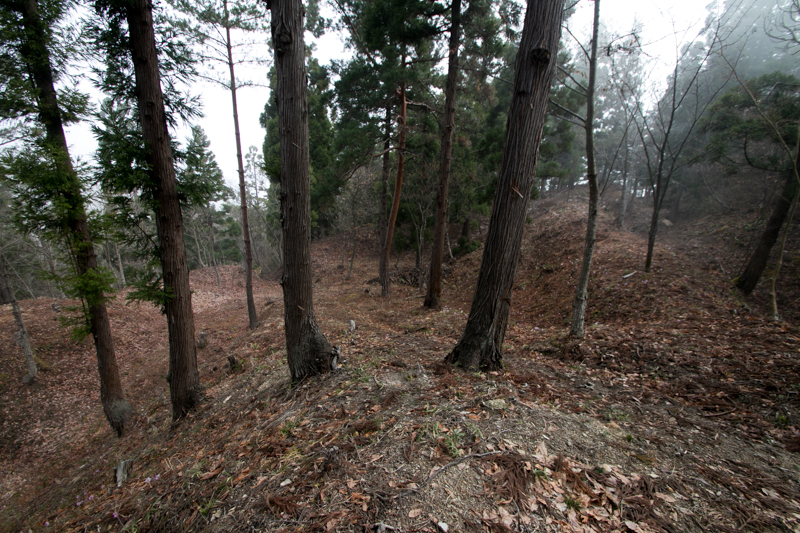 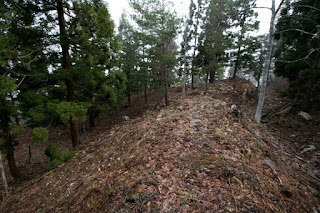 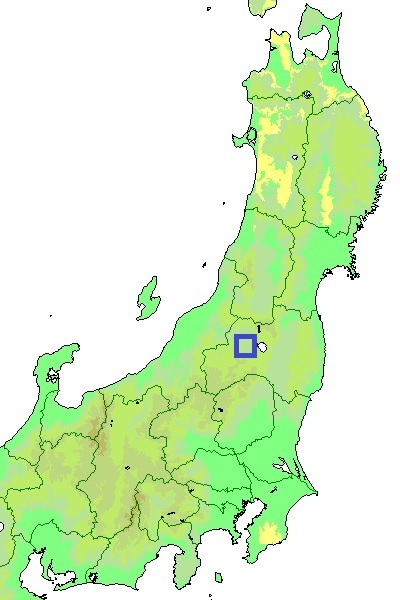 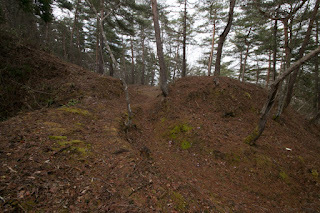 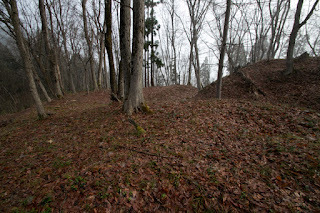 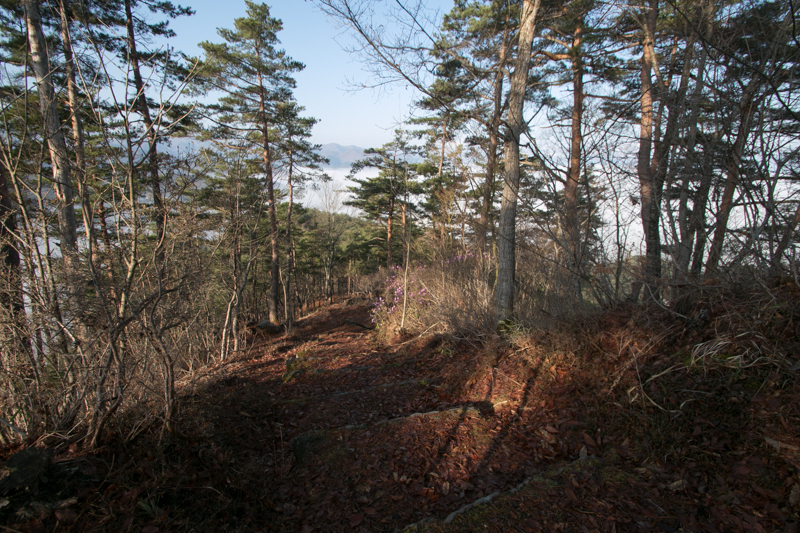 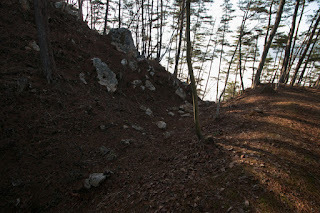 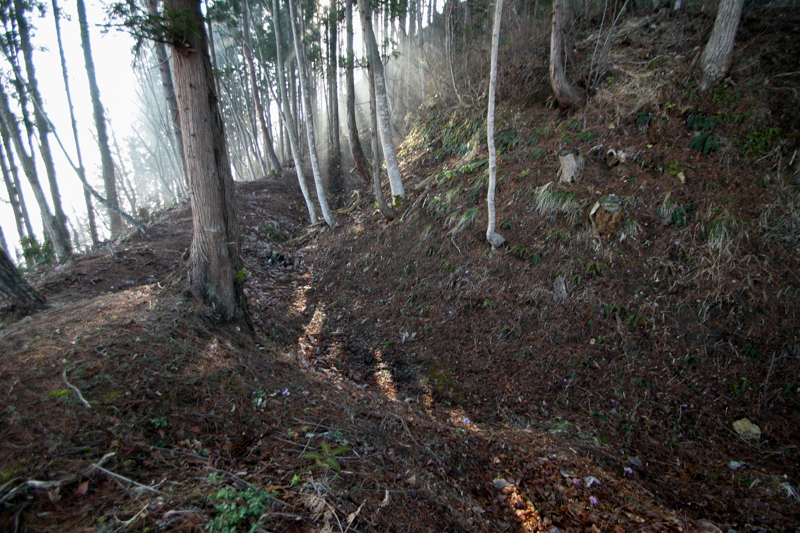 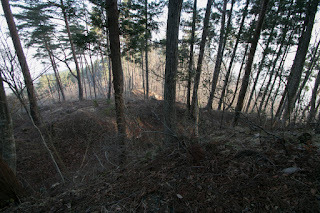 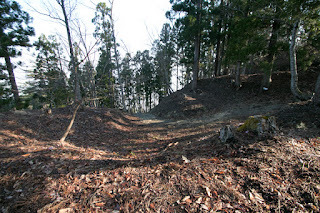 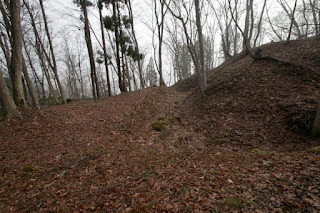 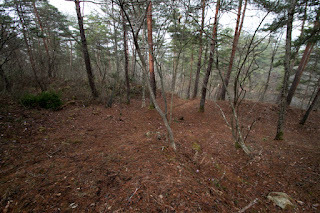 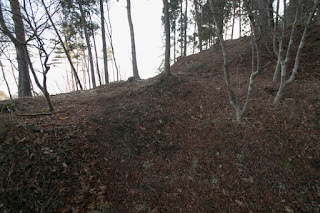 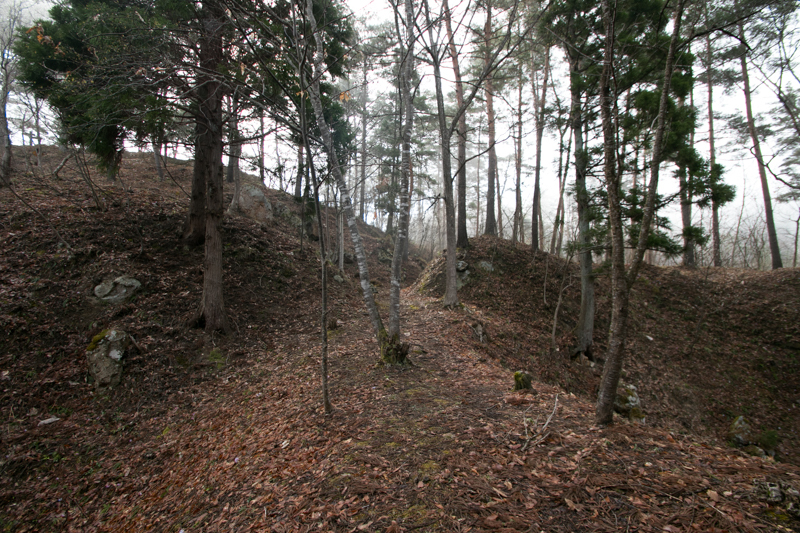 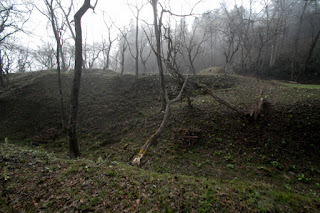 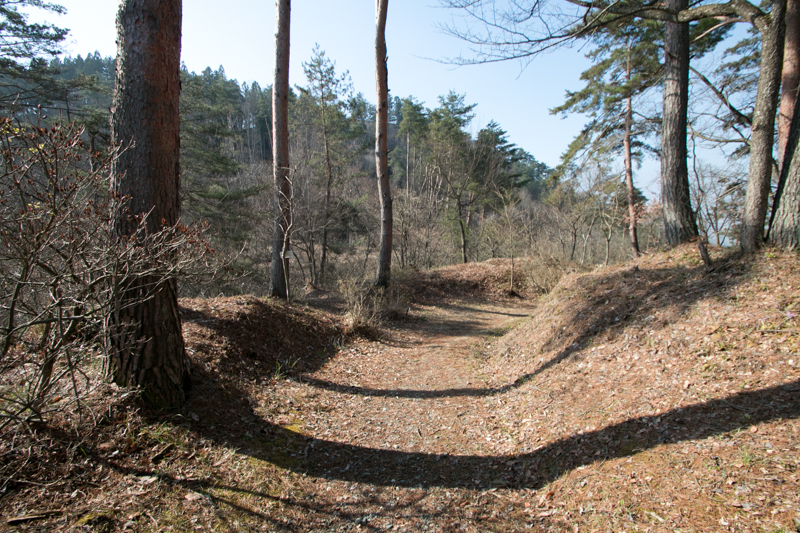 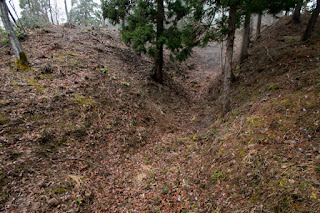 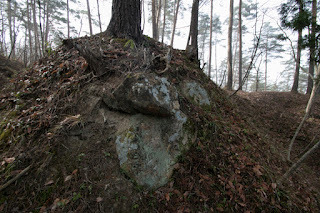 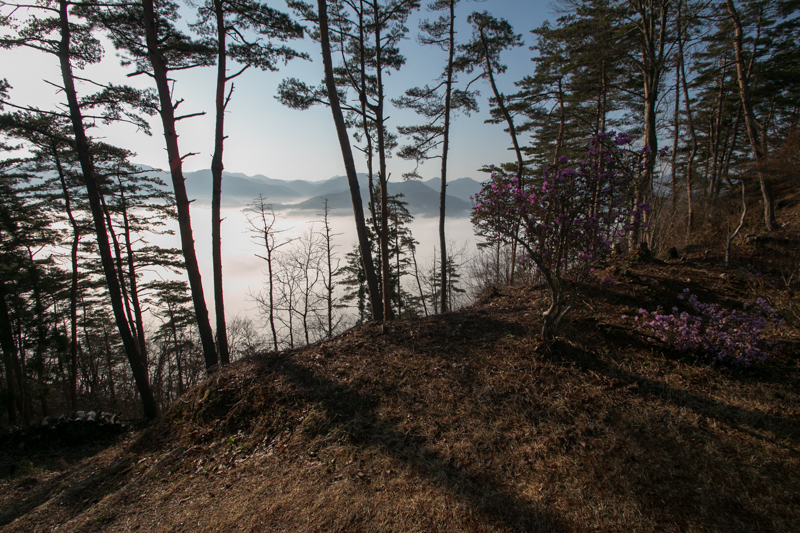 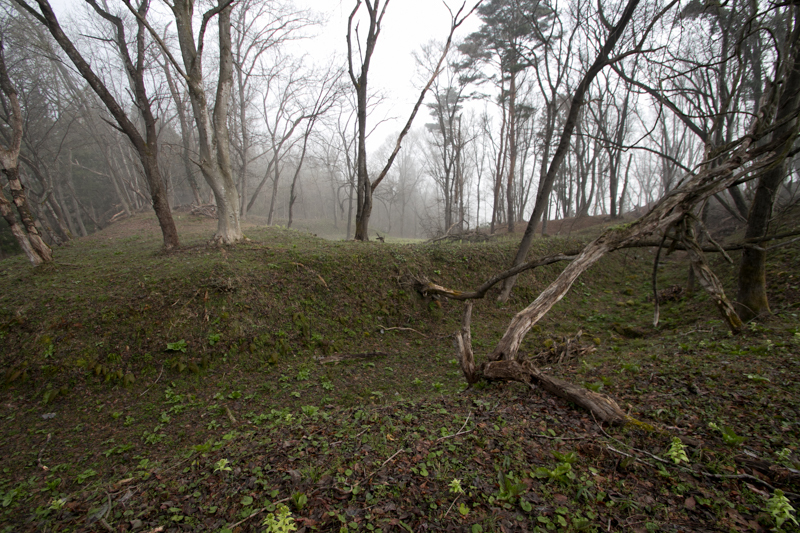 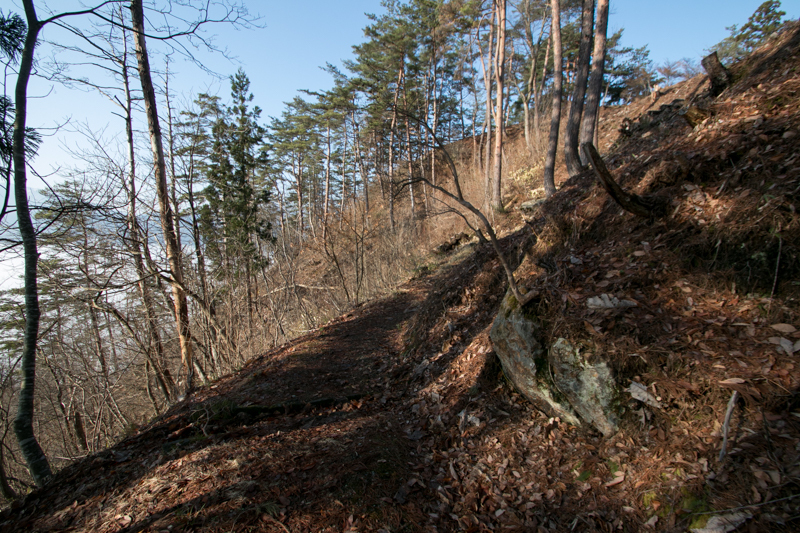 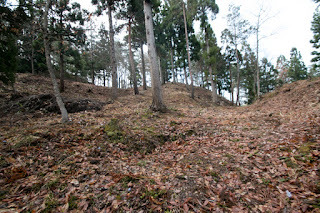 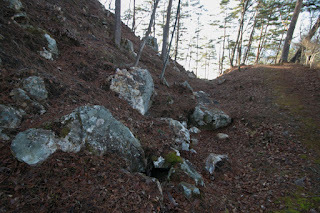 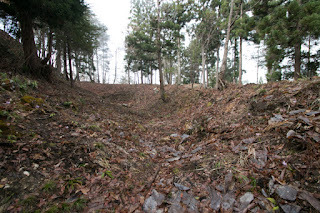 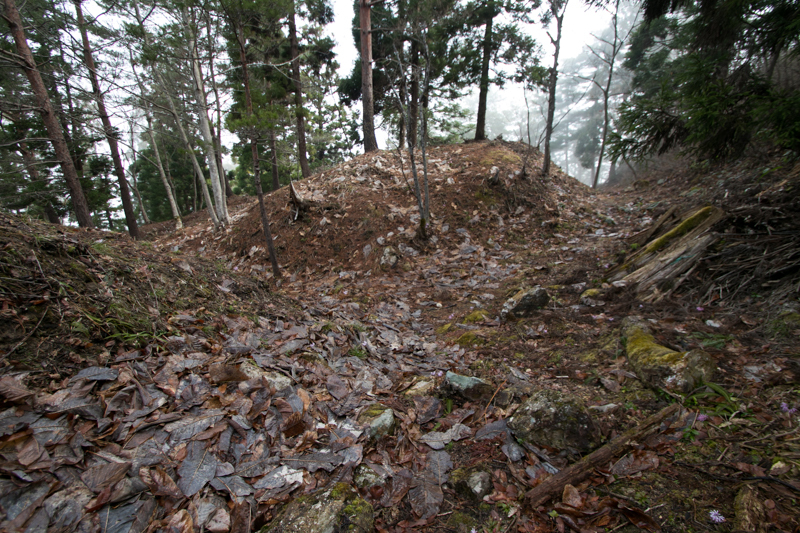 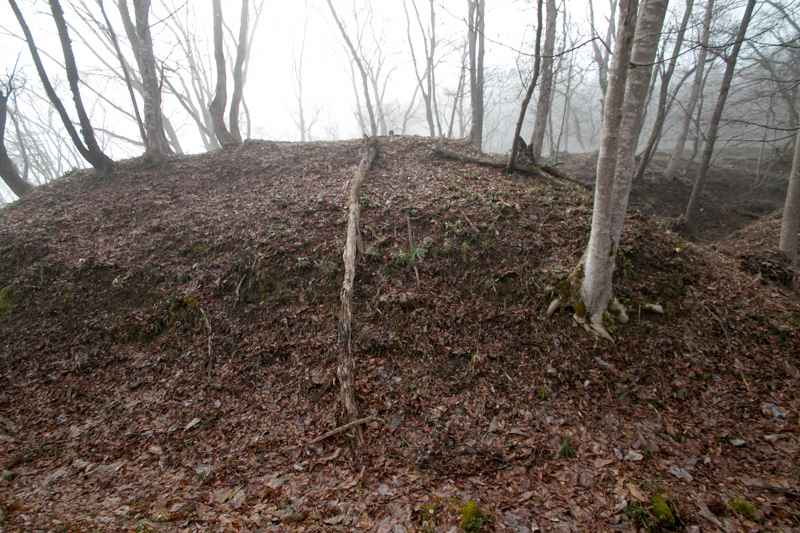 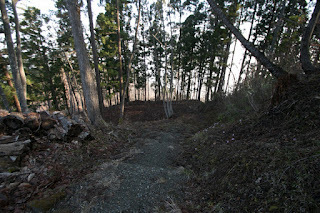 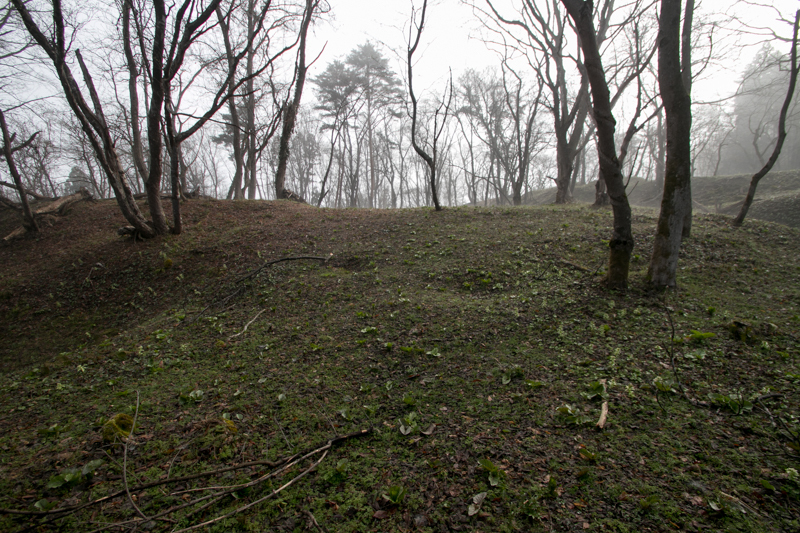 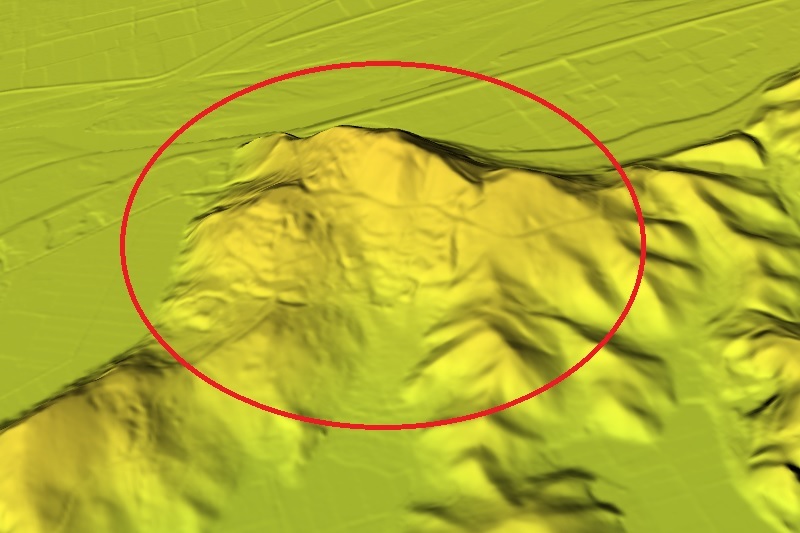 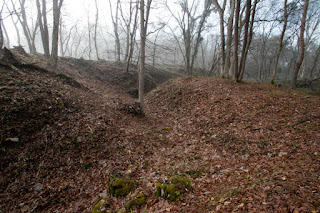 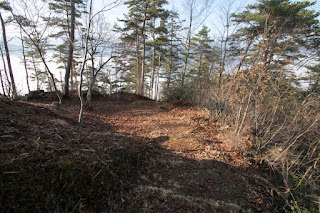 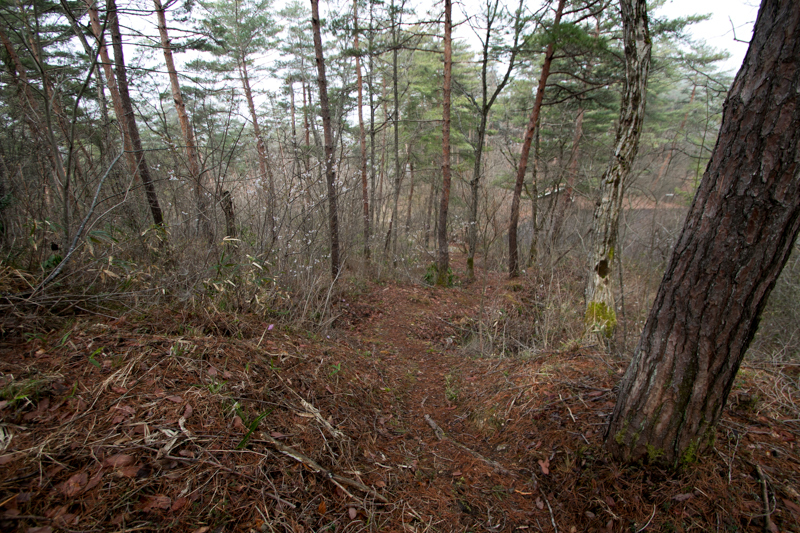 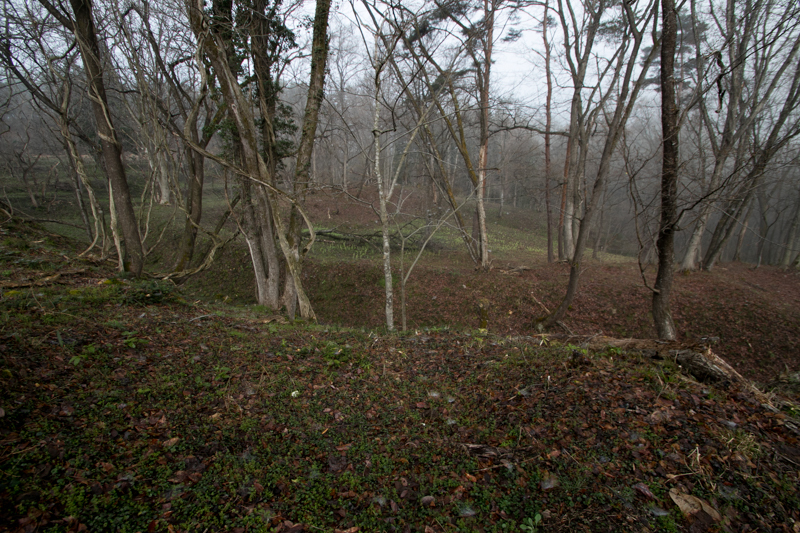 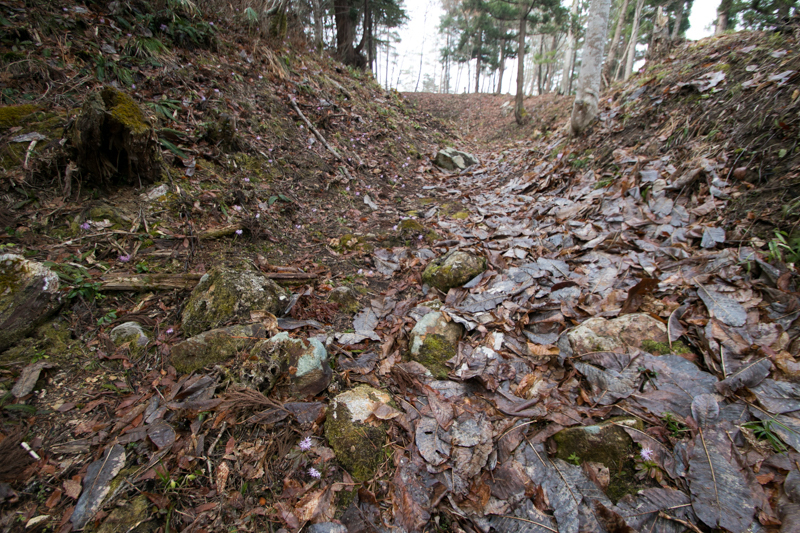 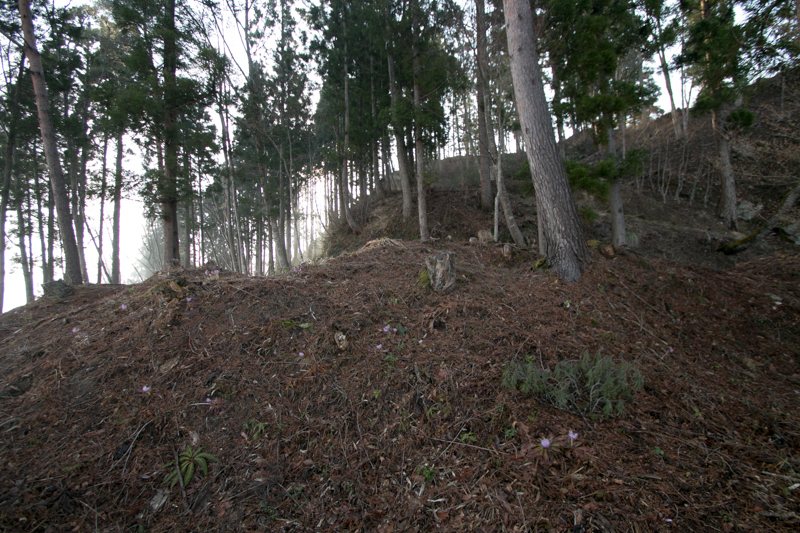 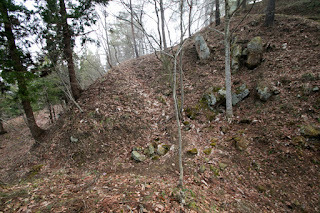 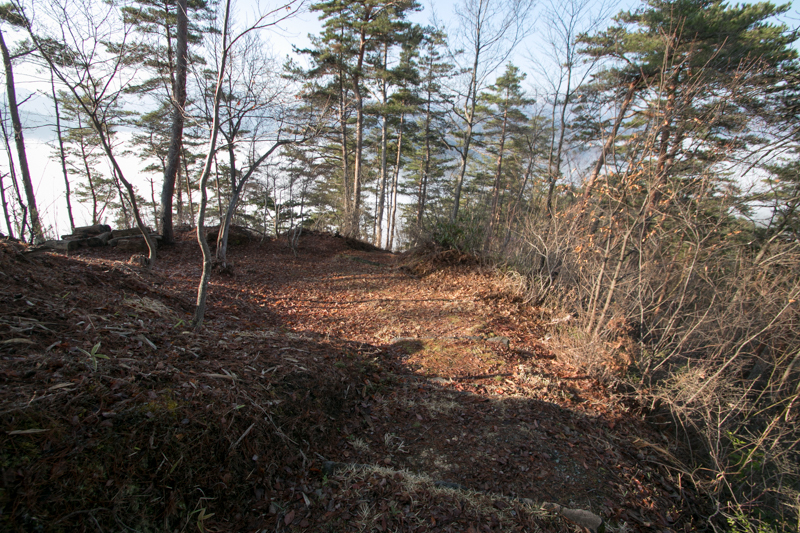 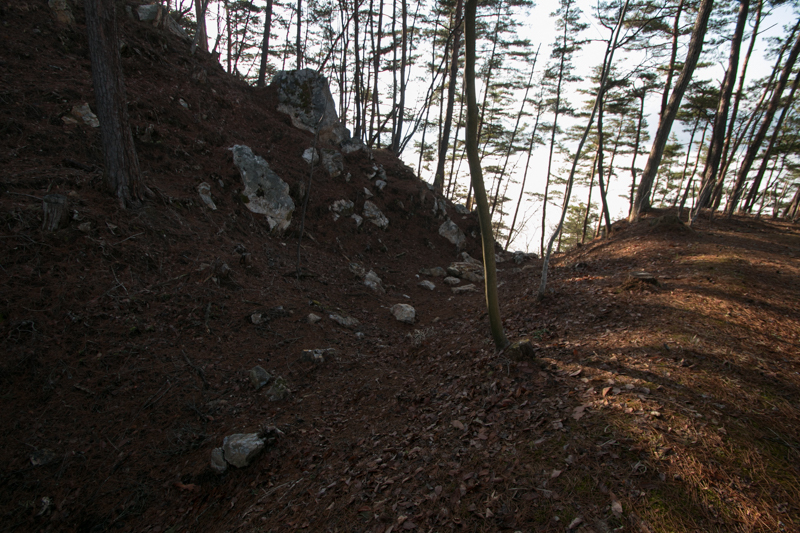 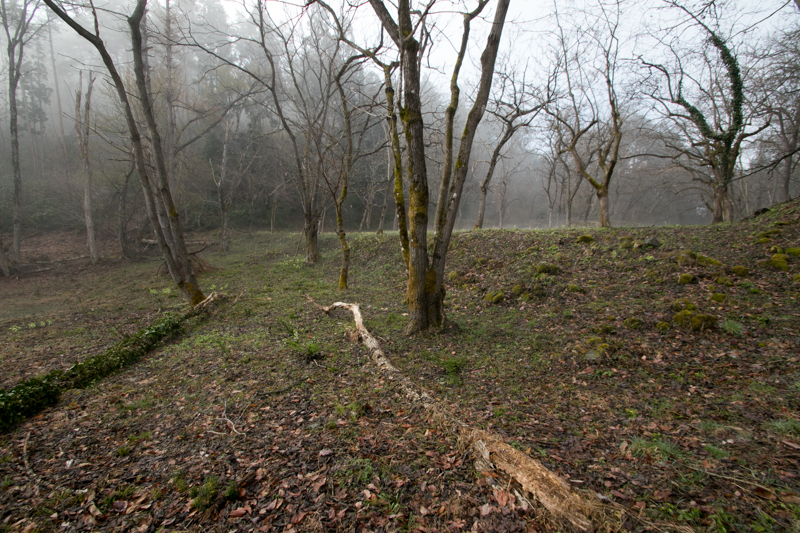 The site of the castle is south edge of Aizu basin, and connecting point to Southern Aizu mountanious area and Shirakara area along with Agagawa river. So called five largest medieval mountain castles (Kasugayama castle in Niigata prefeture, Nanao castle in Ishikawa prefecture, Odani castle and Kannonji castle in Shiga prefecture and Gassan Toda castle in Shimane prefecture) spread from central and Western Japan, due to the centralization of the authority of each lord and advanced technology. 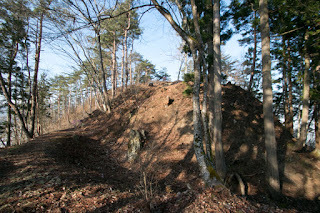 But Iwasaki castle is equivalent to these mountain castles in both size and technology, and might be the largest mountain castles in Eastern Japan. It is said that Mukaihaguroyama castle was built by Moriuji Ashina (1521-1580), the warlord of Aizu region (western part of Fukushima prefecture) from 1561 to 1569, for the purpose of his residence. 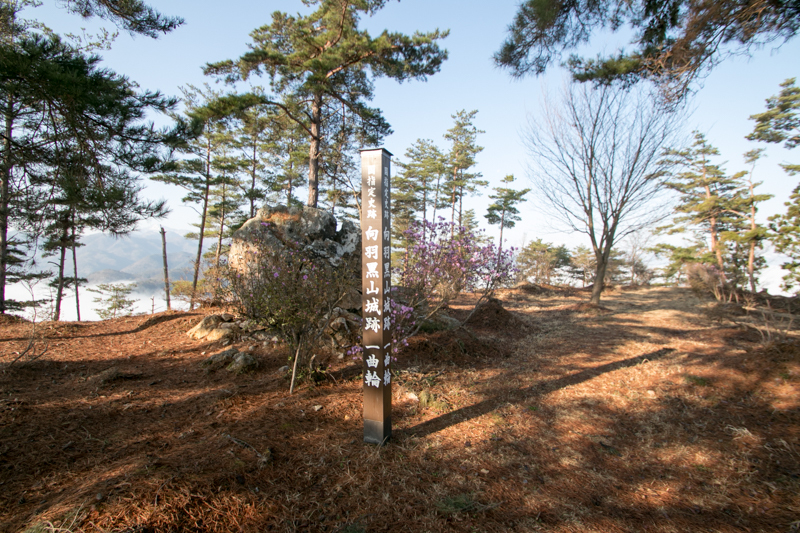 Ashina clan was originally local small clan, but started to expand their territory from the latter half of 15th century. Ashina clan once subordinated to Date clan, a warlord of Yonezawa basin, but Morimobu Ashina (1521-1580) utilized internal conflict of Date clan and grew his power, and later left Date clan and became independent power. 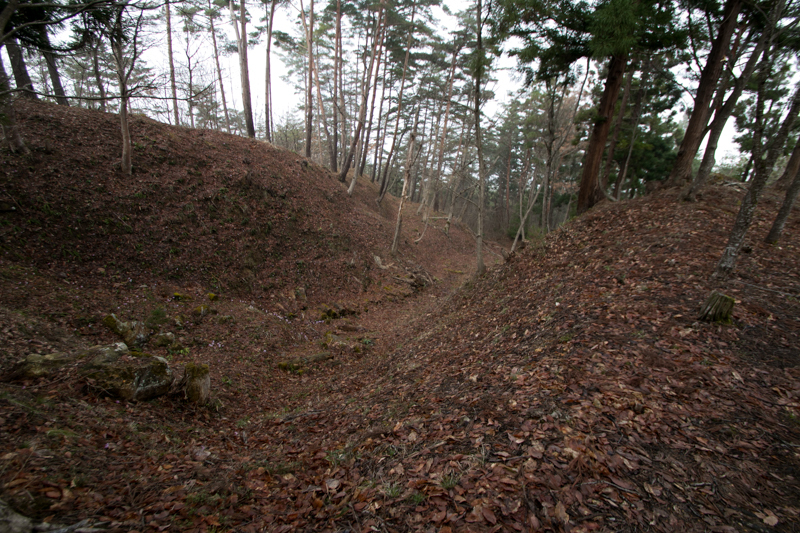 Moriuji brought mercantile policy to his aizu wakamatsu city, and aggressively fought with surrounding lords. 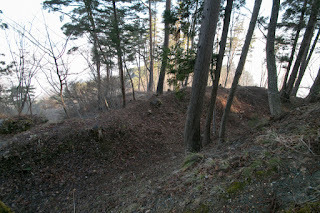 Moriuji expanded his territory to Nakadori area such as Nihonmatsu castle or Shirakawa castle, and also fought with Uesugi clan, the warlord of Echigo country (Niigata prefecture). 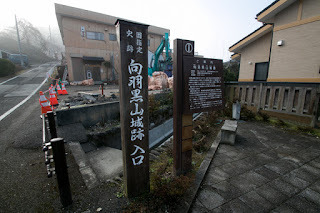 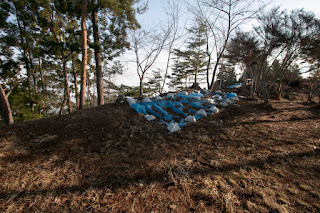 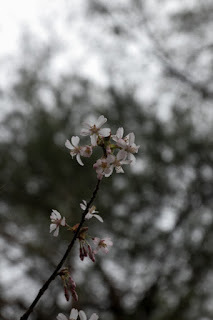 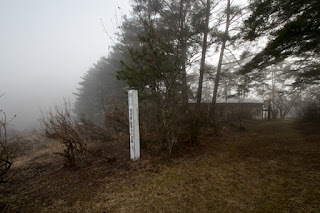 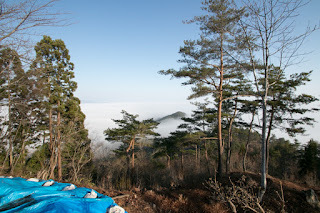 Moriuji temporally seized whole part of current Fukushima prefecture and became a powerful lord of this area. 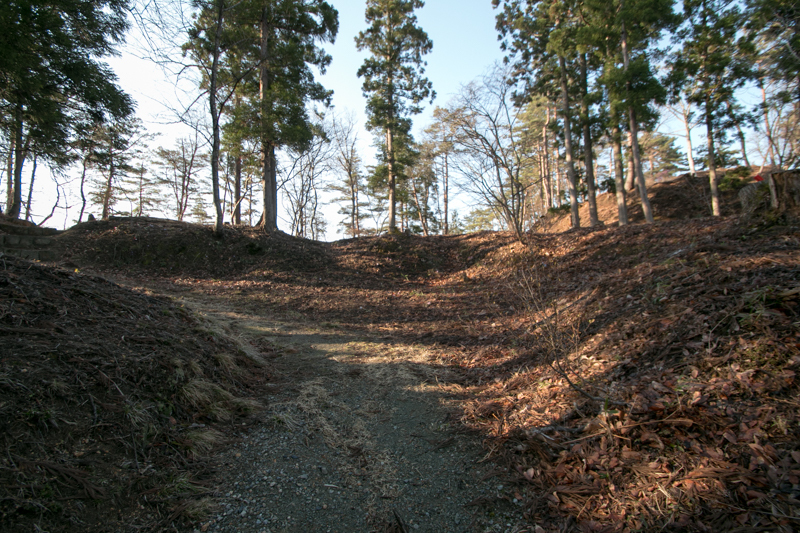 Residence of Ashina clan was originally Kurokawa castle (current Aizu Wakamatsu castle), but when Moriuji left leader position to his son Morioki Ashina (1547-1574), Moriuji left Kurokawa castle and newly built Mukaihaguroyama castle as his retirement place. Precise reason of construction is unknown but it might be built to guard Aizu basin from southward and also as a bridgehead to Shirakawa area. Although Moriuji left leader position to Morioki, this was only nominal one and Haruuji still had the authority in Ashina clan. 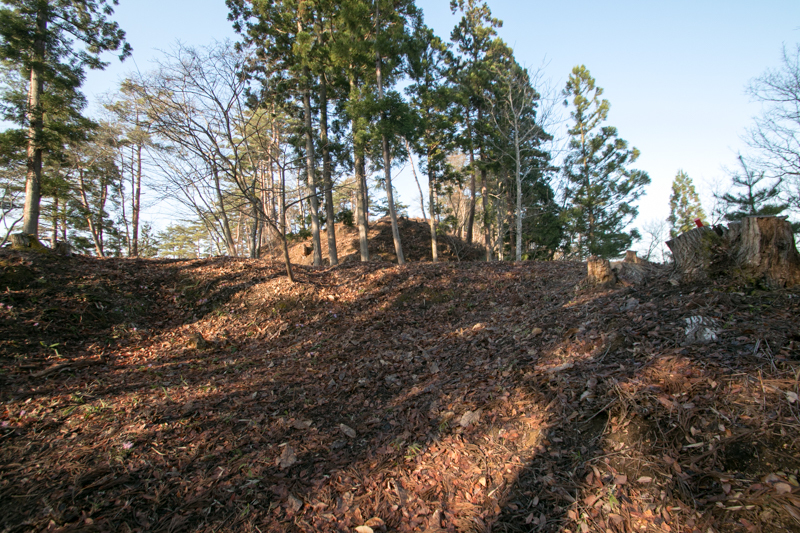 As a castle built at the peak of Ashina clan, Mukaihaguroyama castle is huge and functionally built. 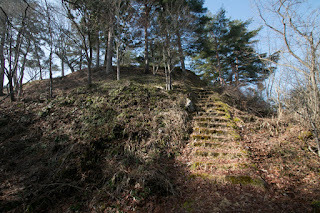 Total size of castle reached 600 meter square, and extremely huge as a castle of this period. 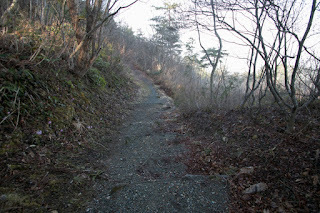 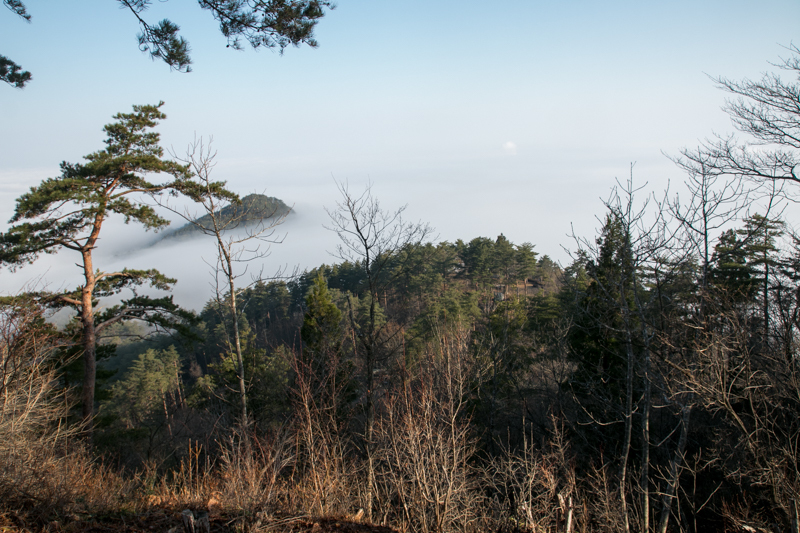 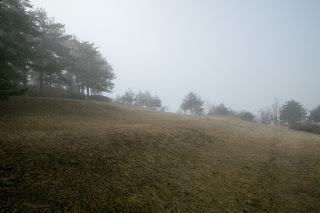 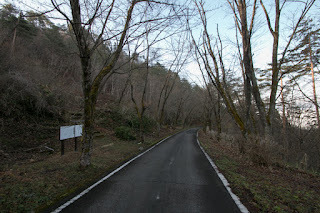 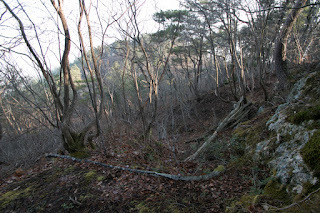 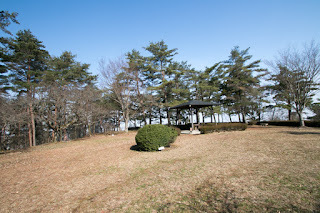 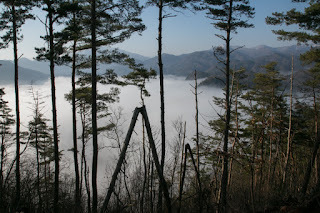 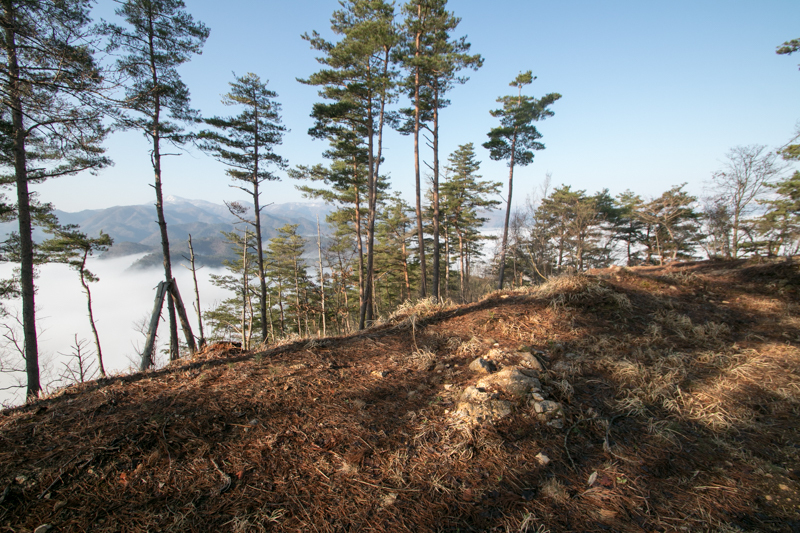 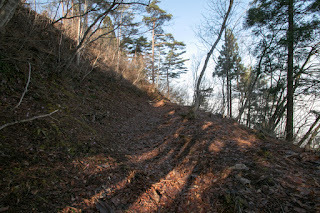 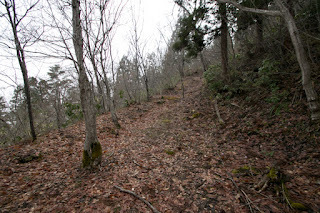 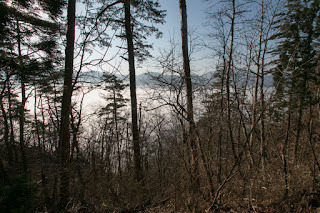 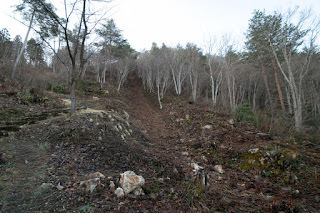 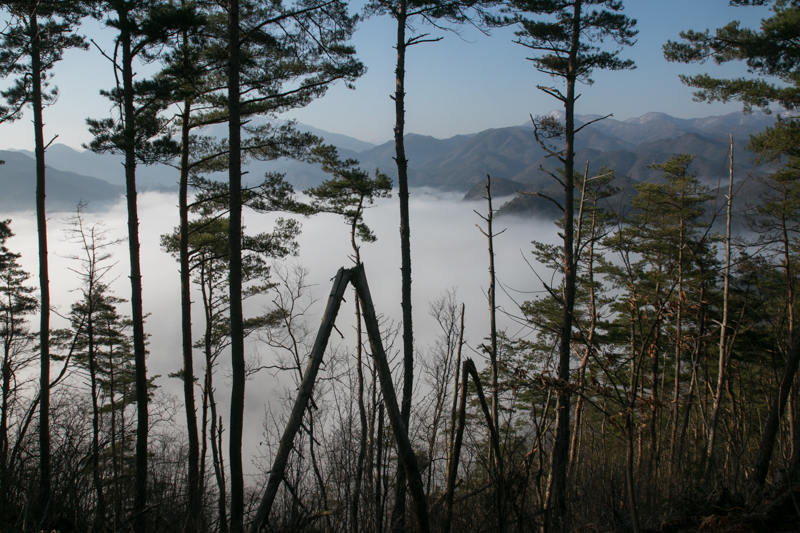 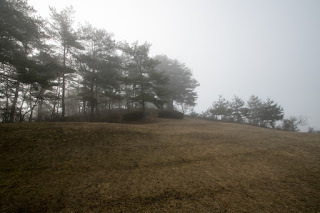 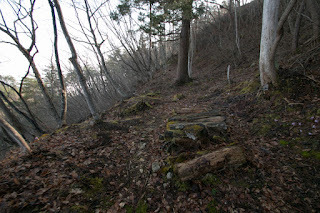 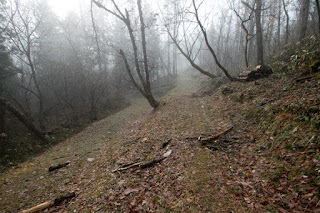 Iwasakiyama mountain consist of higher south peak and lower north peak connected by saddle point, and Mukaihaguroyama castle spreads all over the body of higher peak. 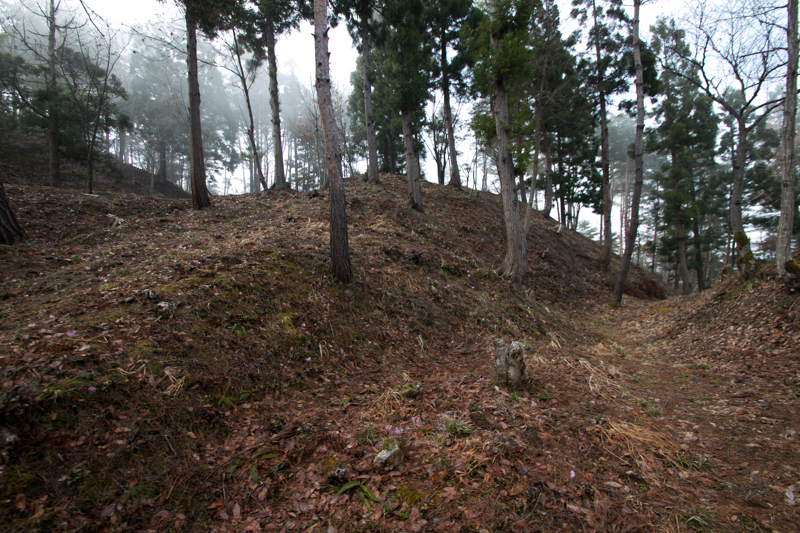 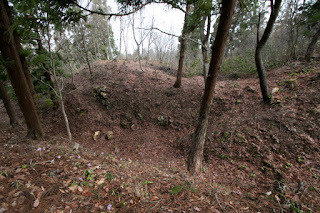 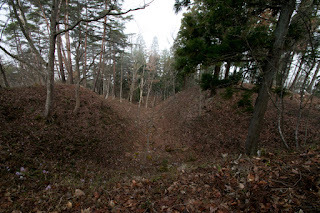 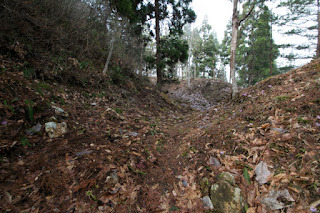 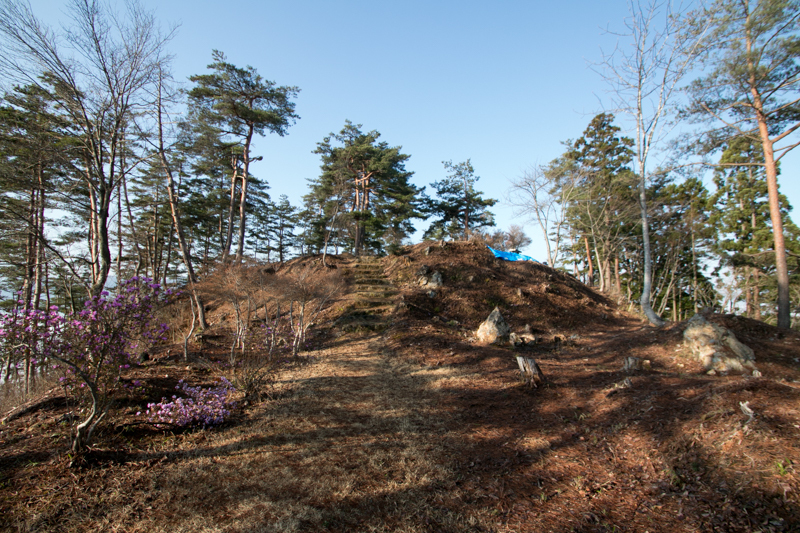 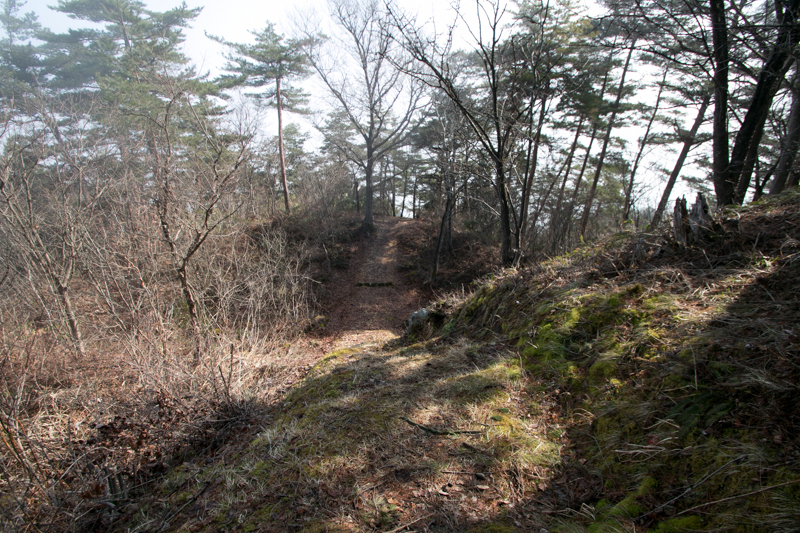 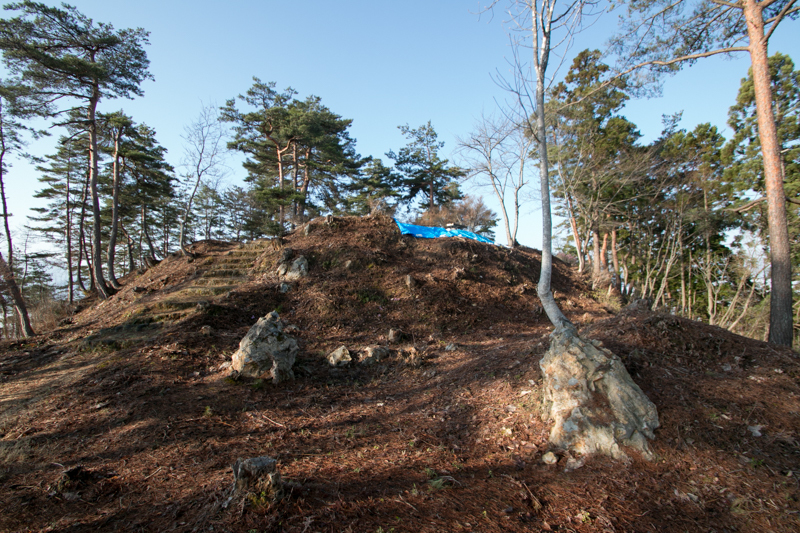 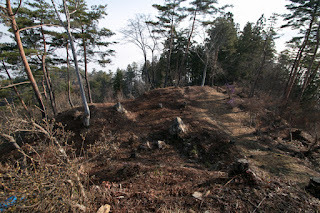 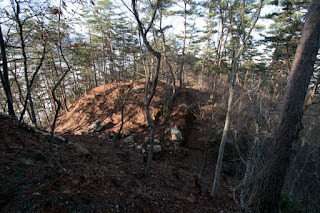 Roughly Mukaihaguroyama castle is divided into three parts, the main area at the peak, secondary area at the halfway and third area at the entrance area of saddle point. 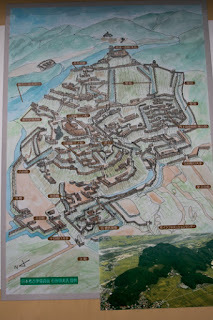 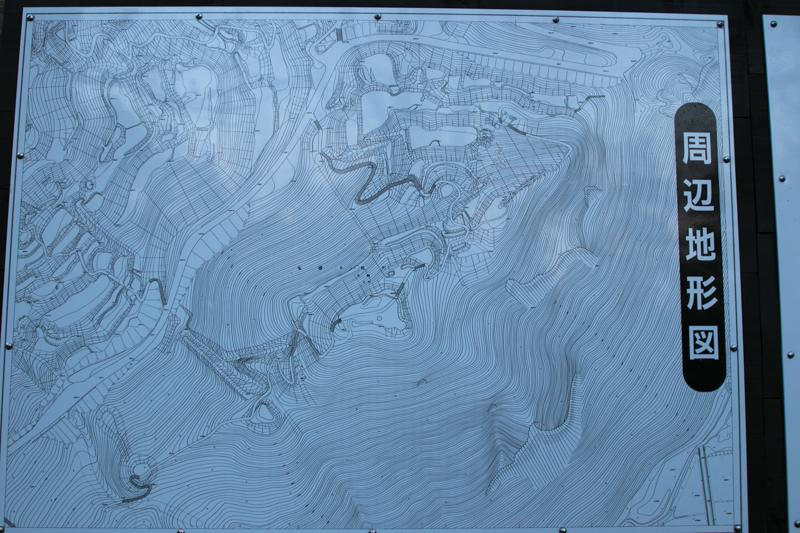 As the east side and south side was protected by river and cliff, areas of the castle spread north and west ward from its peak. 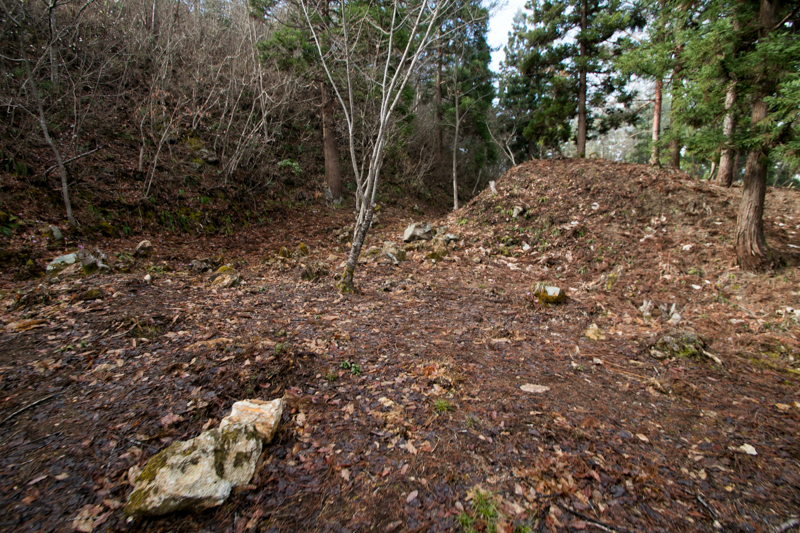 Main area might be built in old age and consist of long and narrow terraces. 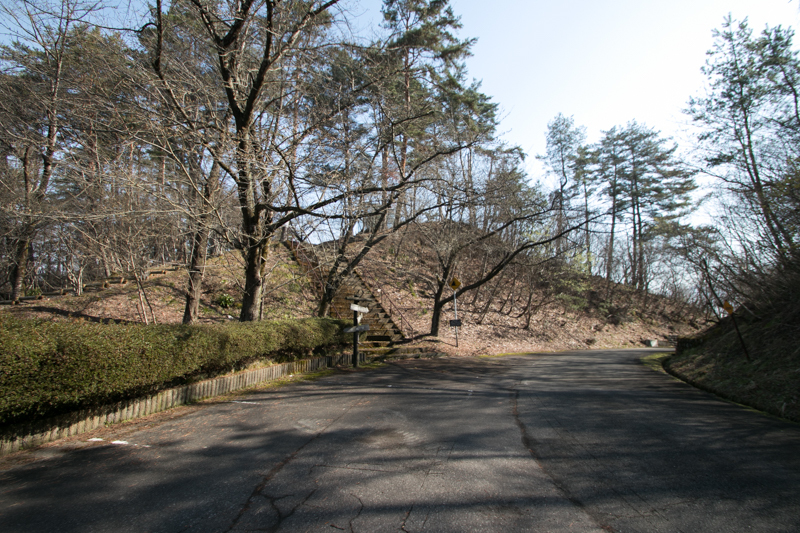 But the entrance of main area was protected by Masugata (composite gate) and horizontal wall, might be reformed in later period. 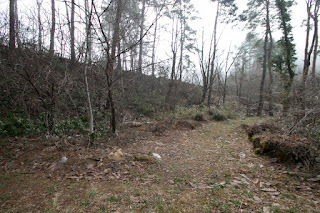 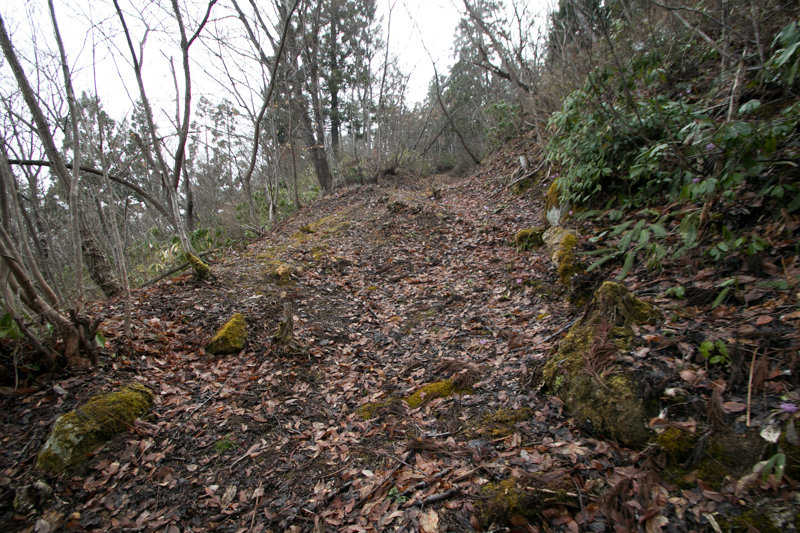 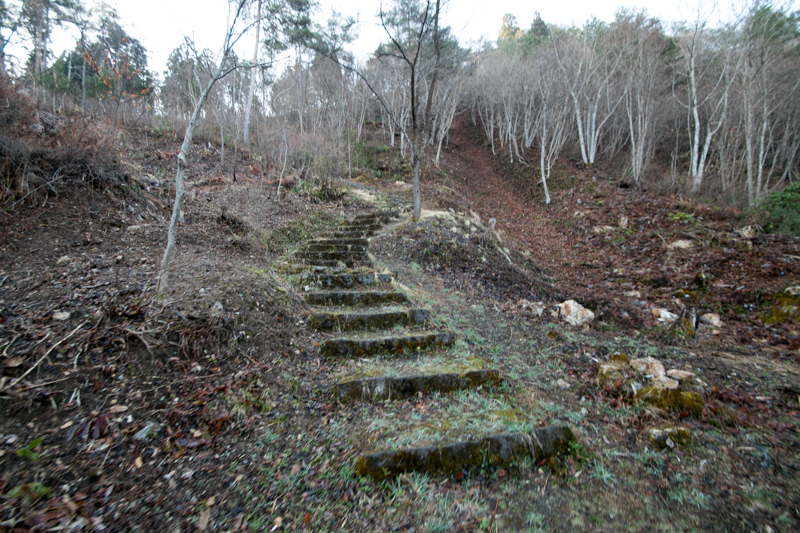 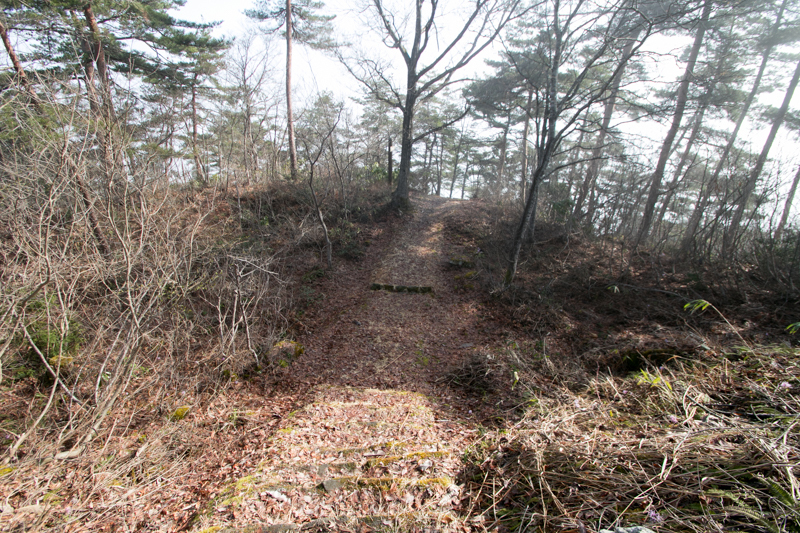 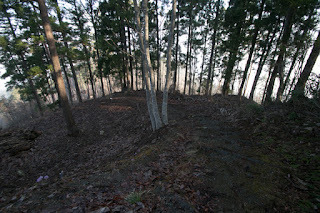 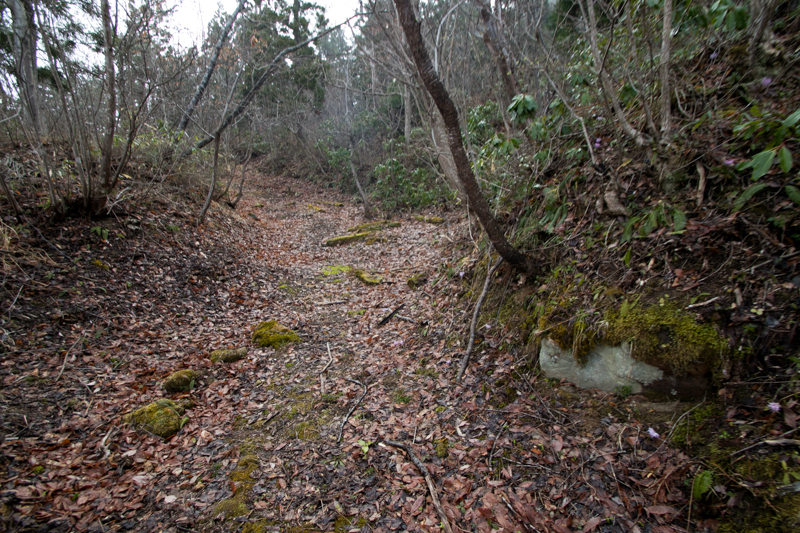 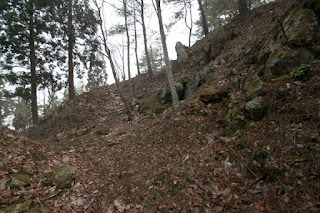 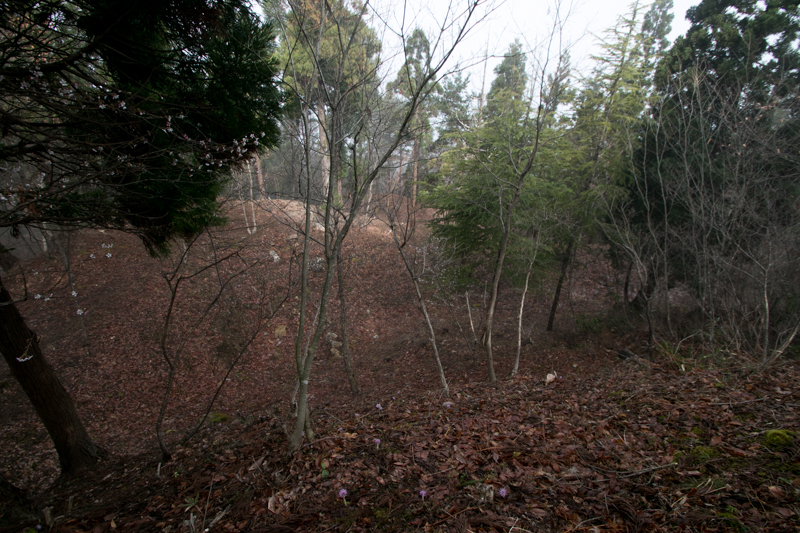 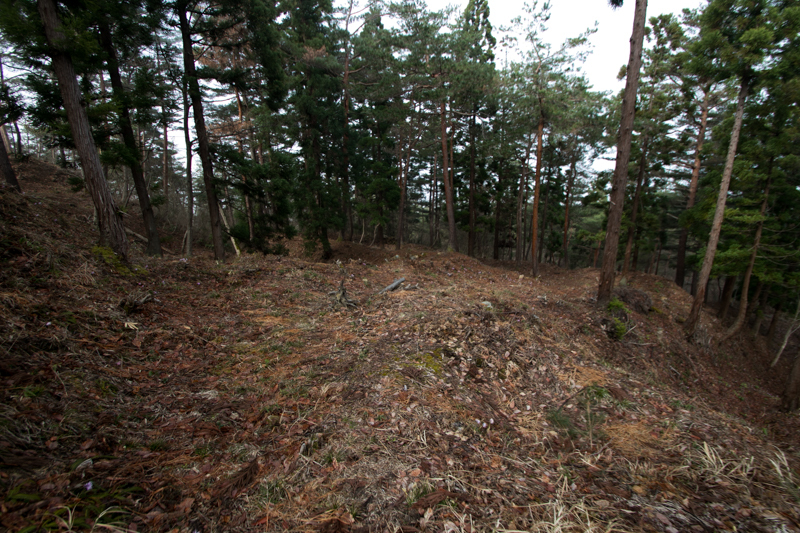 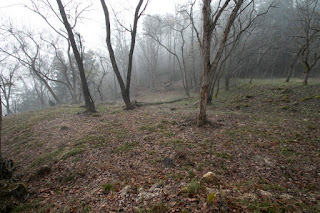 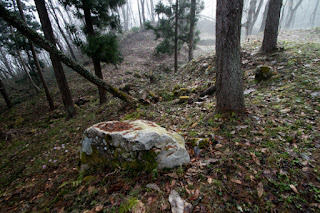 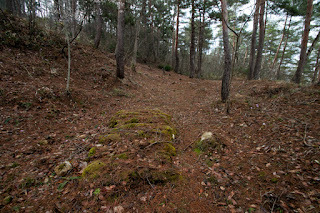 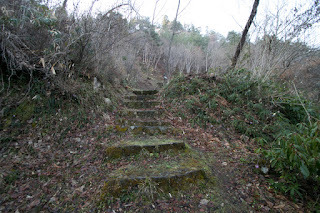 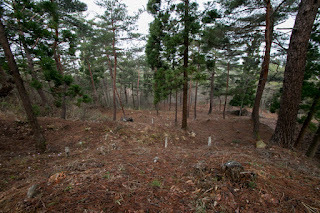 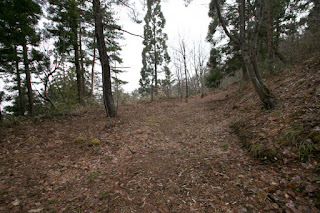 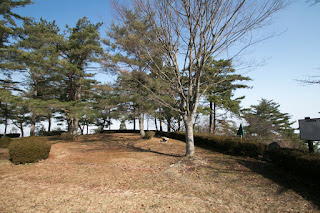 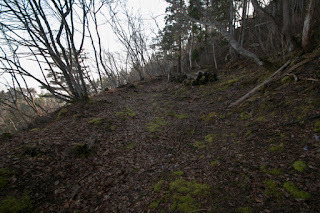 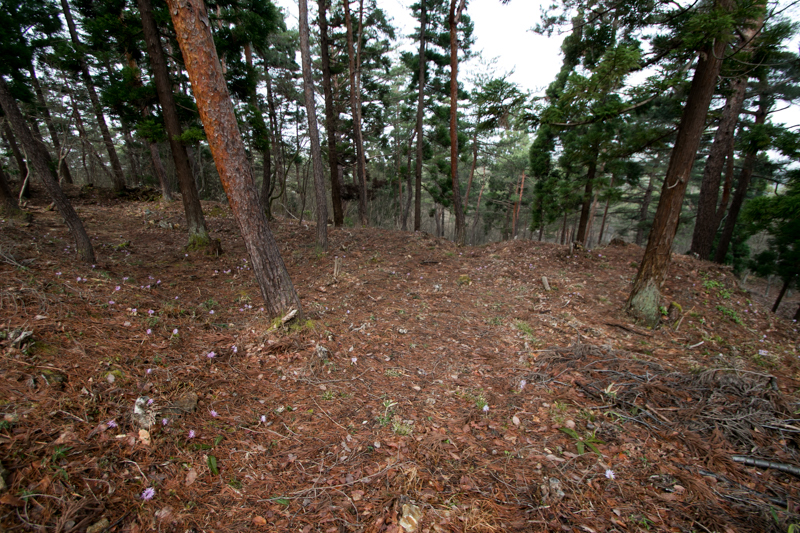 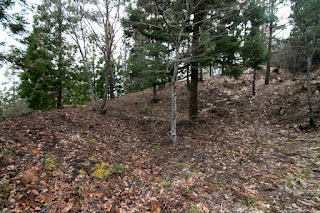 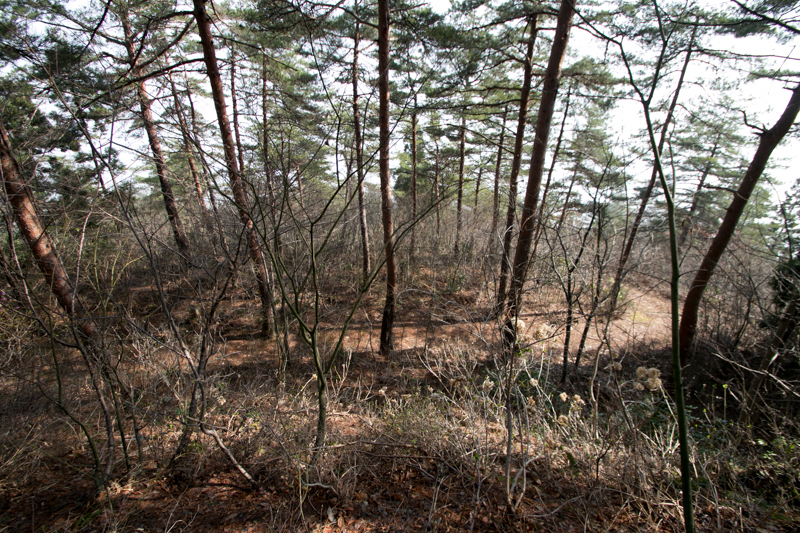 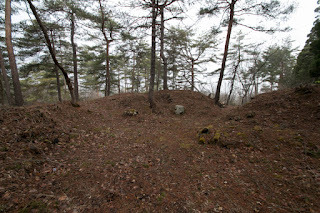 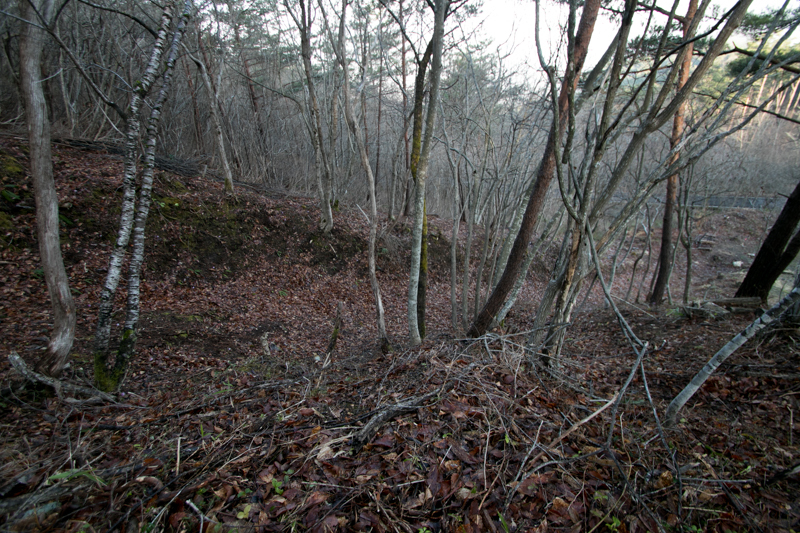 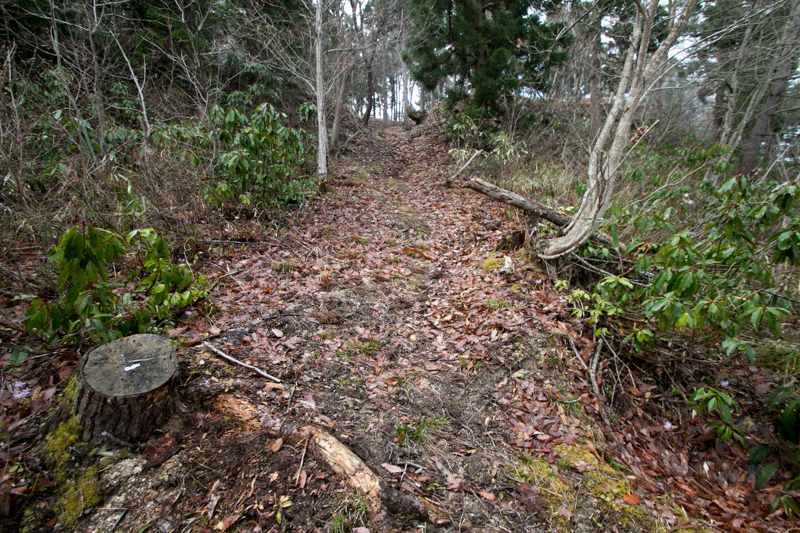 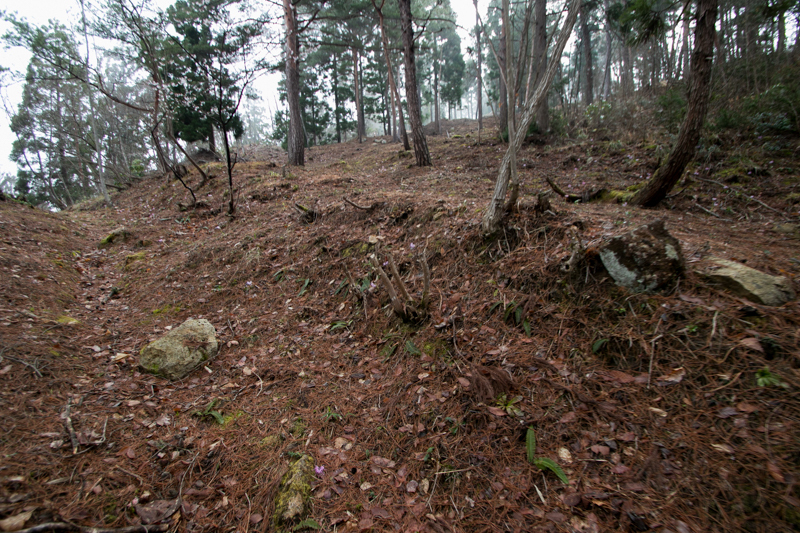 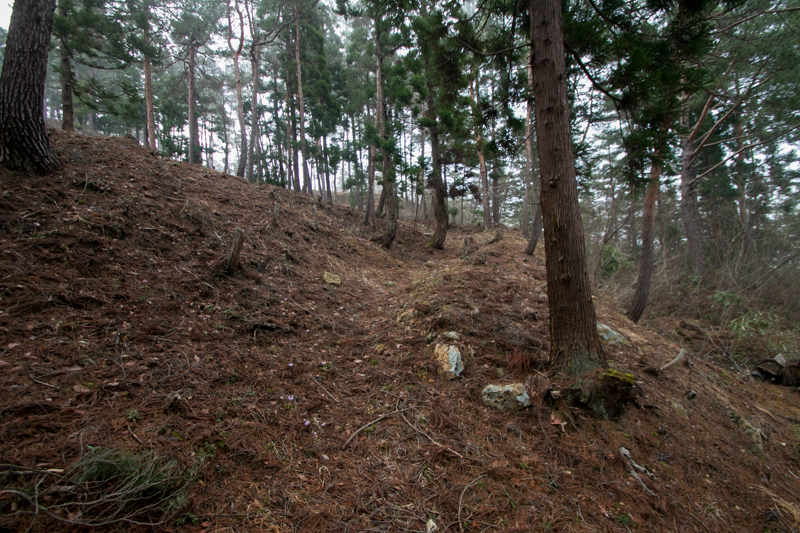 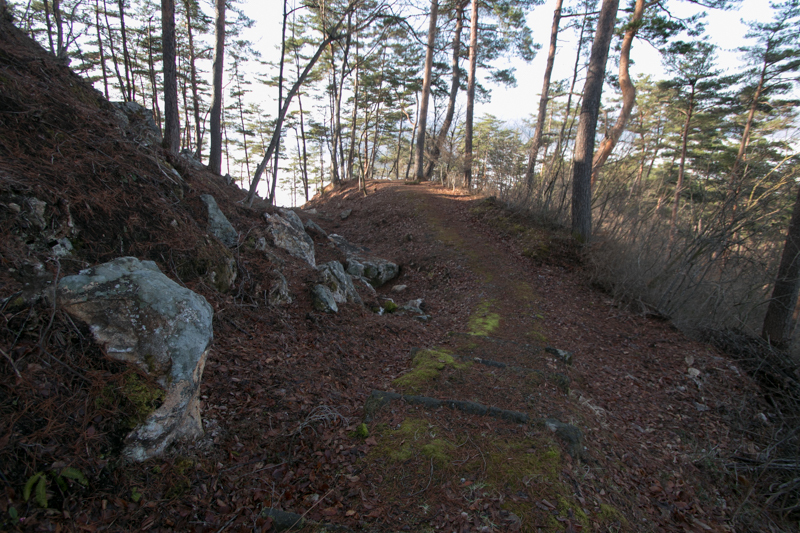 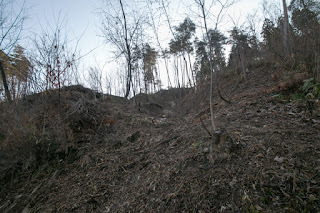 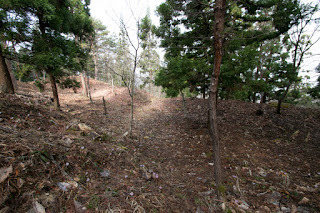 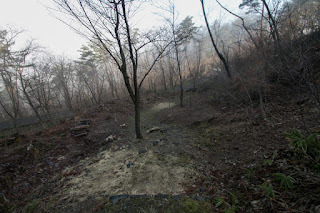 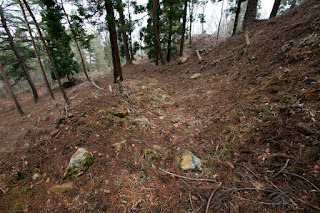 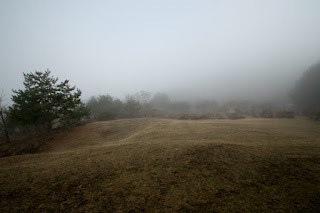 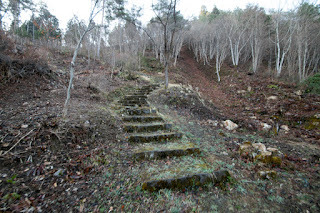 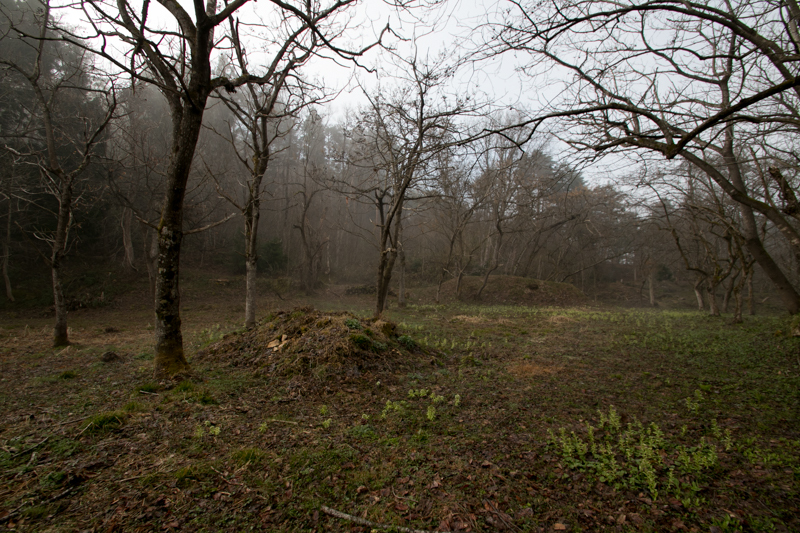 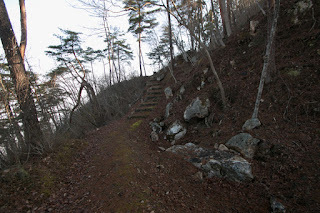 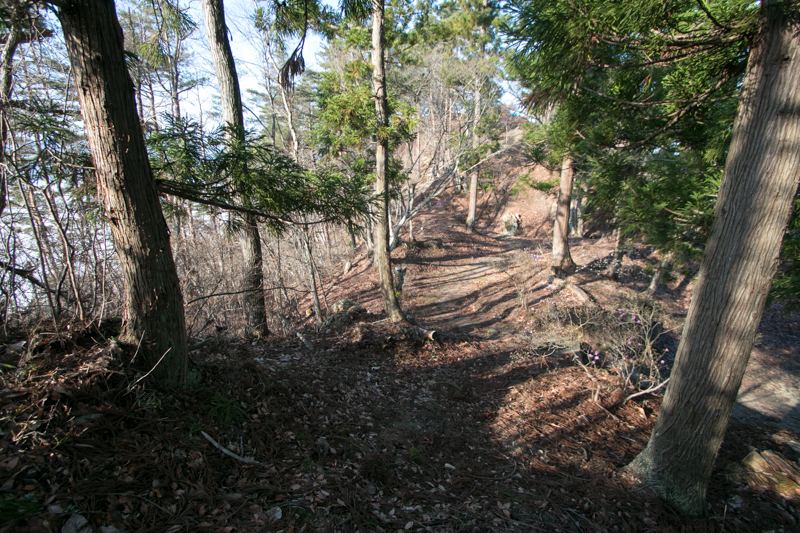 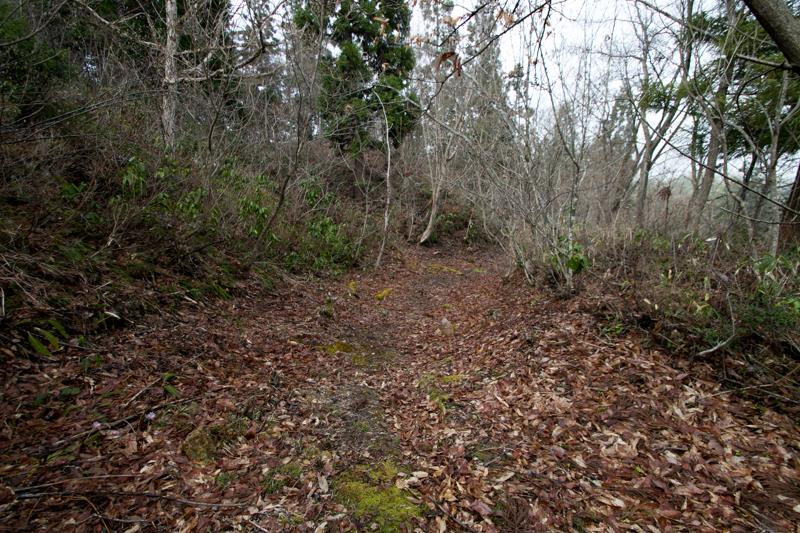 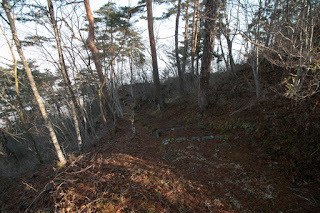 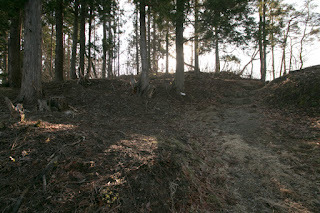 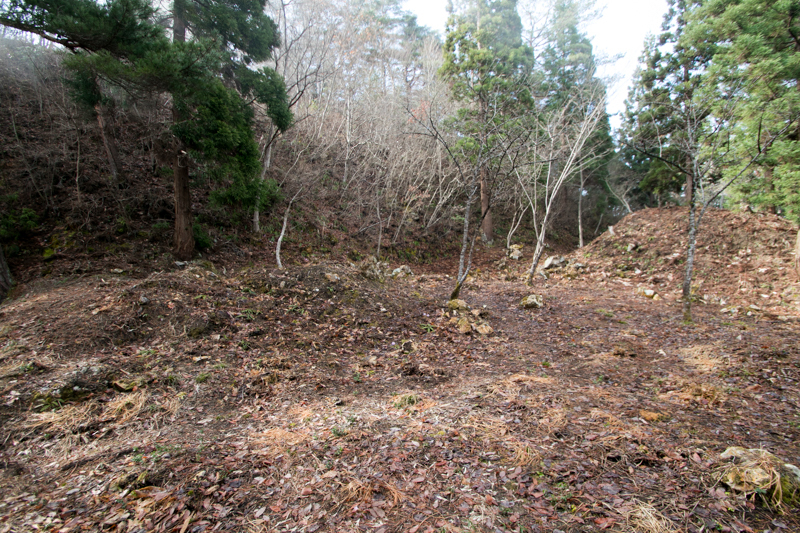 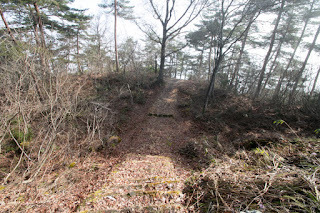 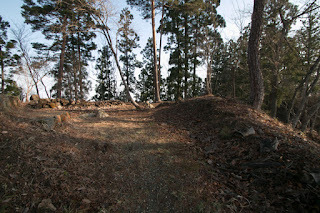 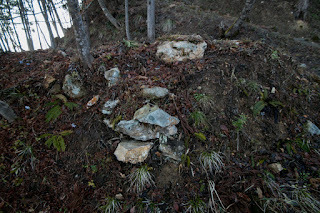 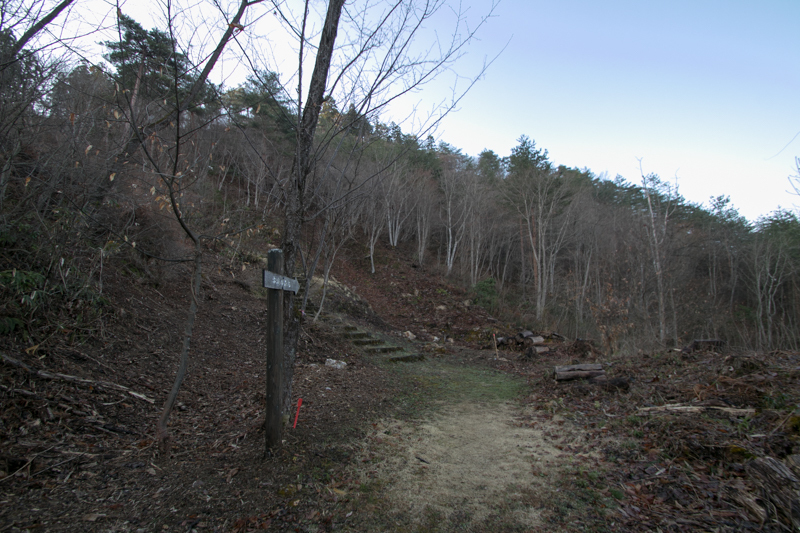 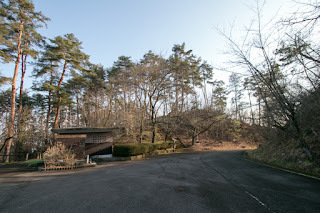 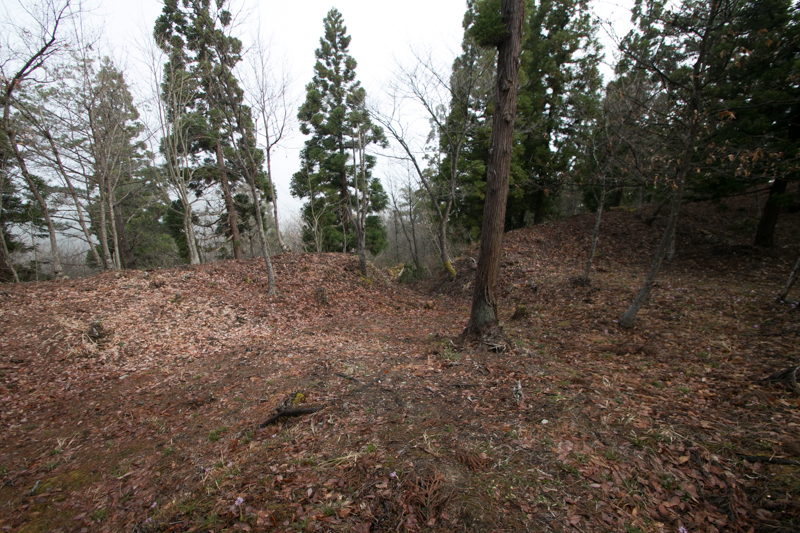 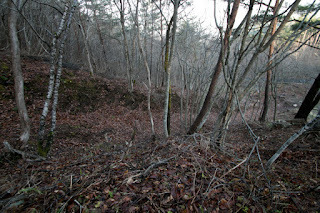 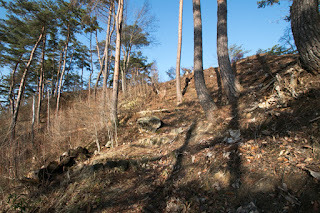 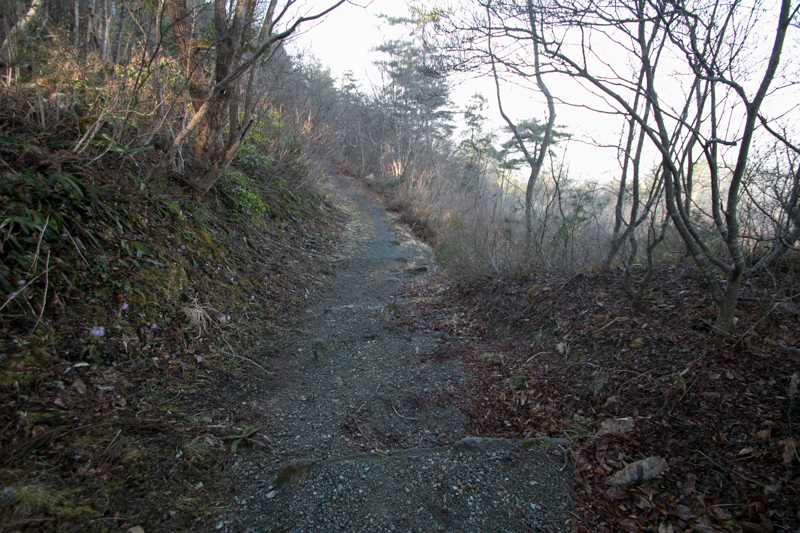 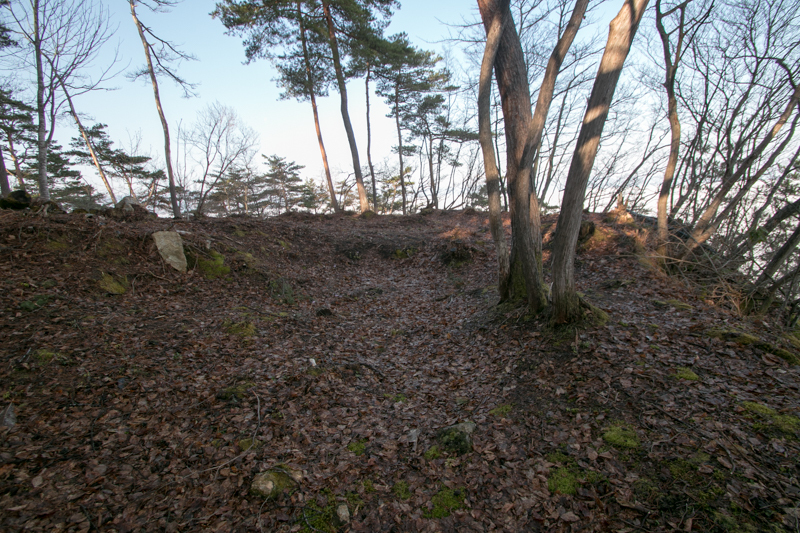 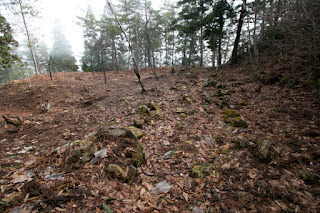 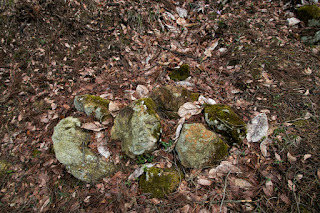 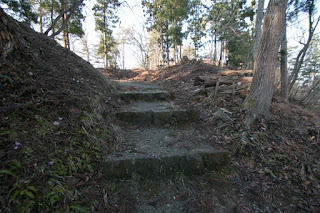 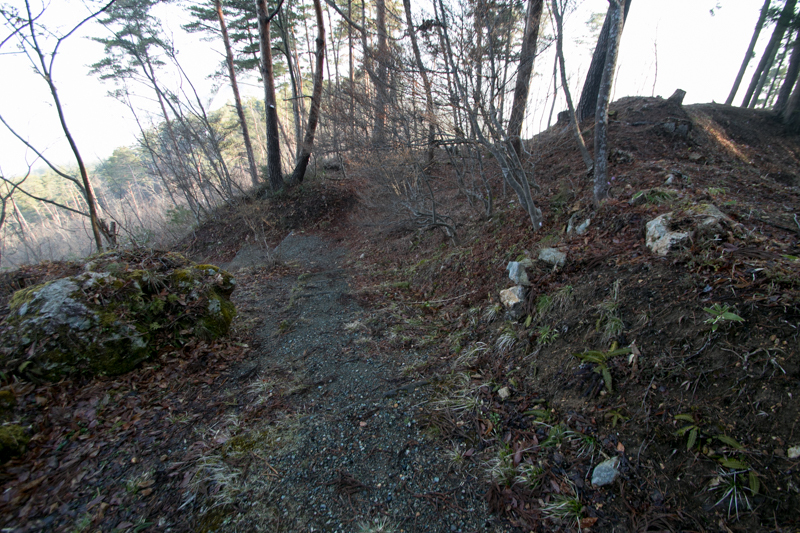 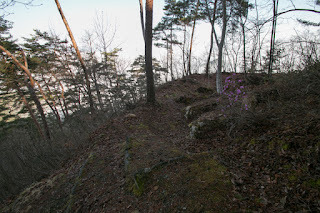 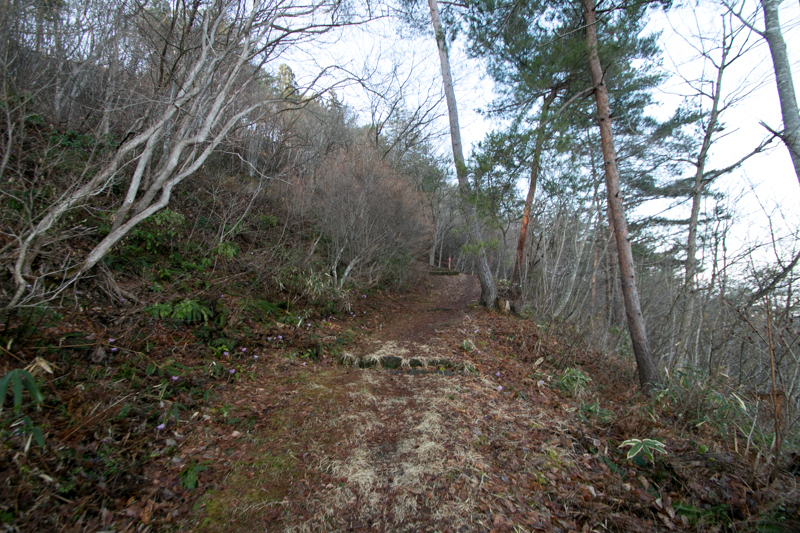 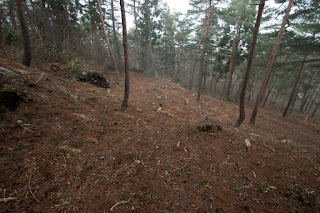 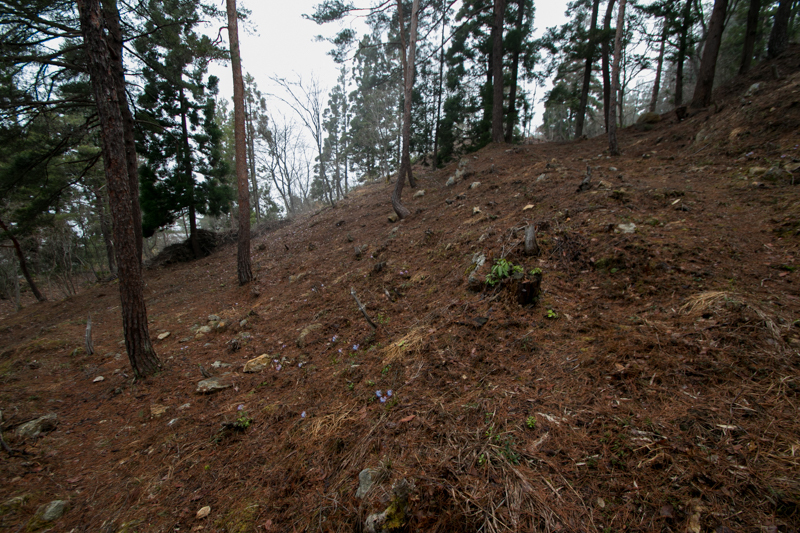 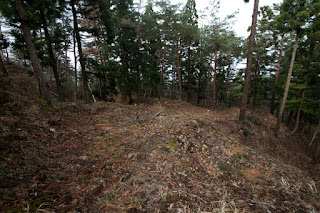 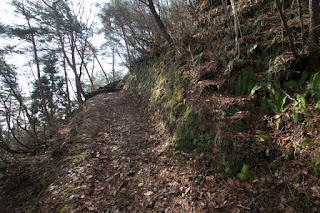 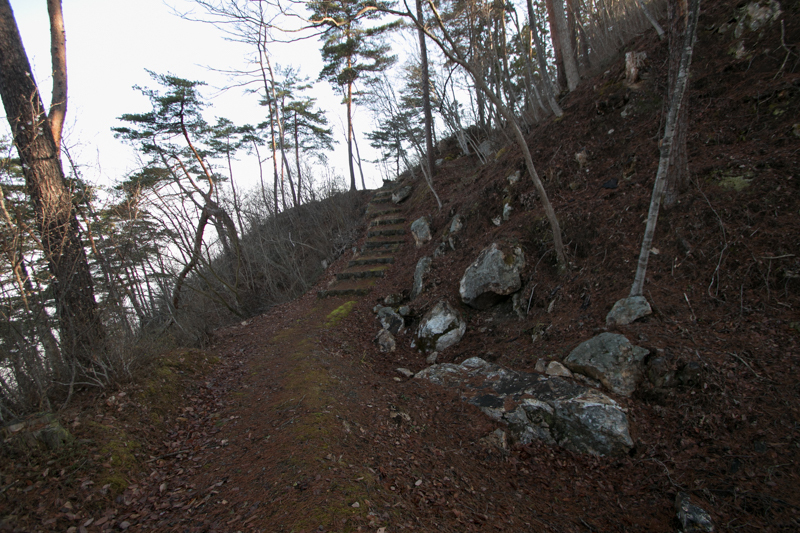 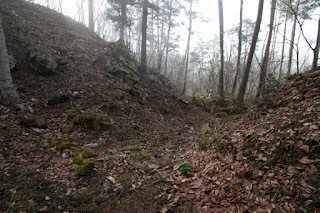 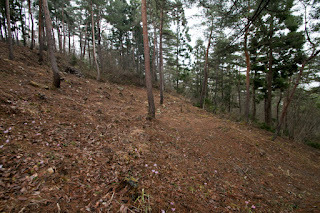 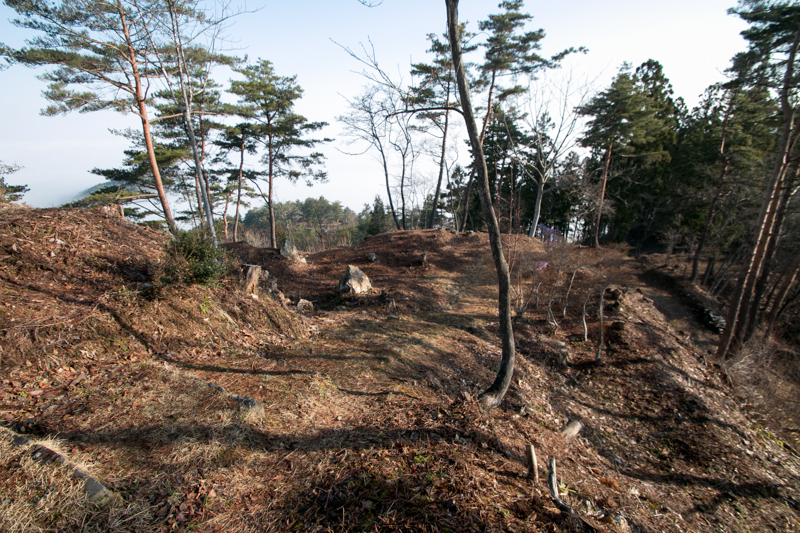 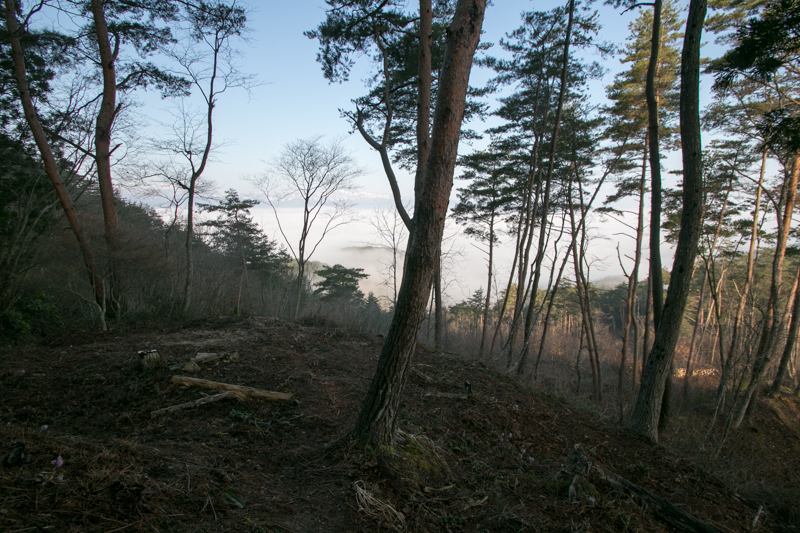 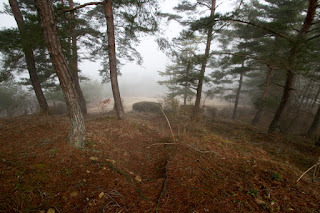 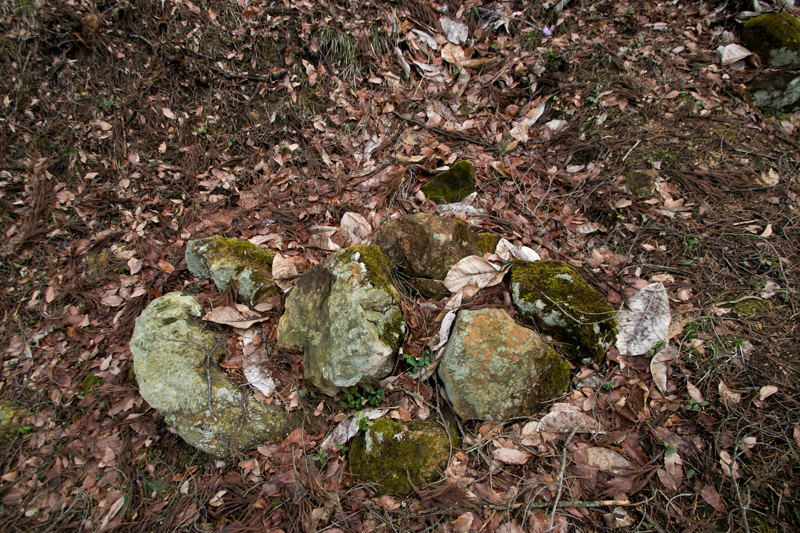 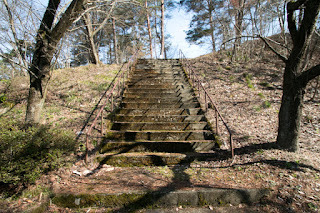 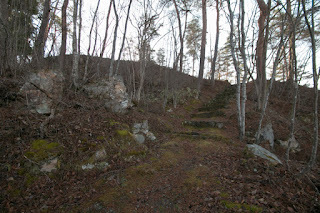 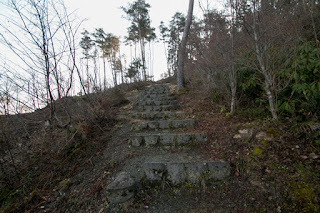 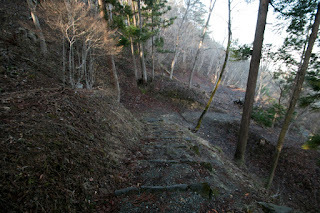 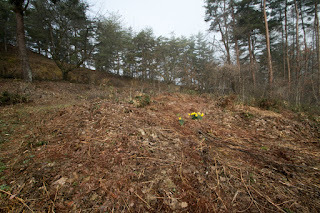 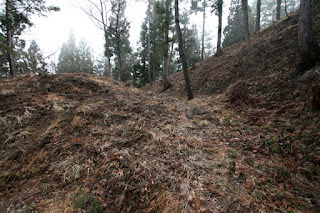 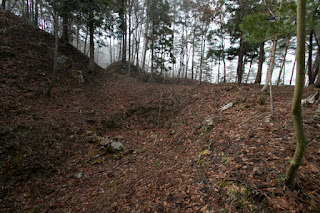 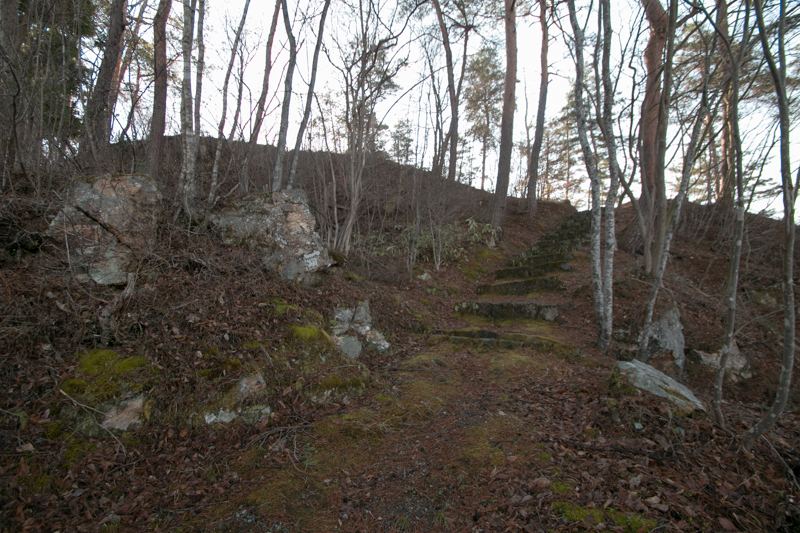 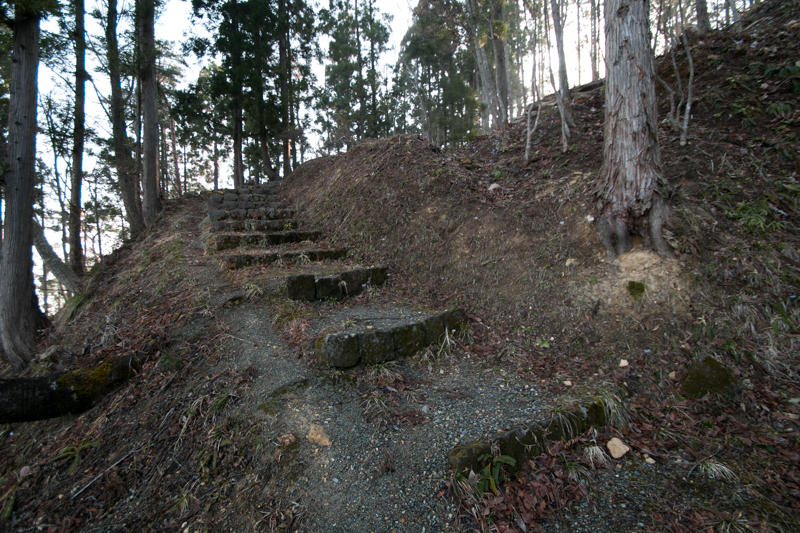 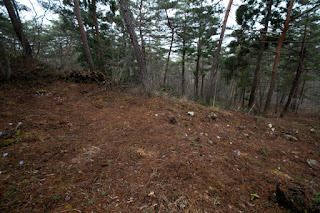 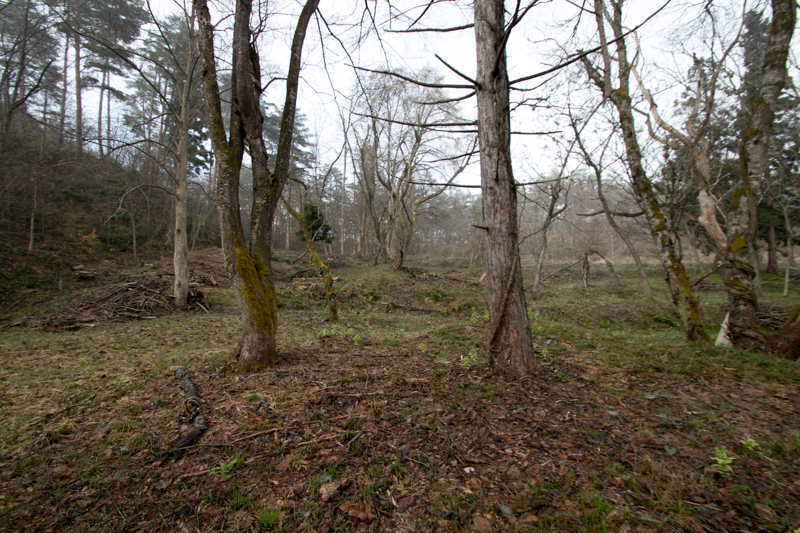 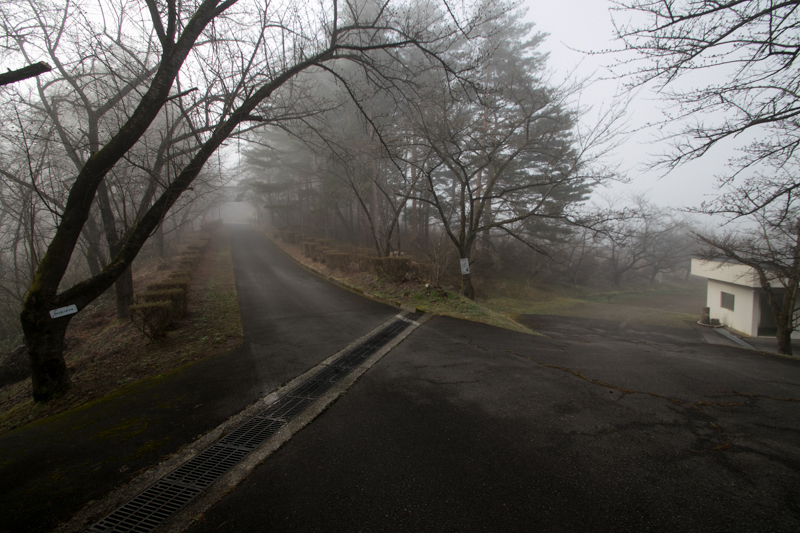 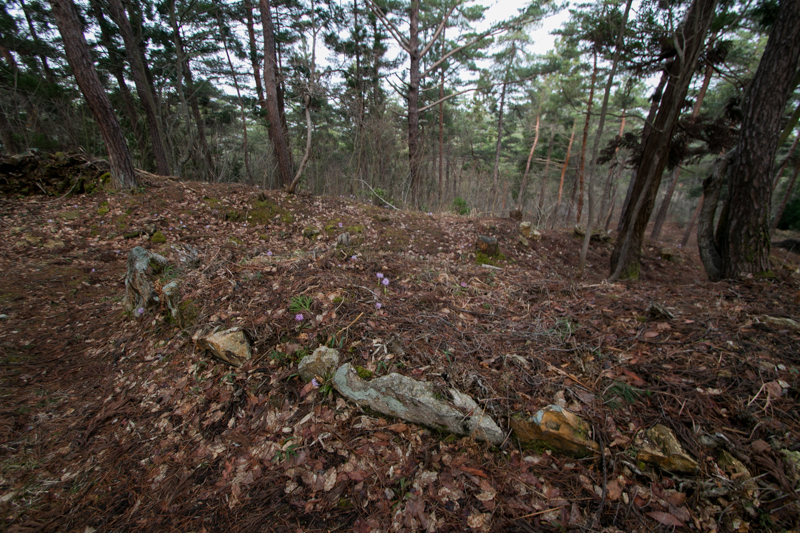 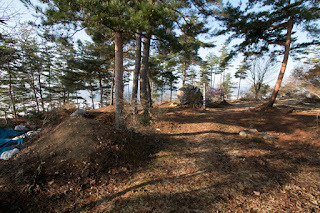 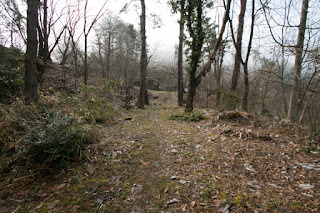 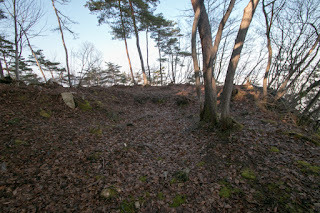 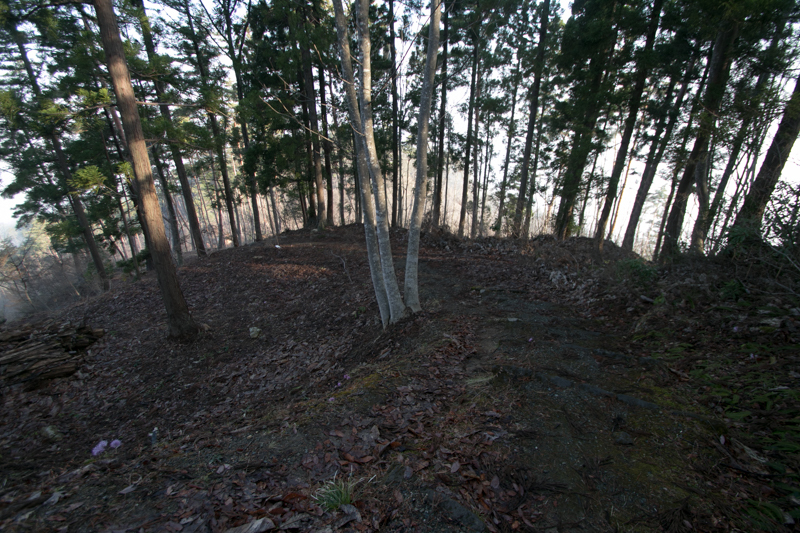 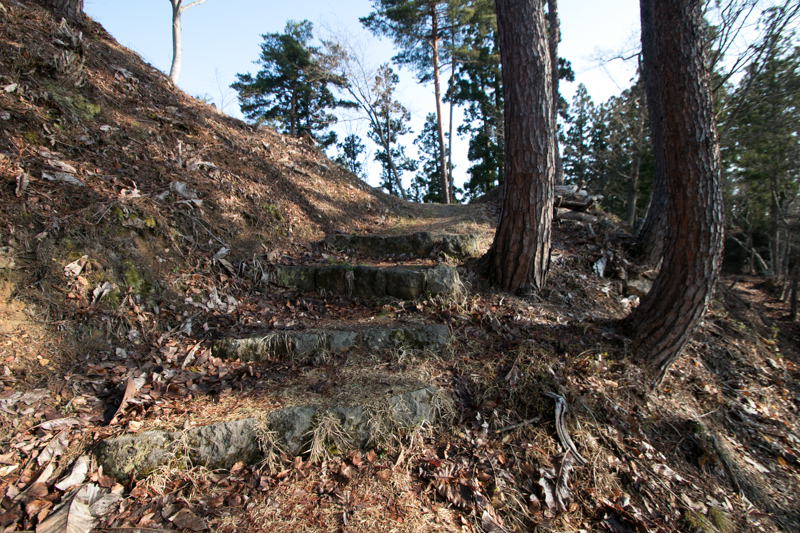 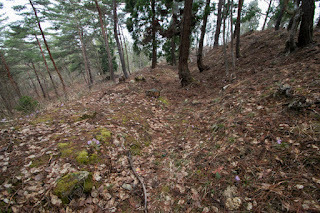 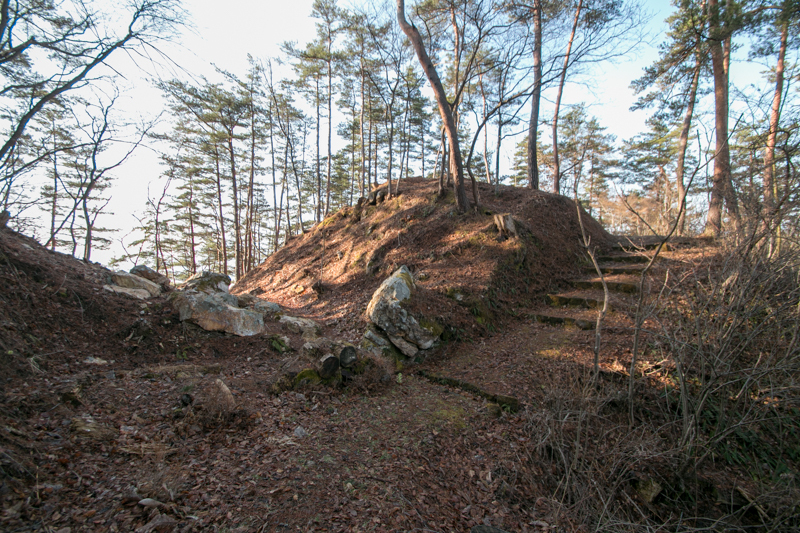 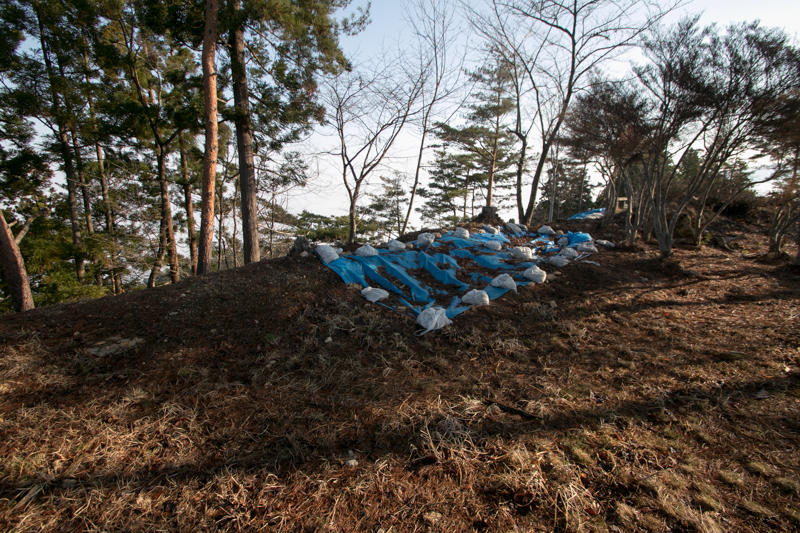 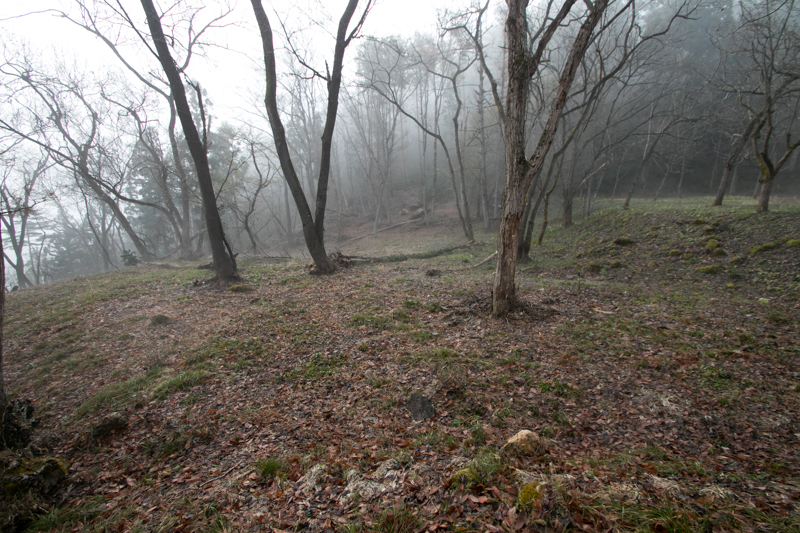 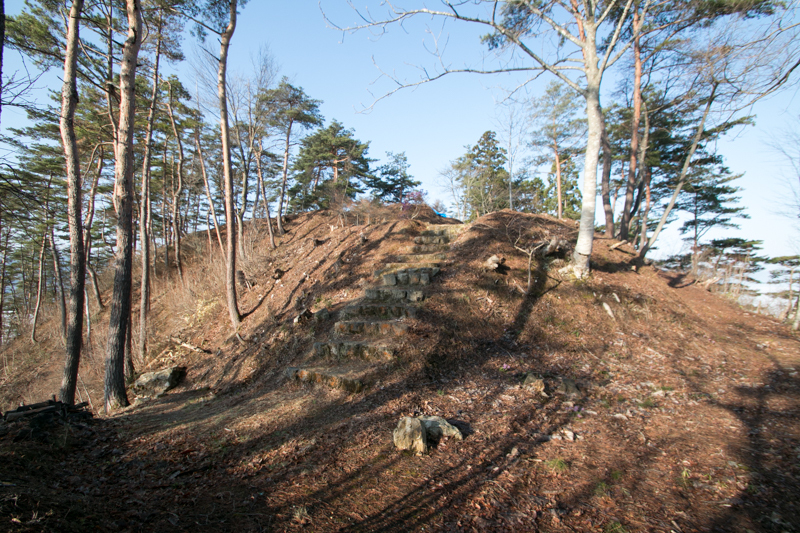 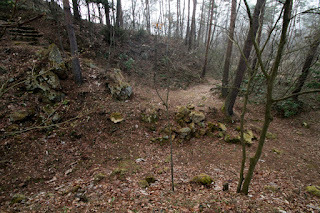 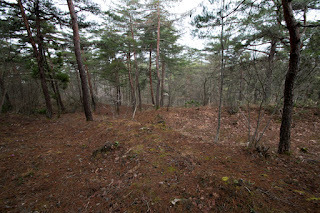 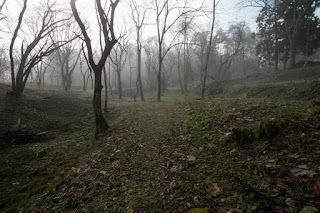 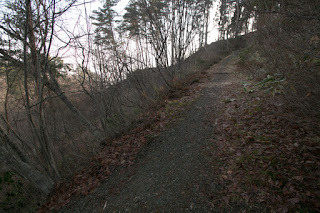 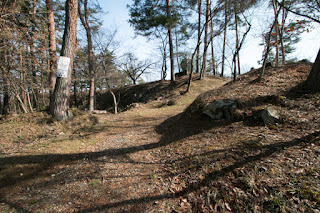 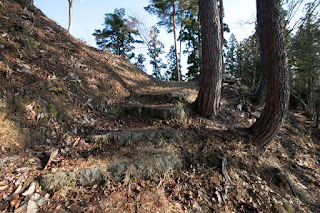 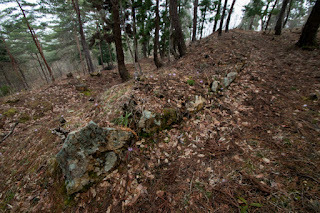 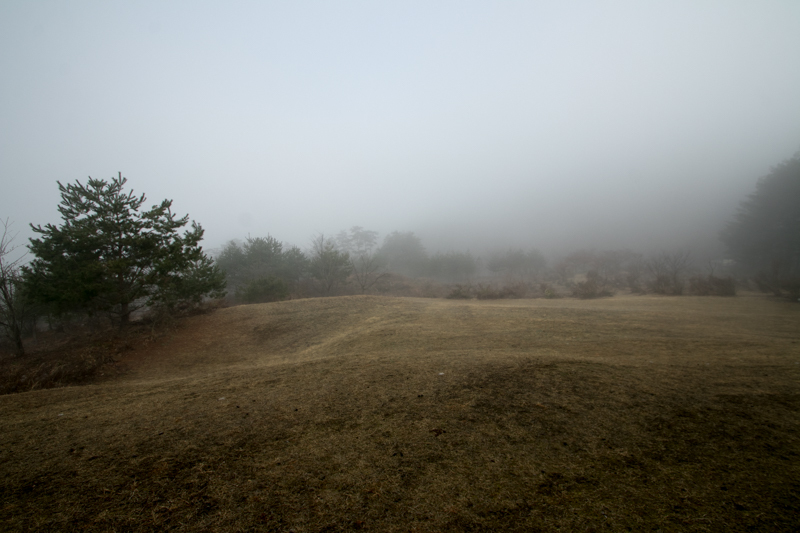 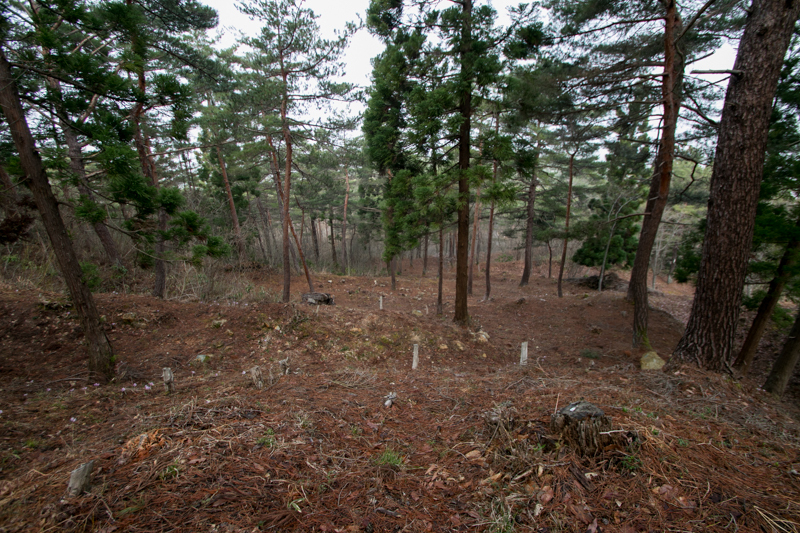 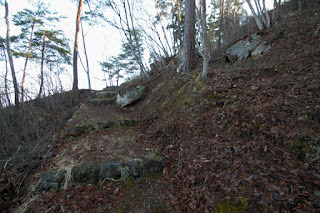 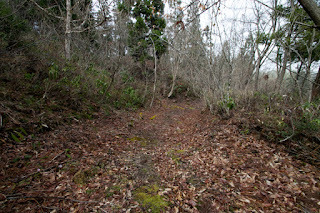 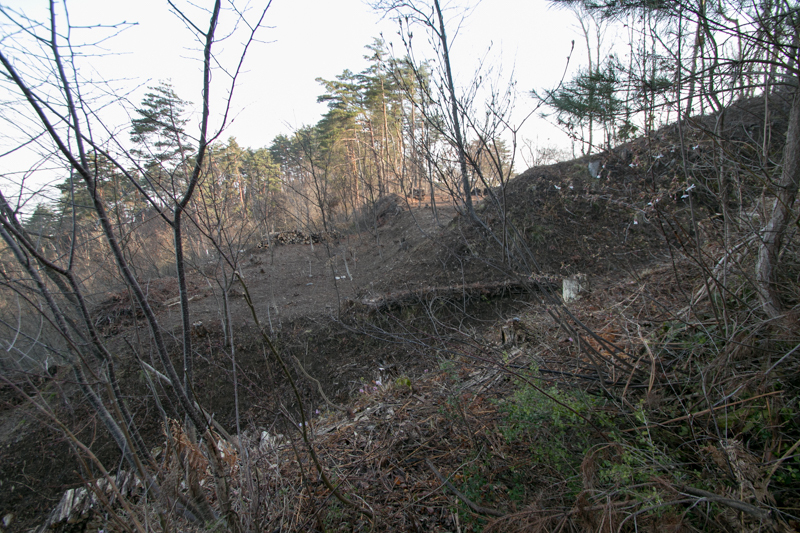 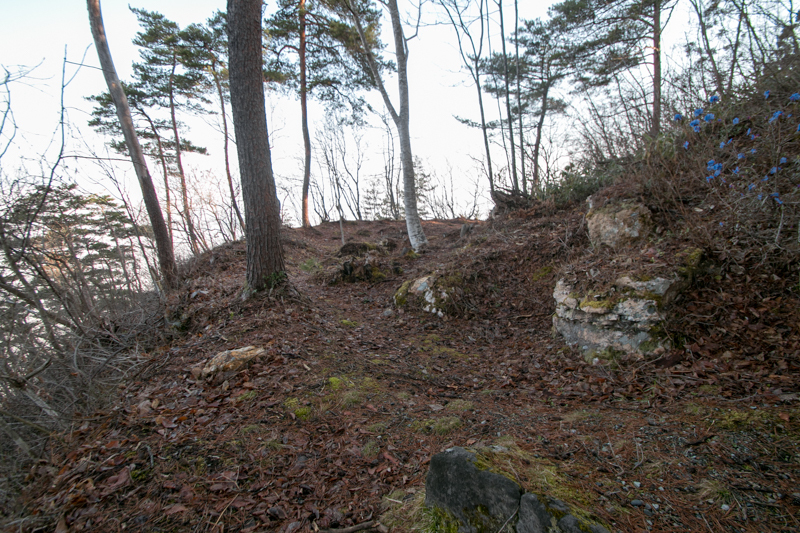 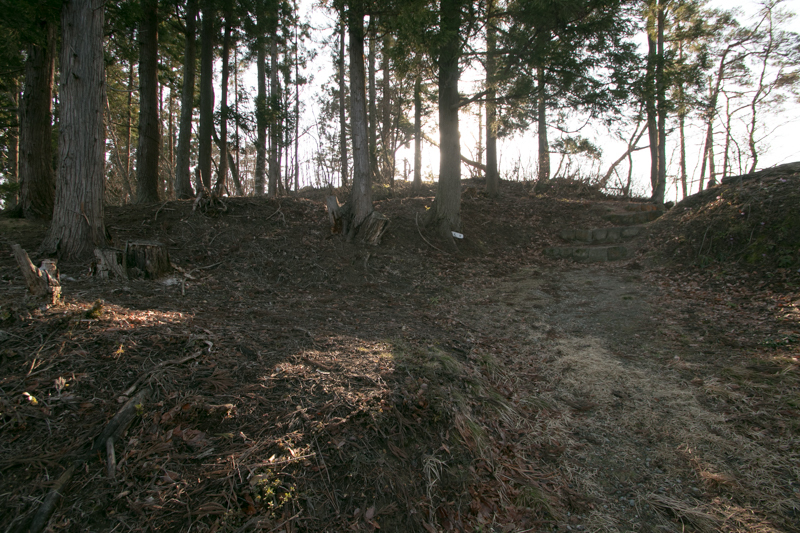 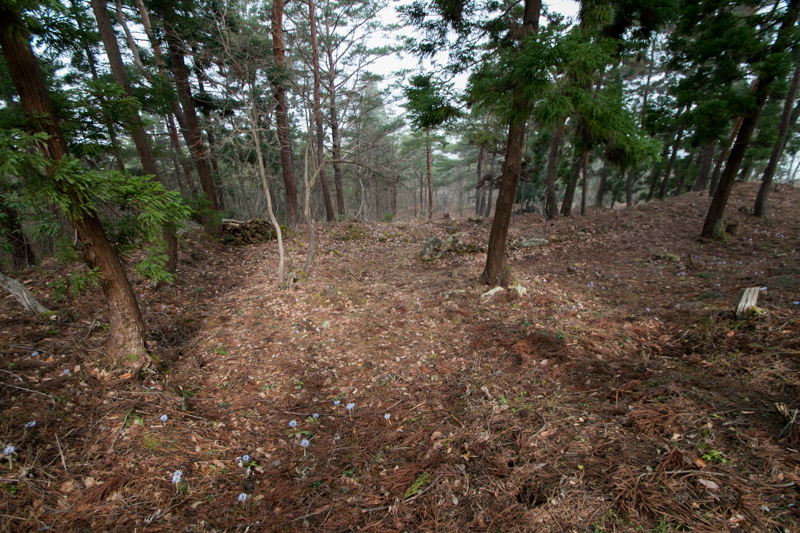 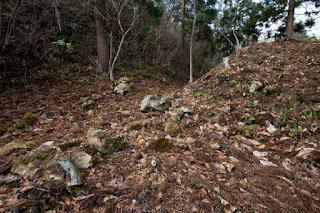 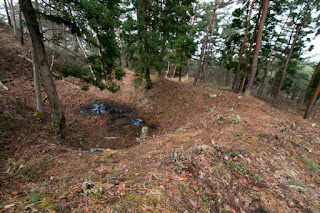 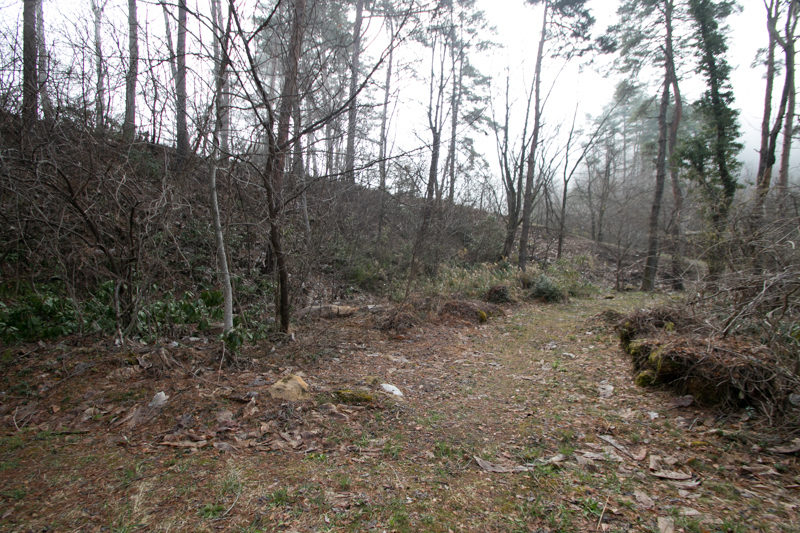 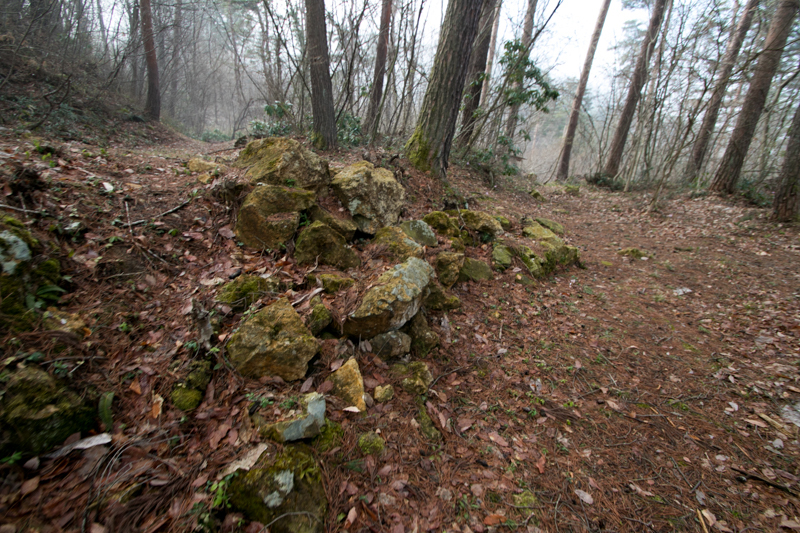 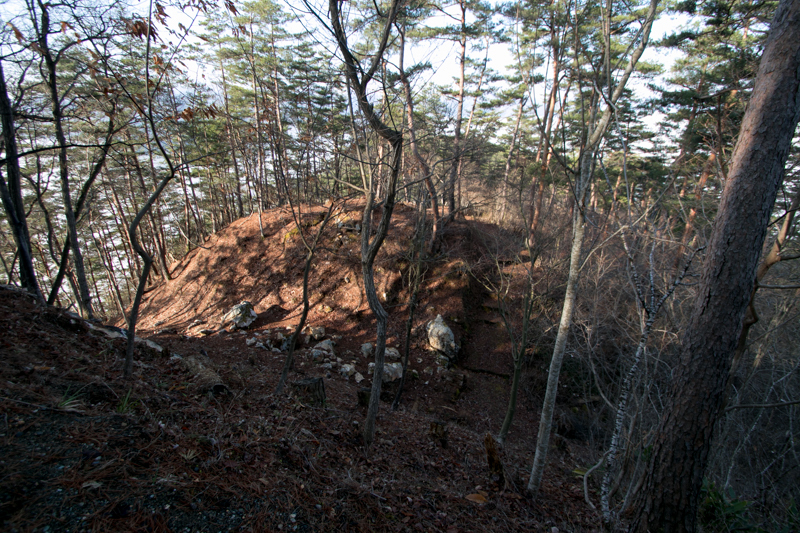 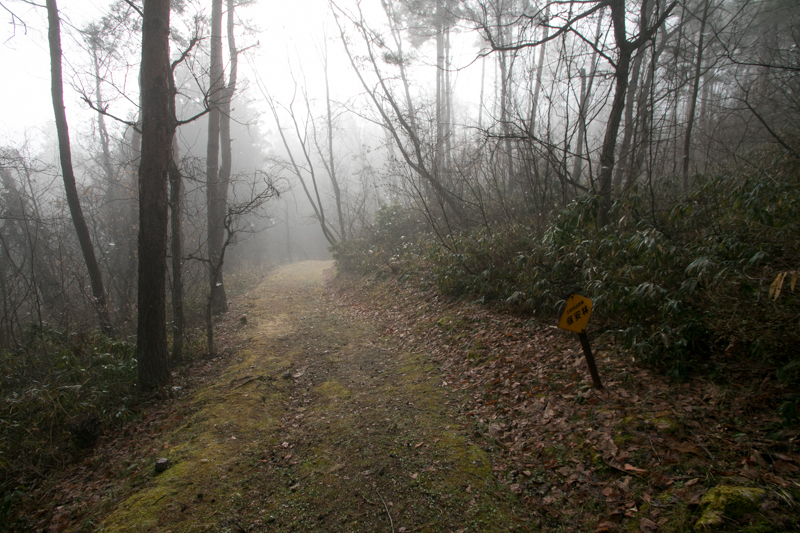 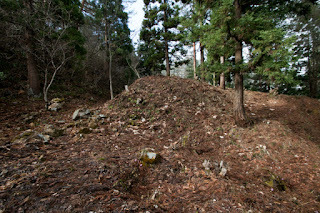 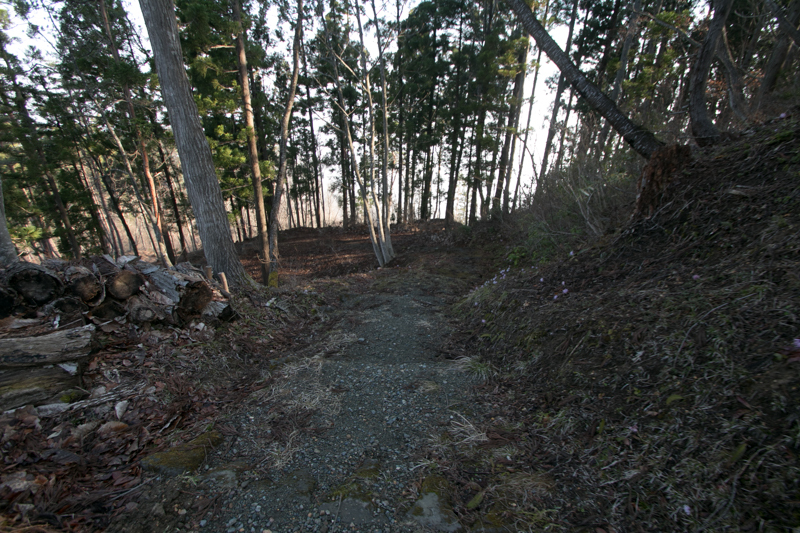 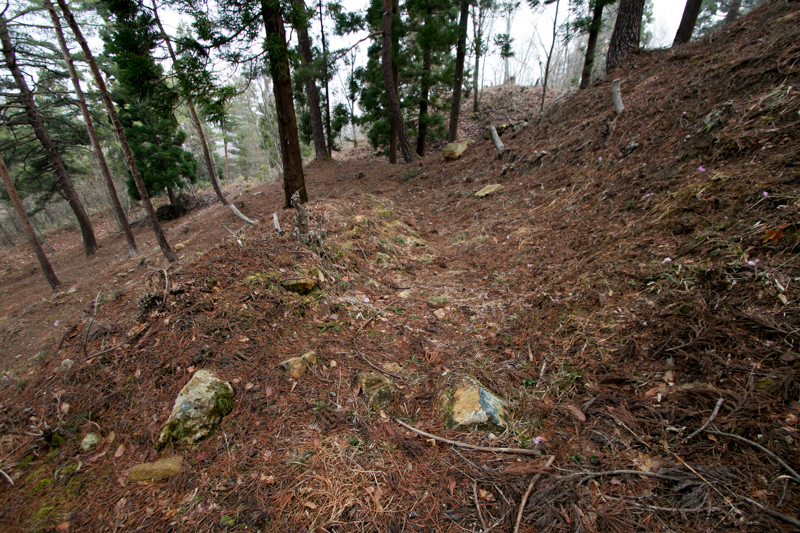 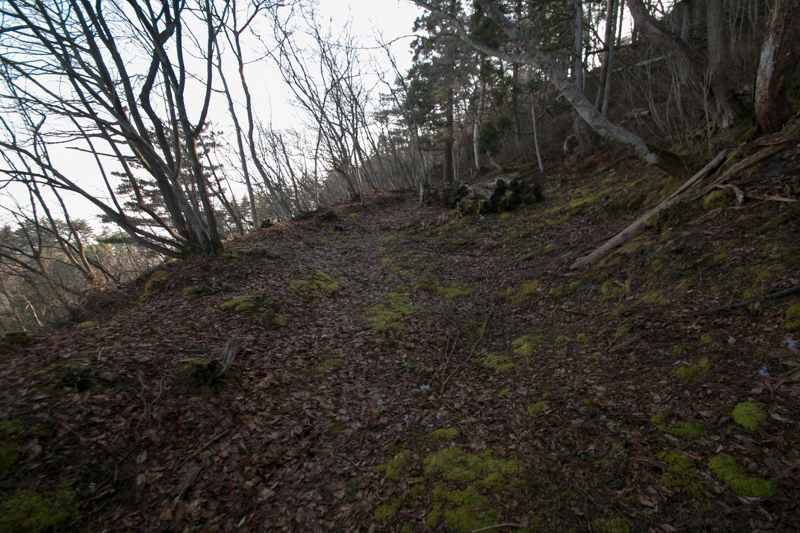 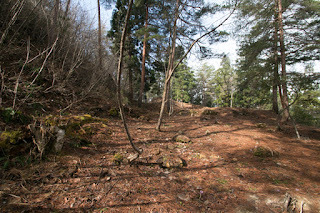 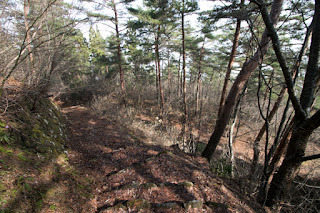 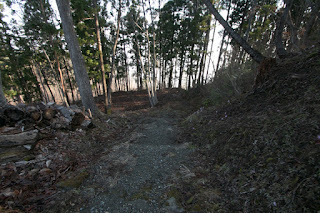 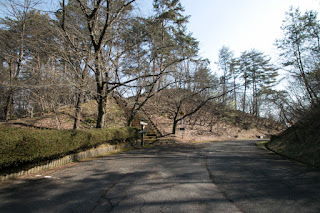 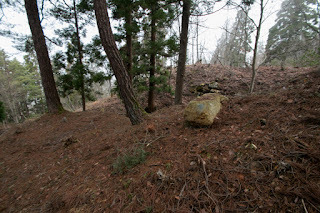 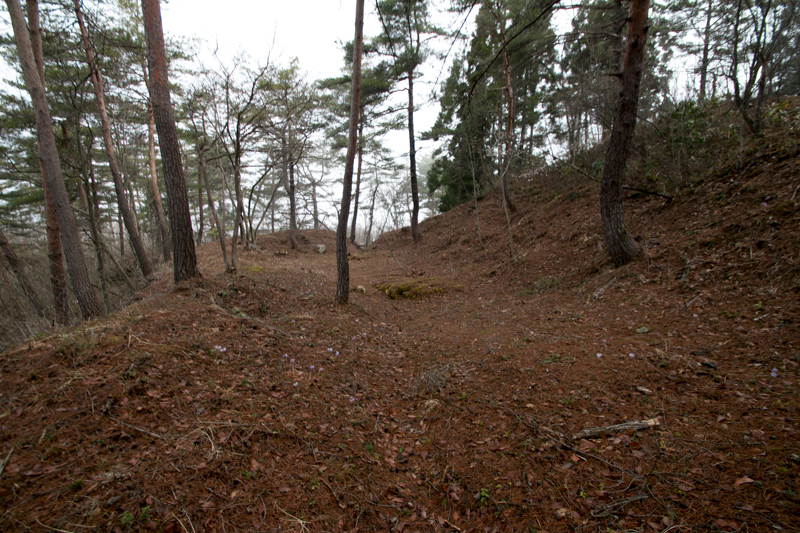 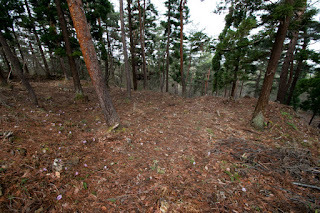 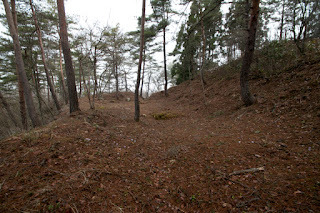 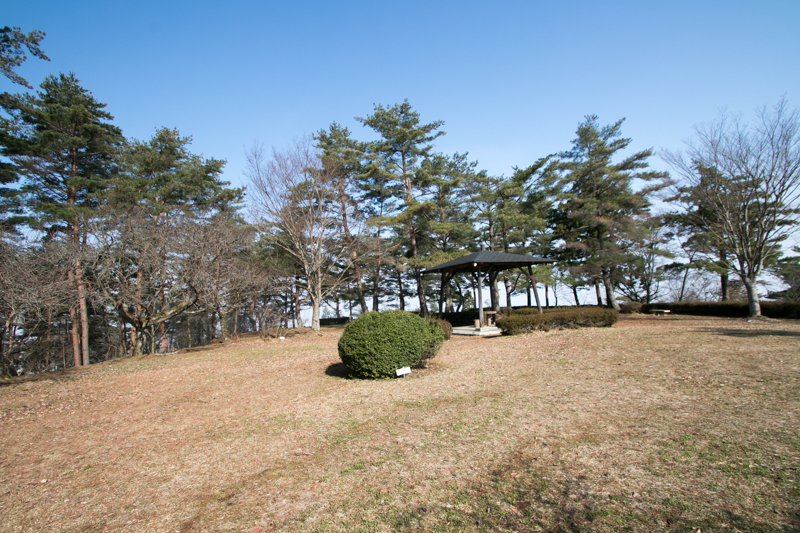 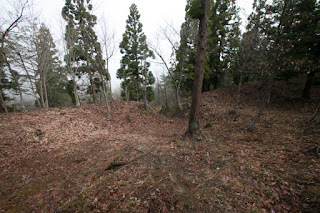 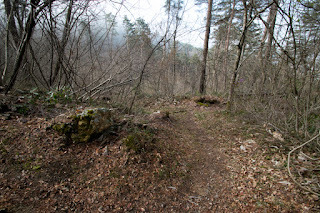 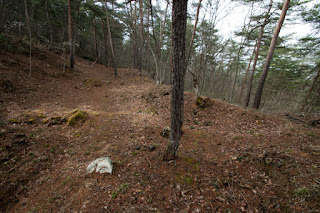 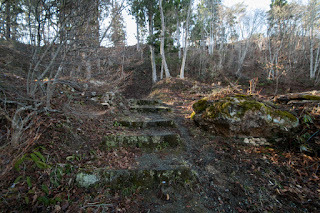 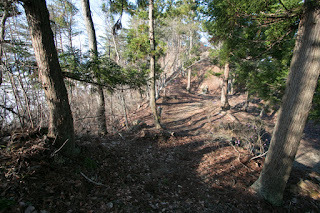 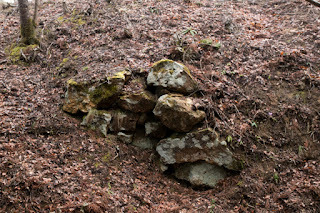 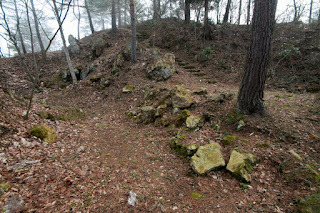 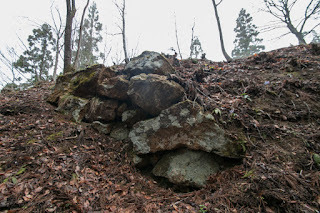 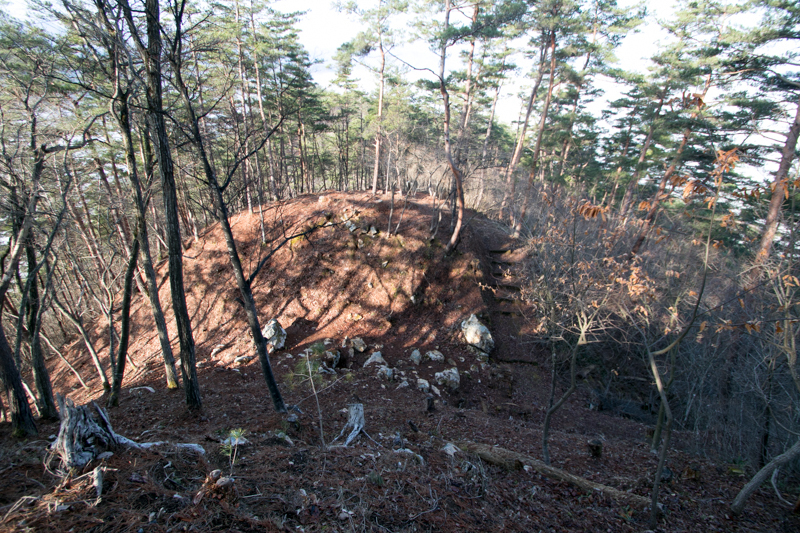 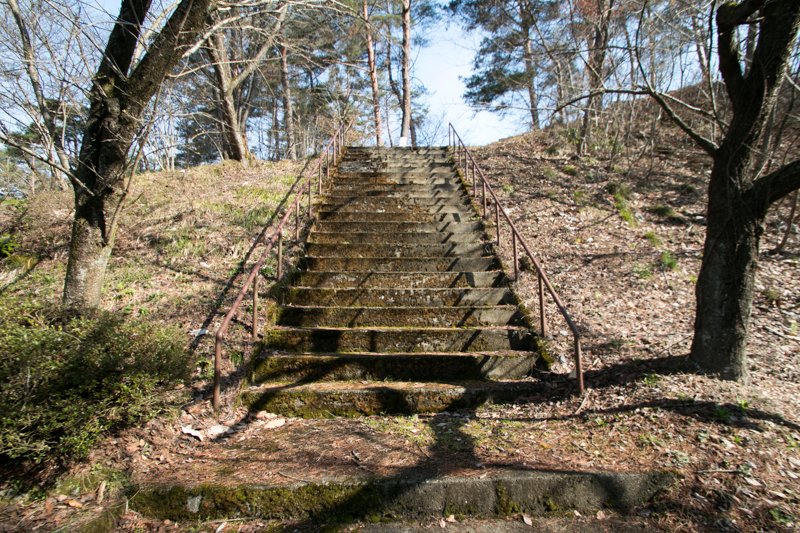 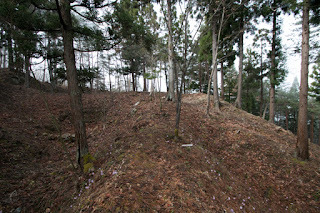 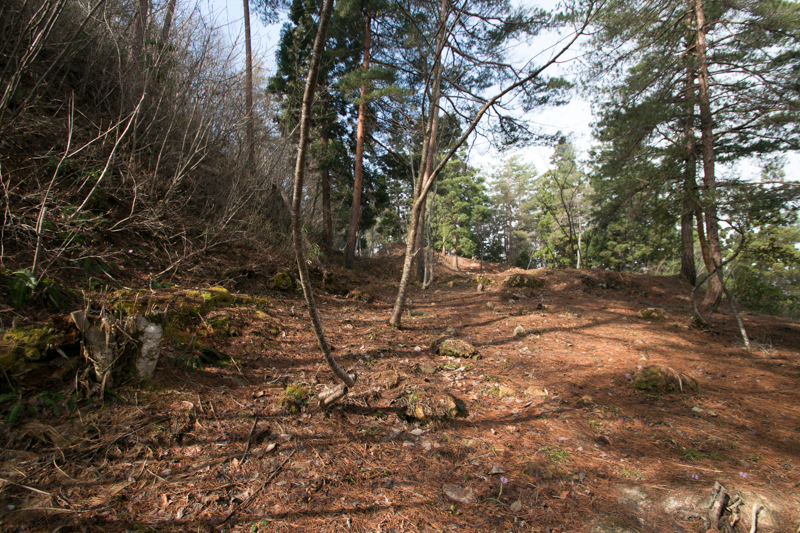 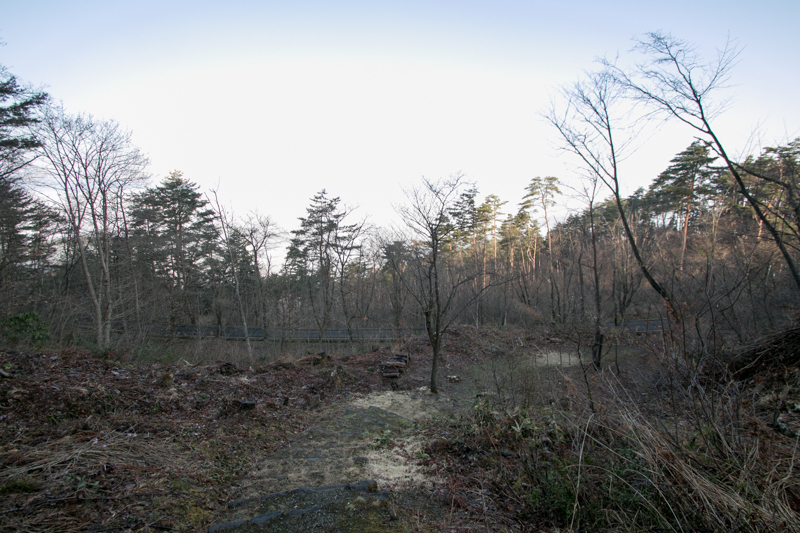 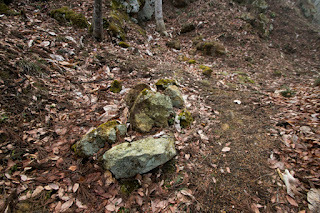 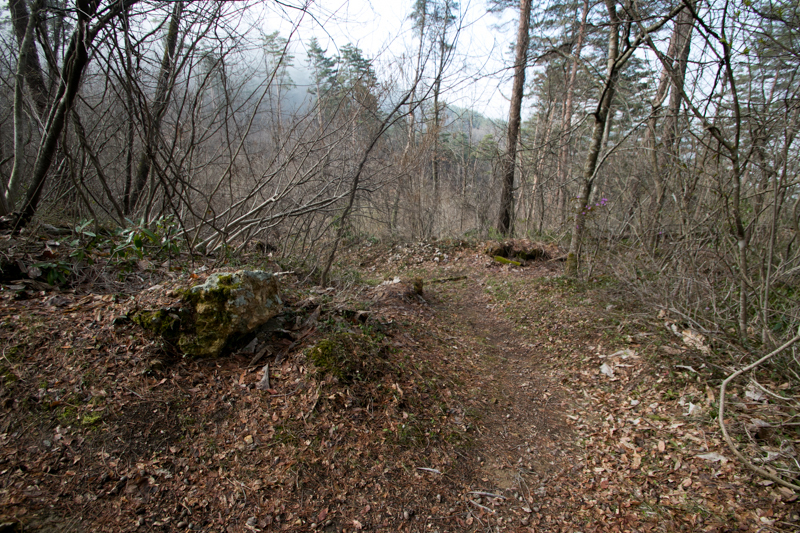 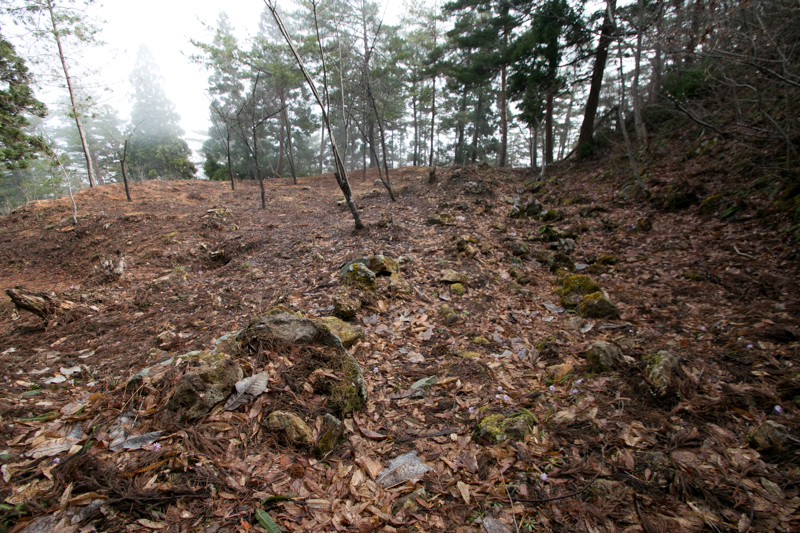 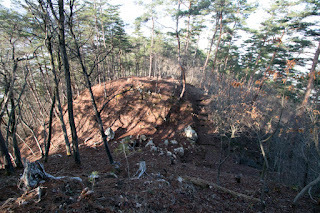 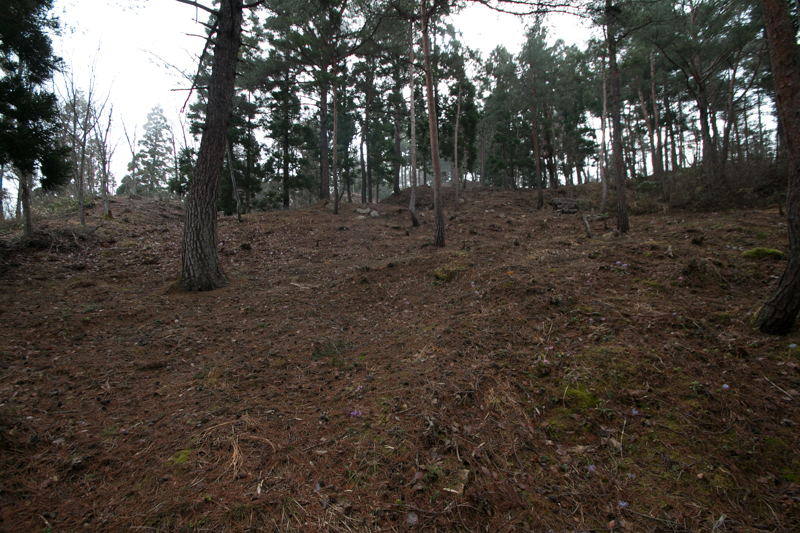 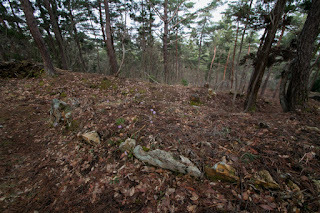 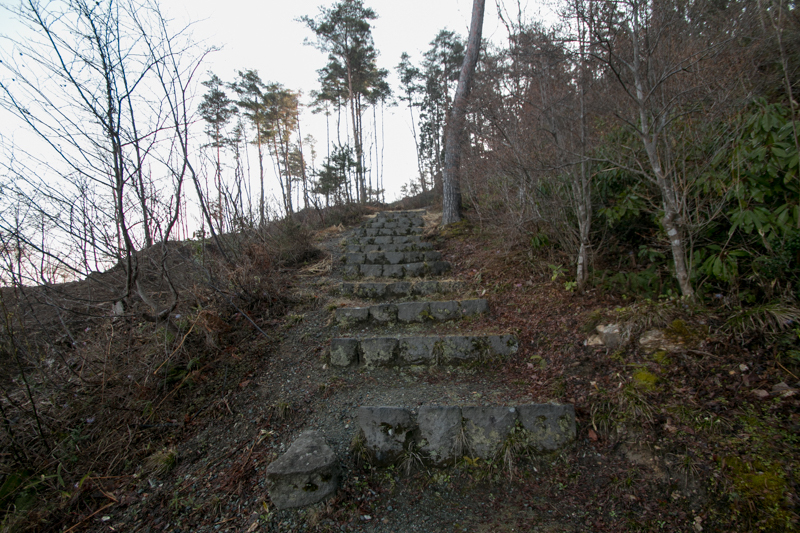 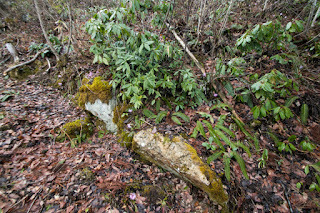 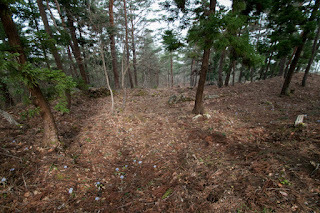 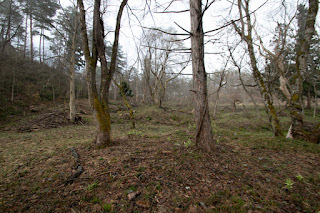 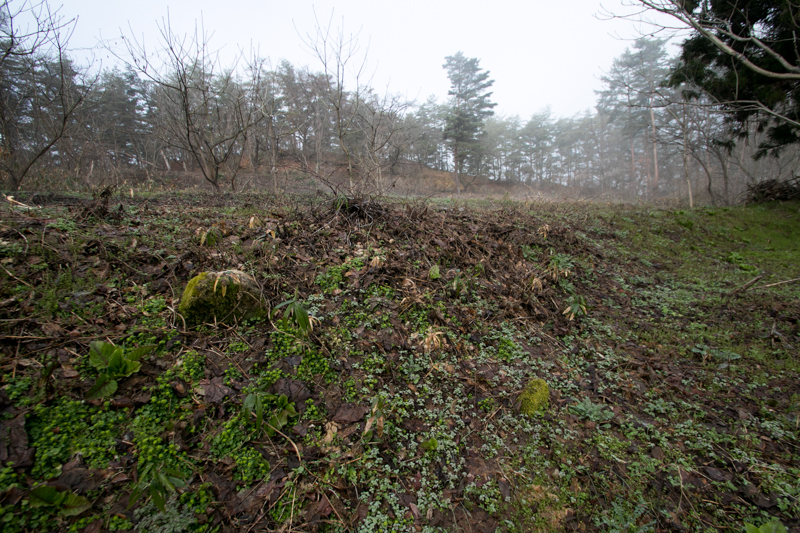 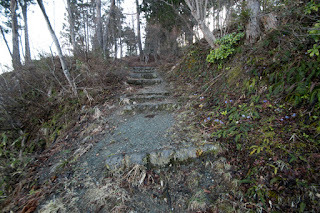 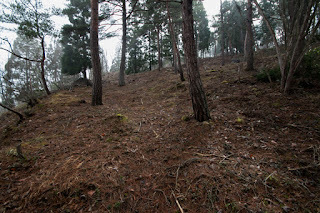 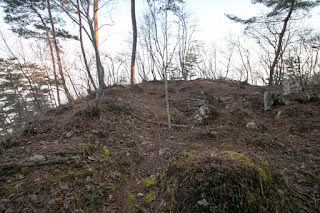 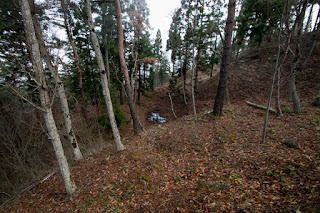 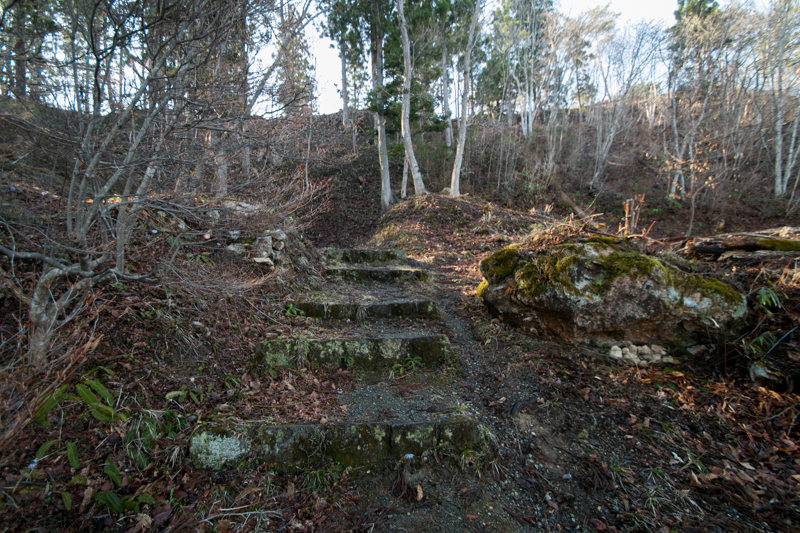 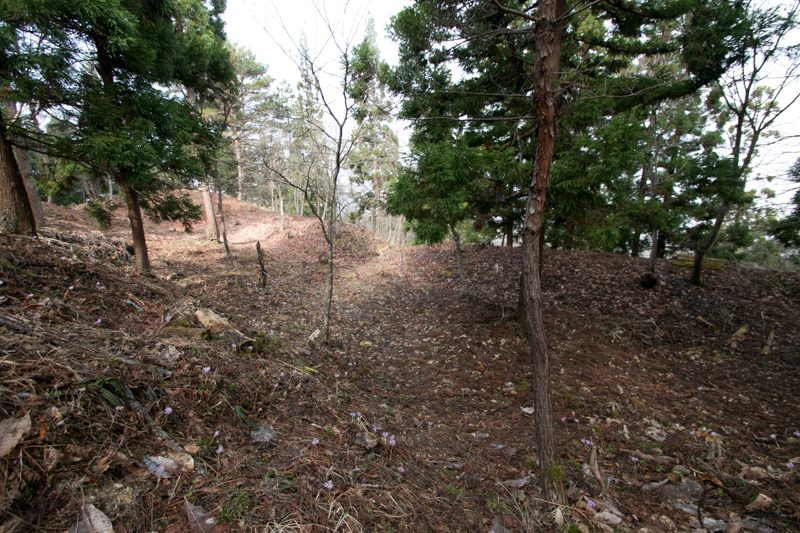 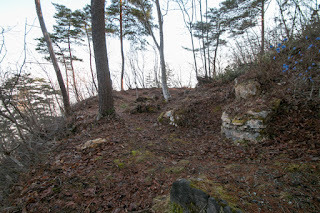 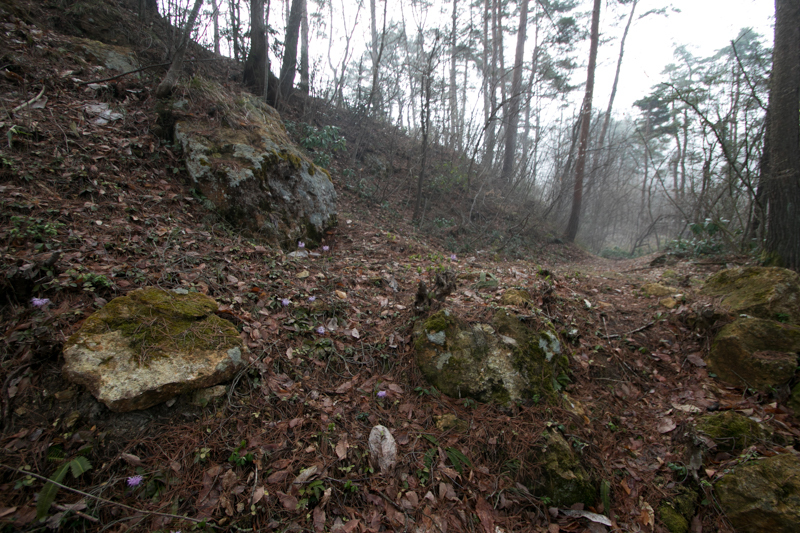 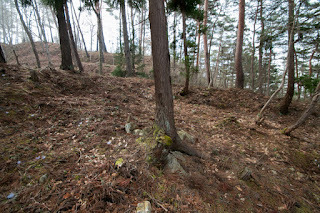 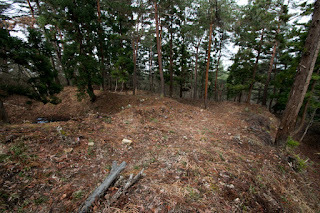 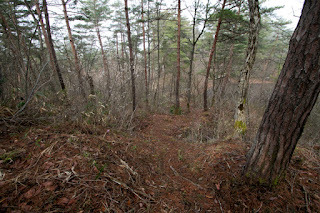 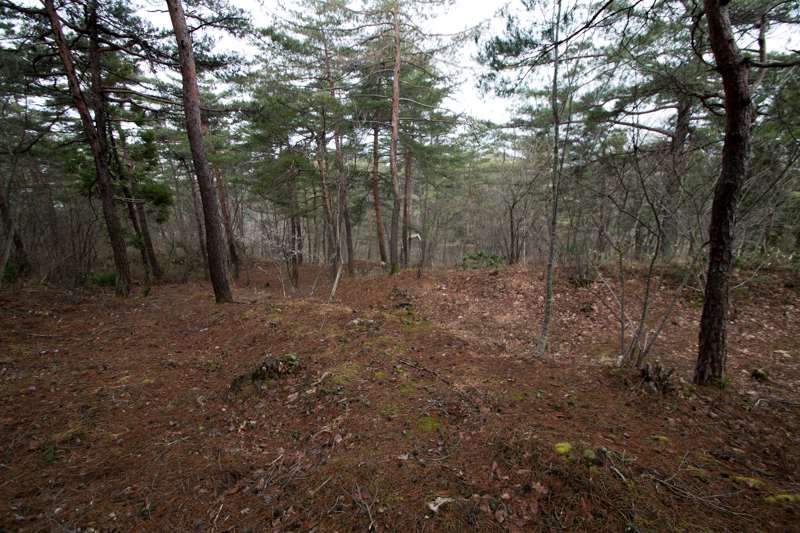 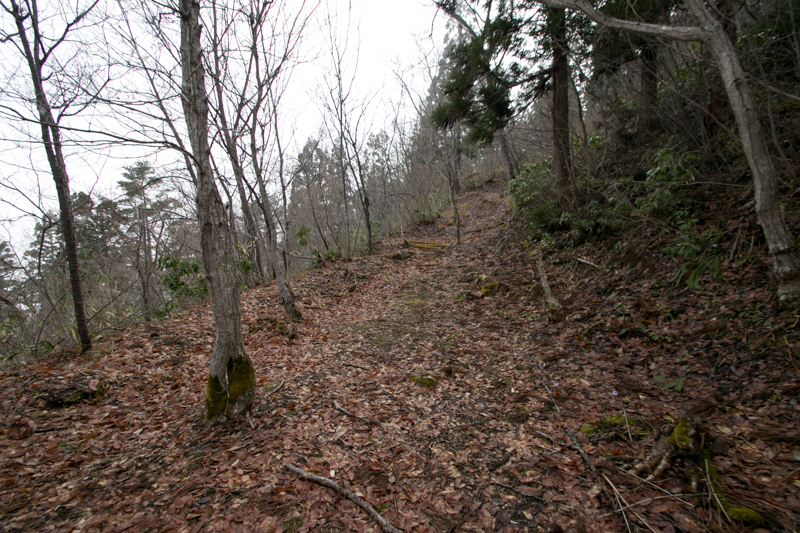 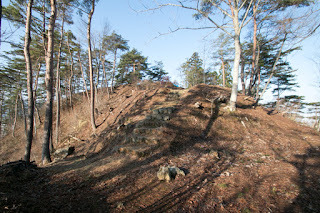 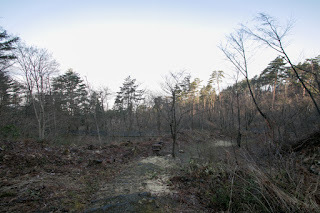 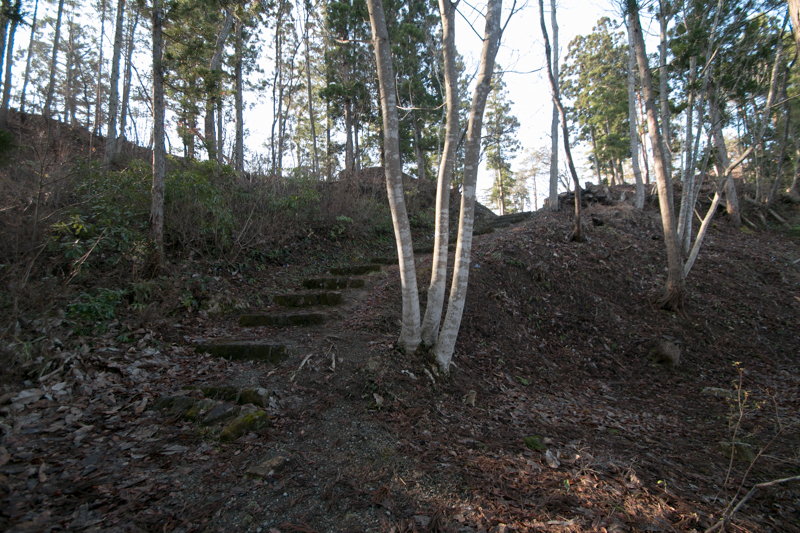 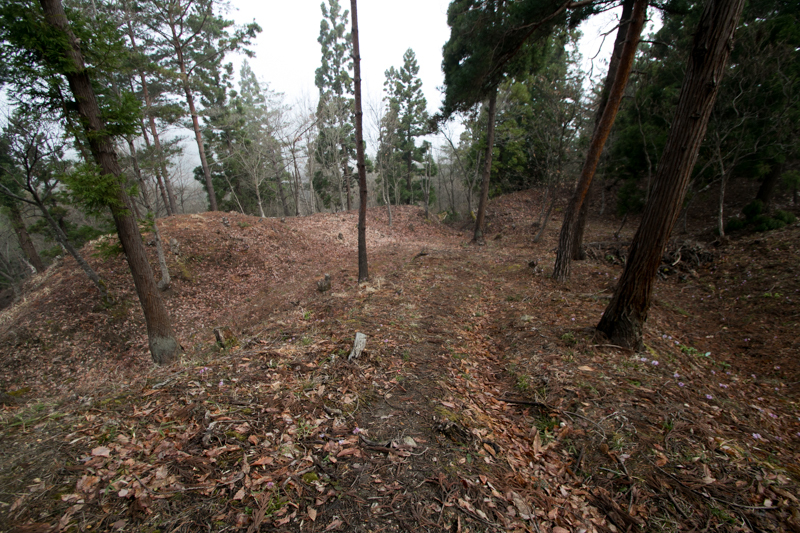 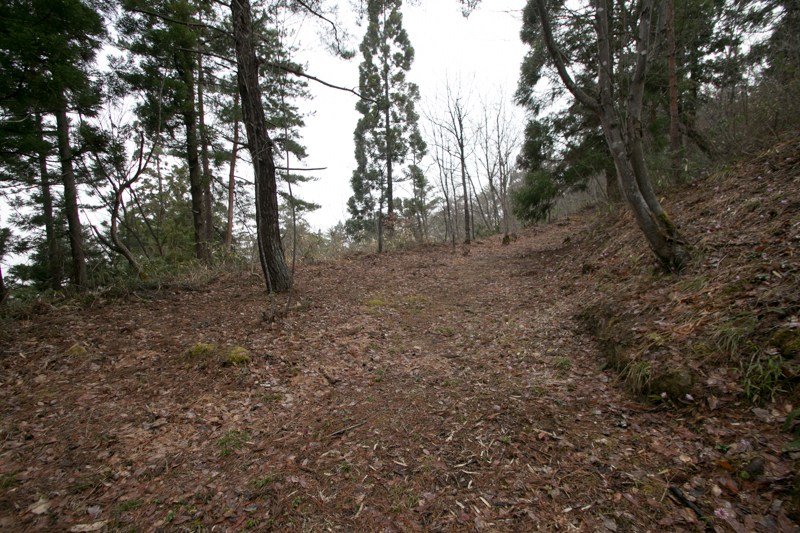 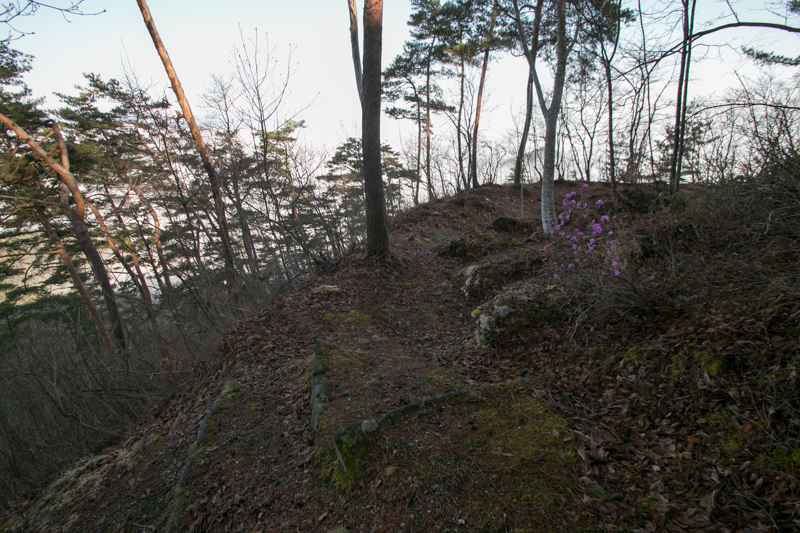 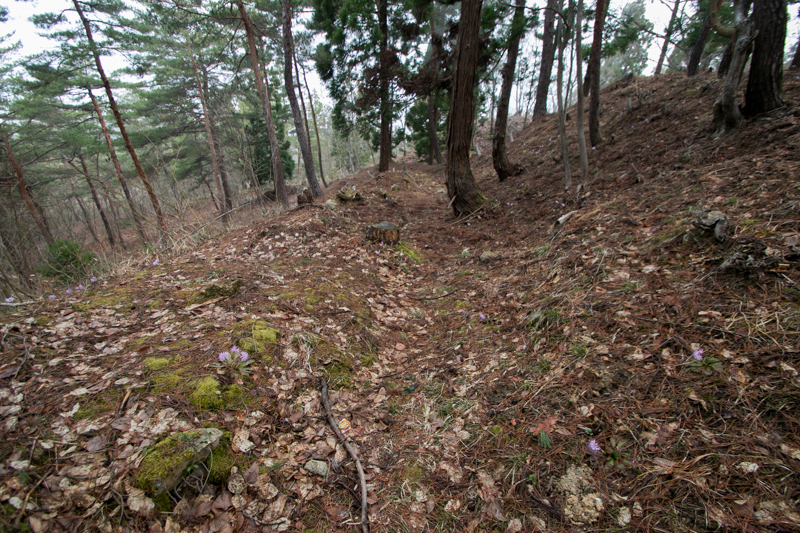 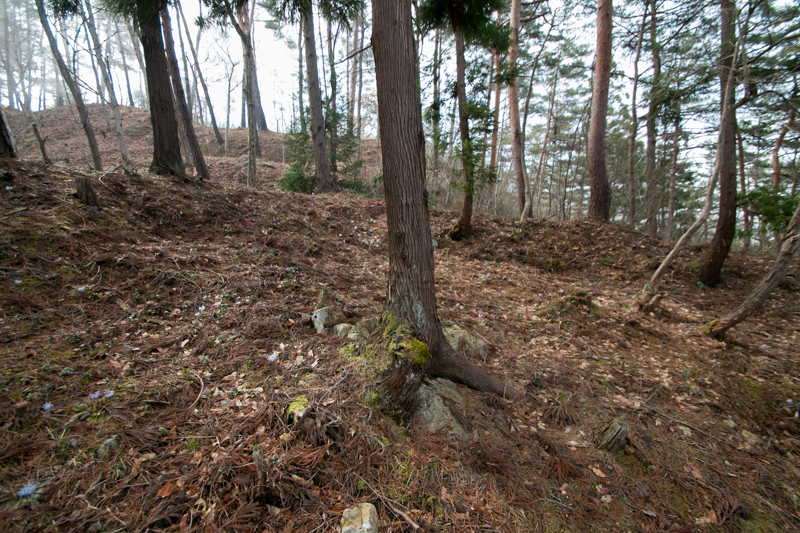 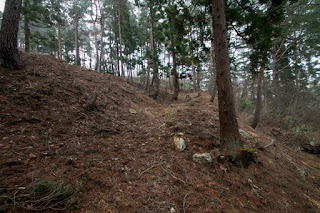 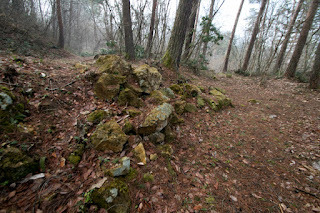 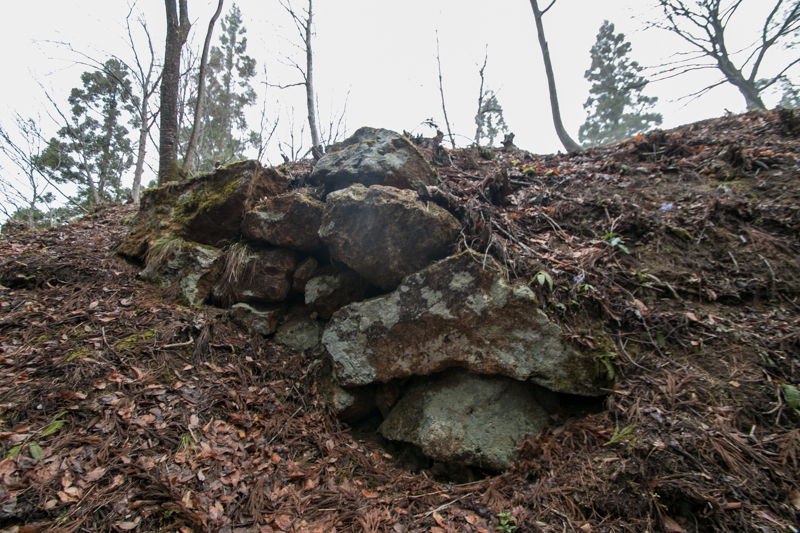 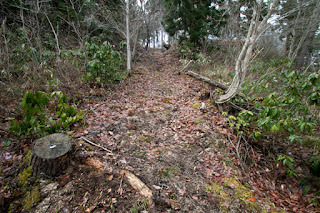 The ruin of Japanese garden was found at the top area, and there might be the residence of Morioki at this place. 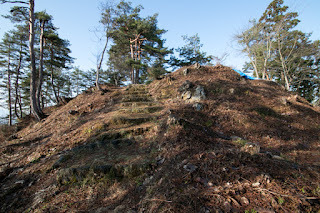 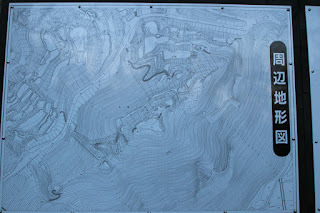 Simple but vertically leveled terraces might clearly show the authority of Moriuji. 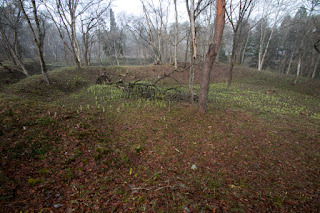 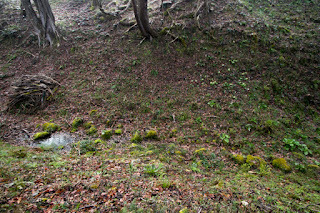 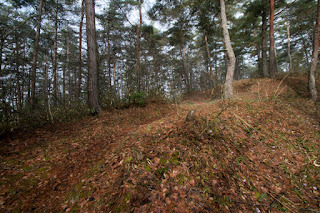 Secondary area is the main body of the castle spread under the main area. At the top of the small peak a large place used for the main residence was built, and combination of tall clay walls, vertical moats, horizontal moats and gates surrounded these core areas. 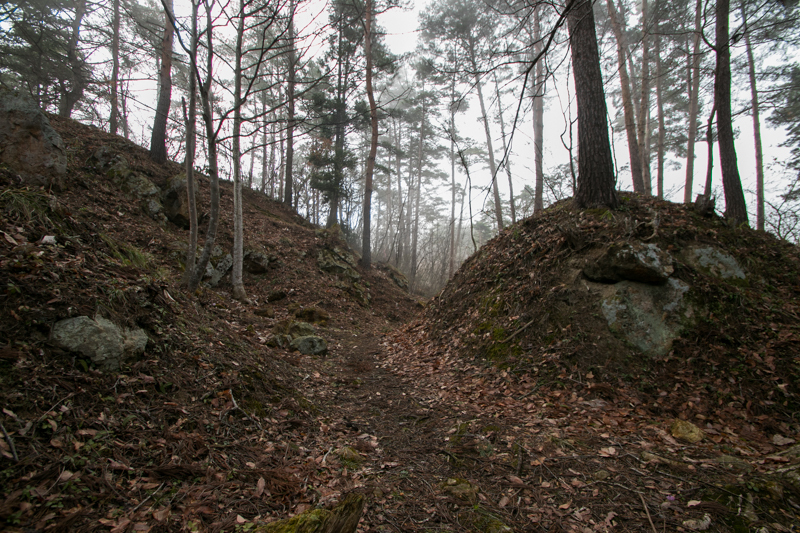 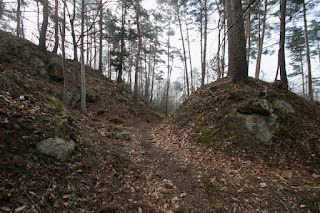 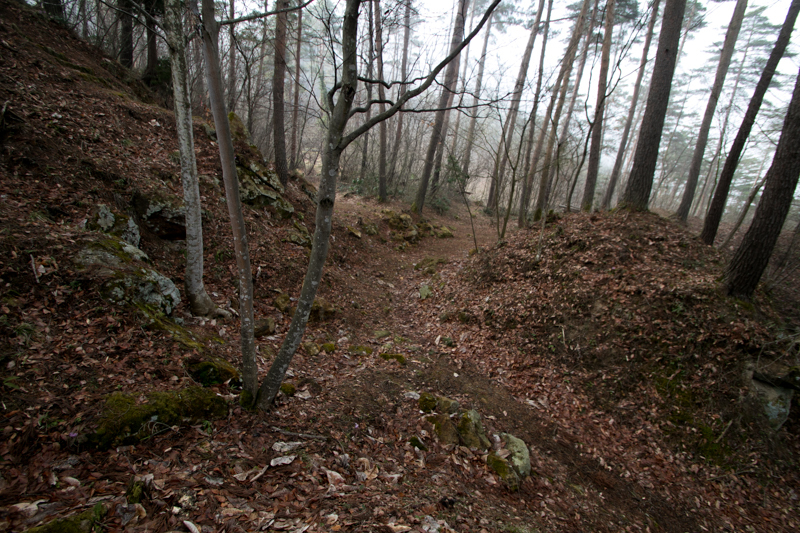 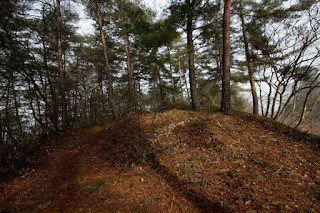 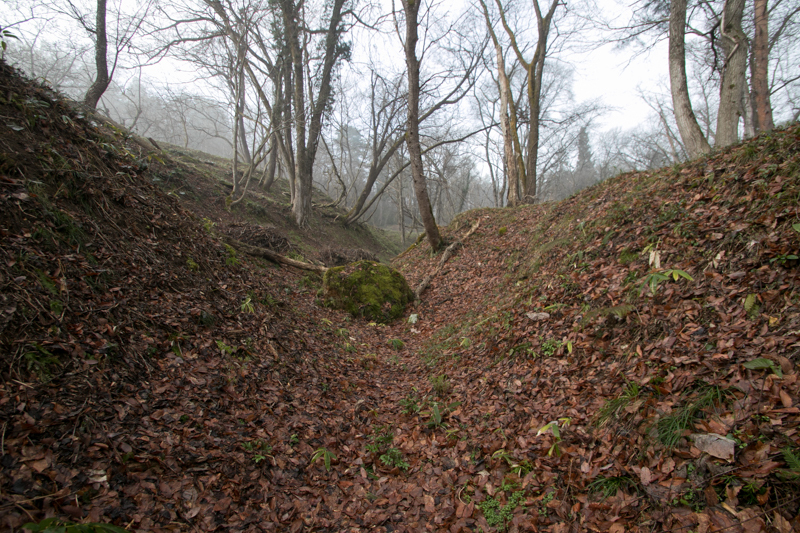 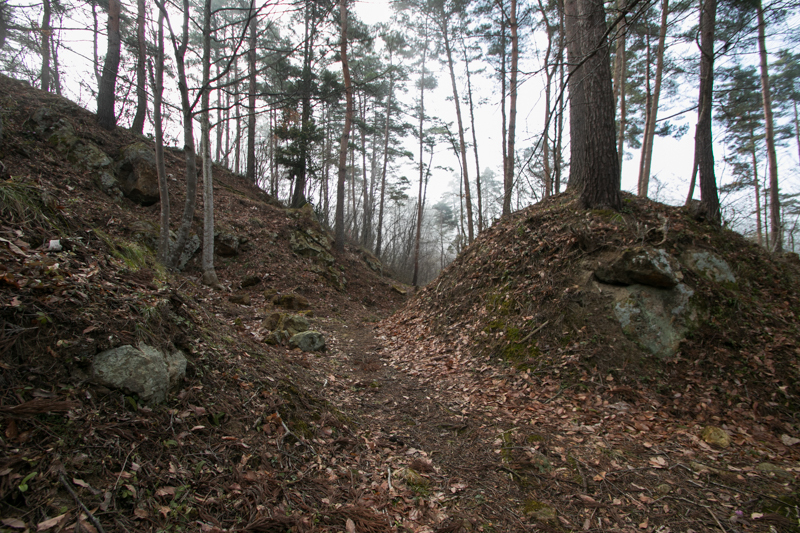 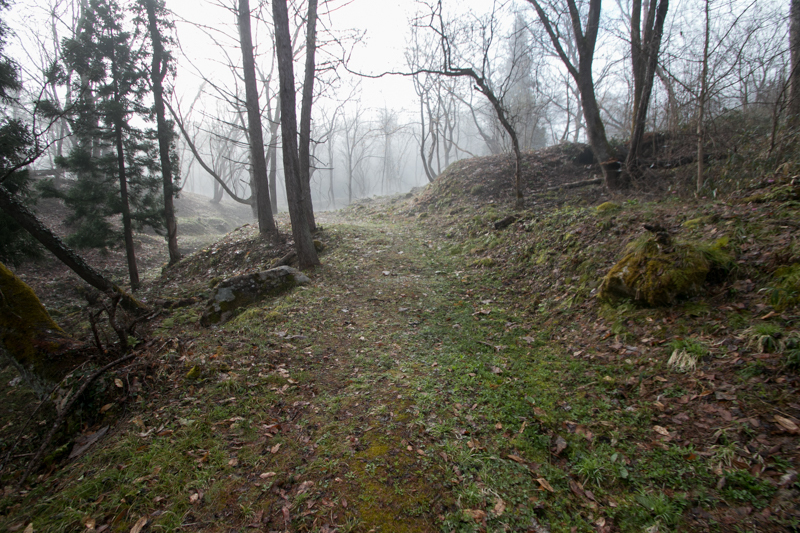 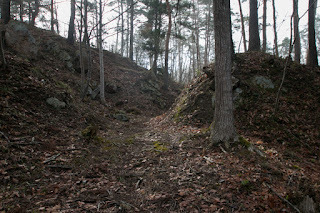 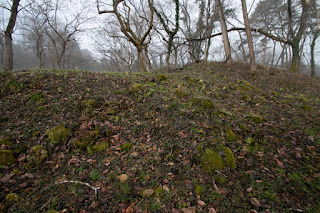 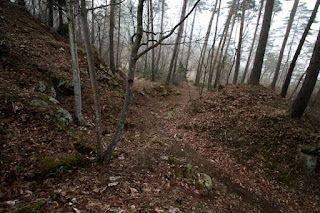 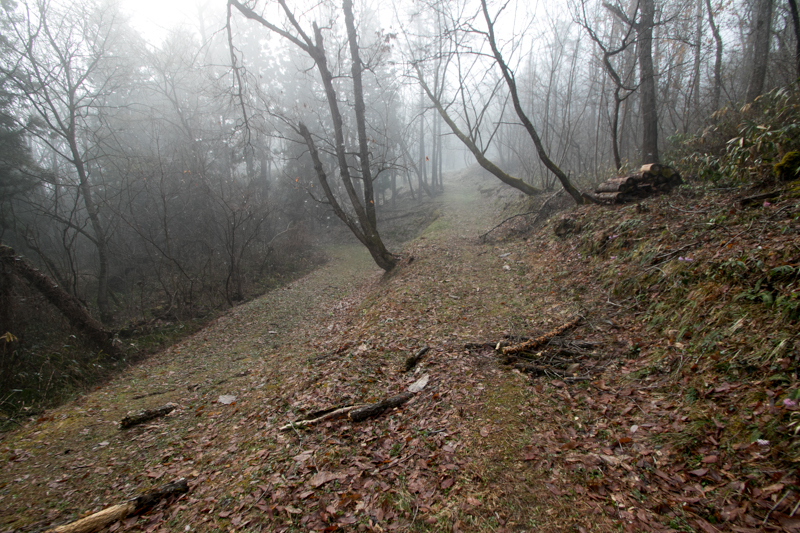 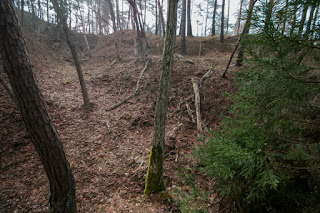 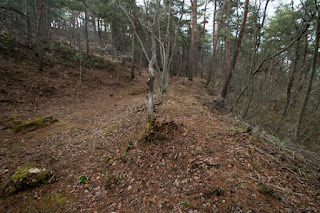 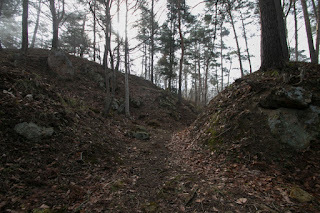 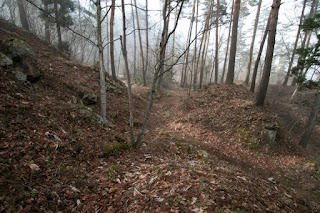 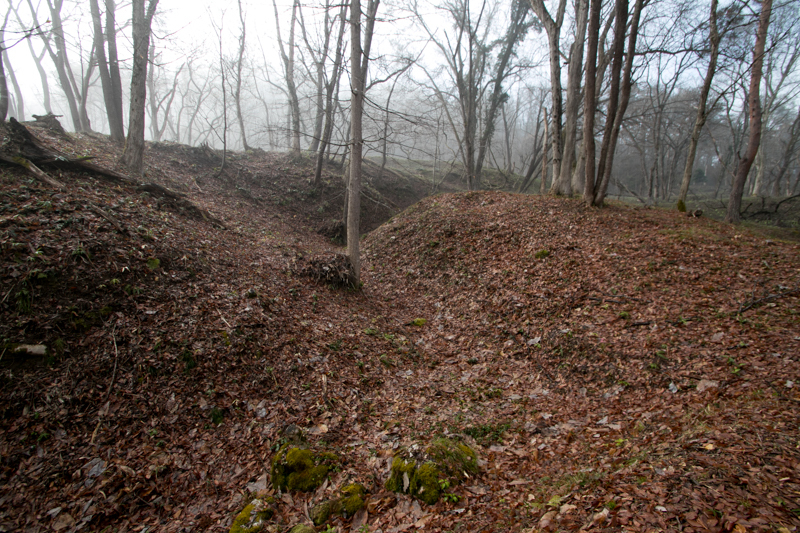 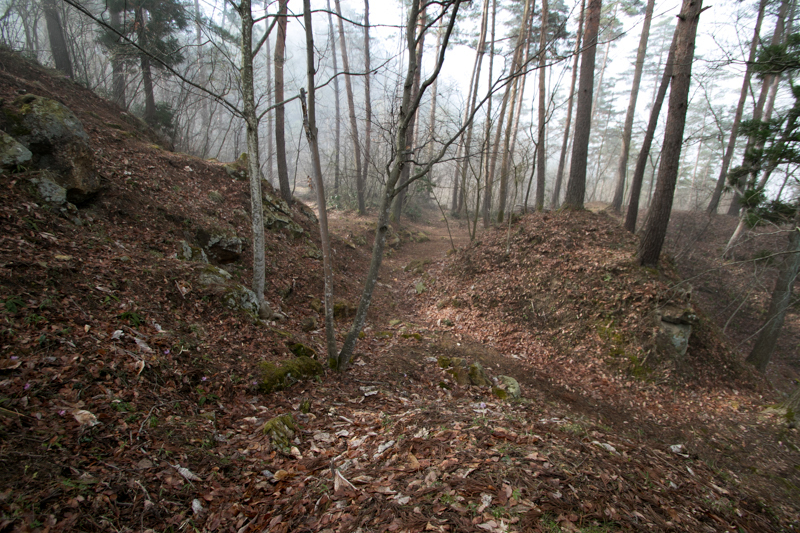 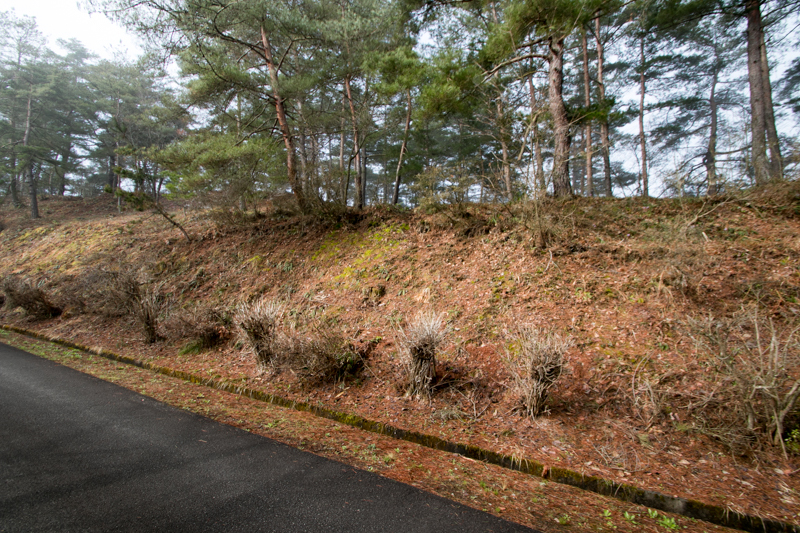 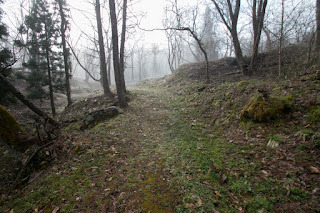 To attack this castle, attack side soldiers were forced to climb folding narrow paths between these walls and moats, and might suffer serious damage among their movement. The height of clay walls and depth of dry moat is outstanding and huge volume of construction was inputted to build these defense facilities. 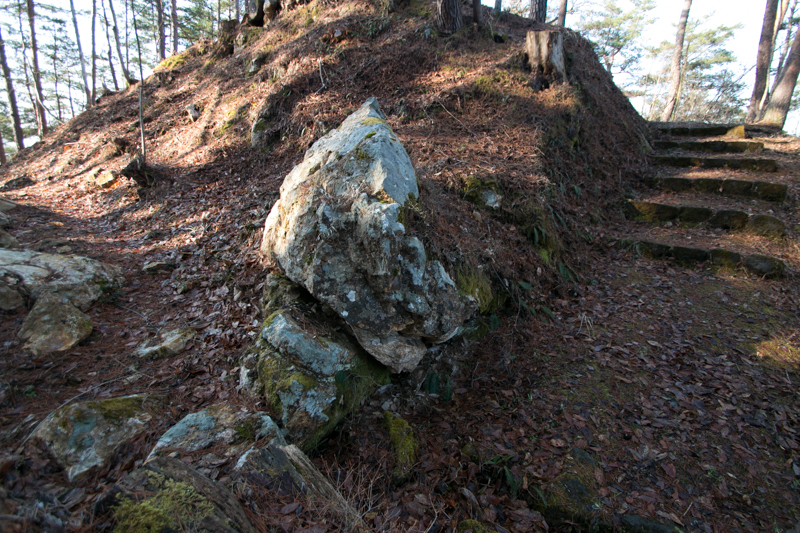 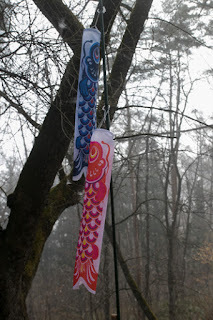 At the end of main route, there is a huge Masugata (composite gate) decorated by large stones, which also showed the authority of Ashina clan. 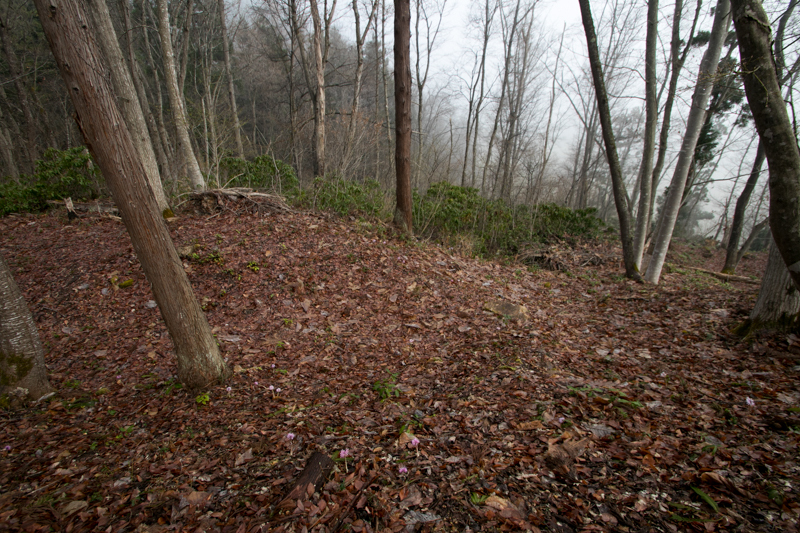 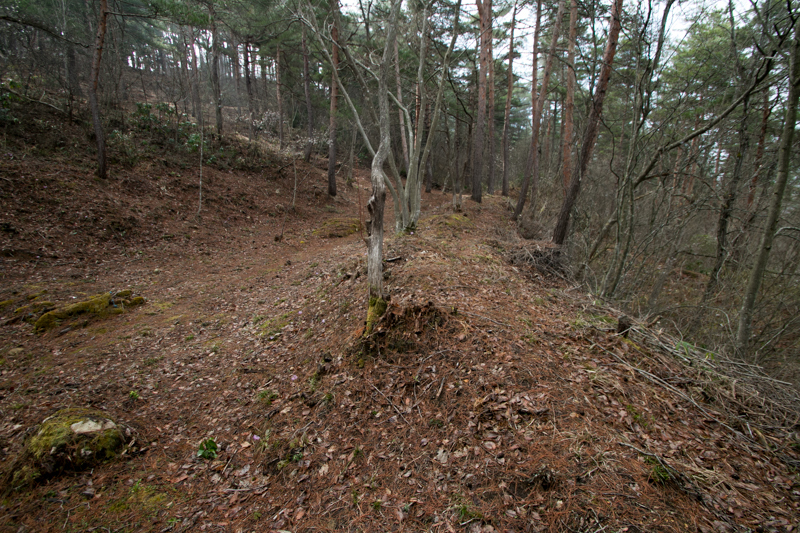 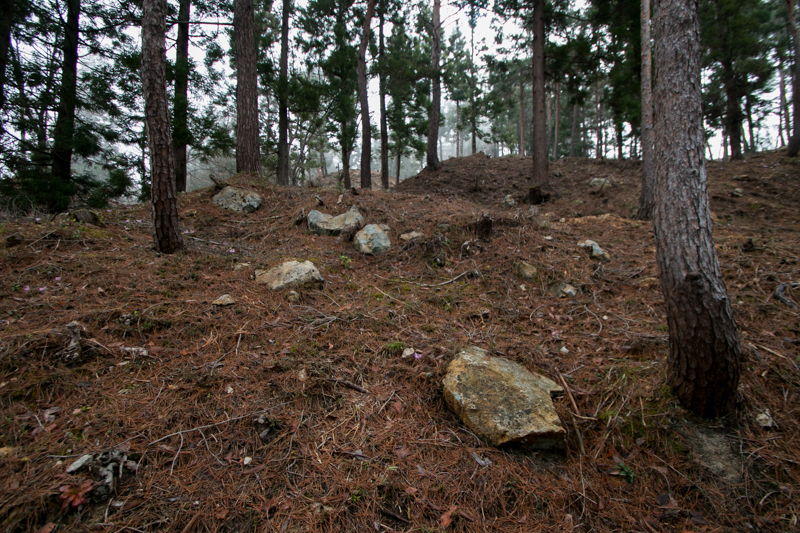 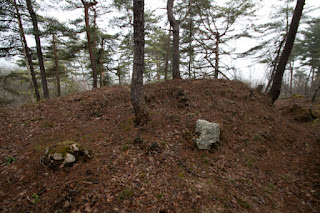 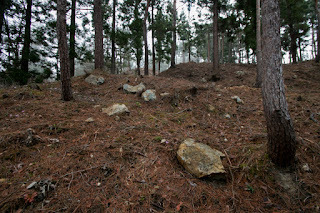 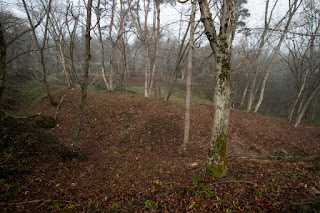 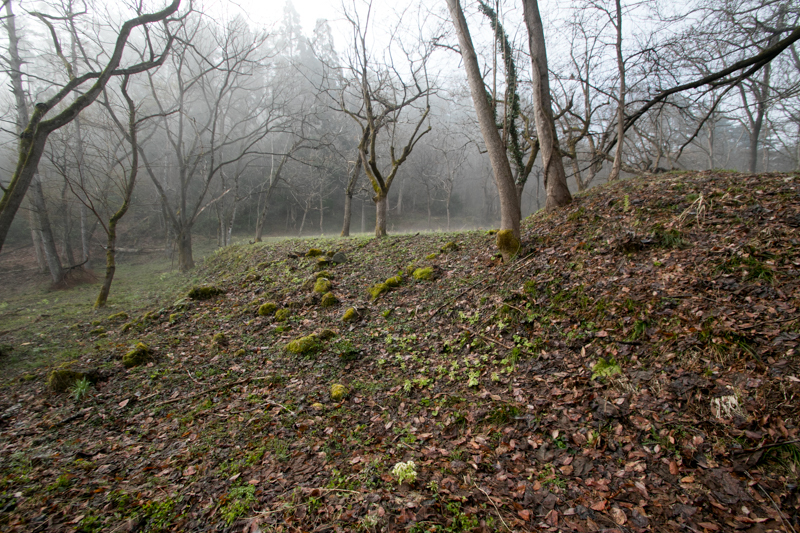 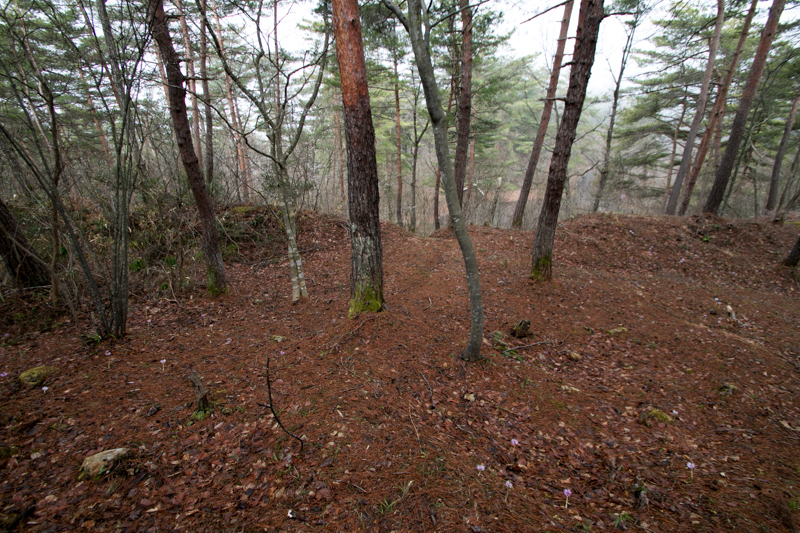 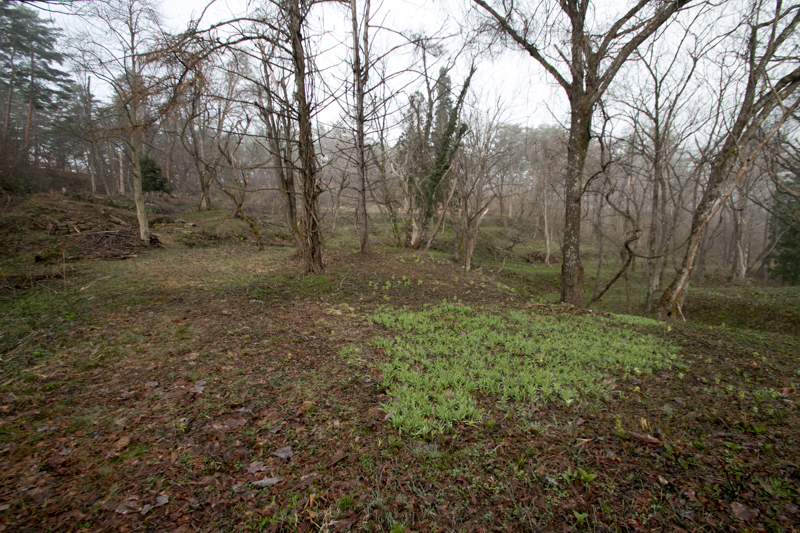 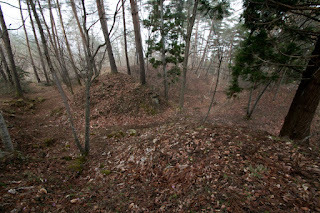 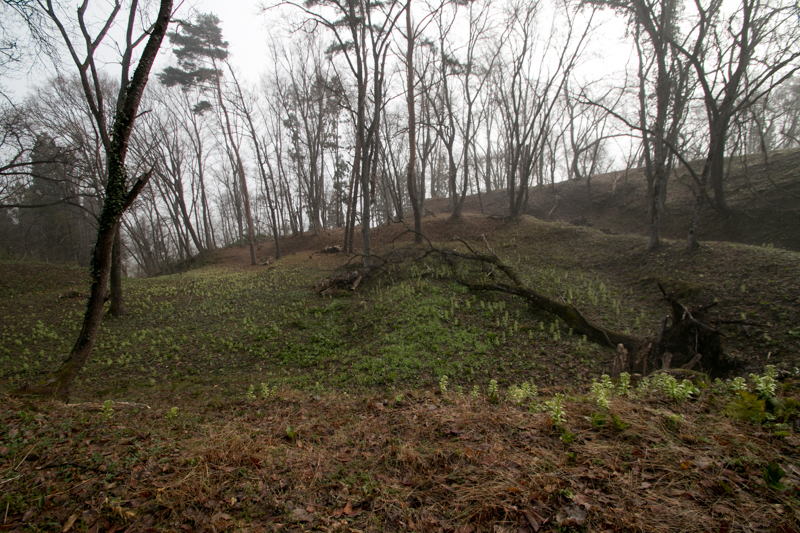 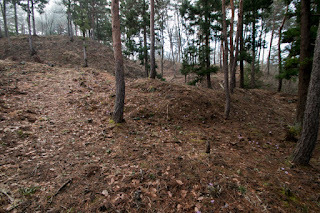 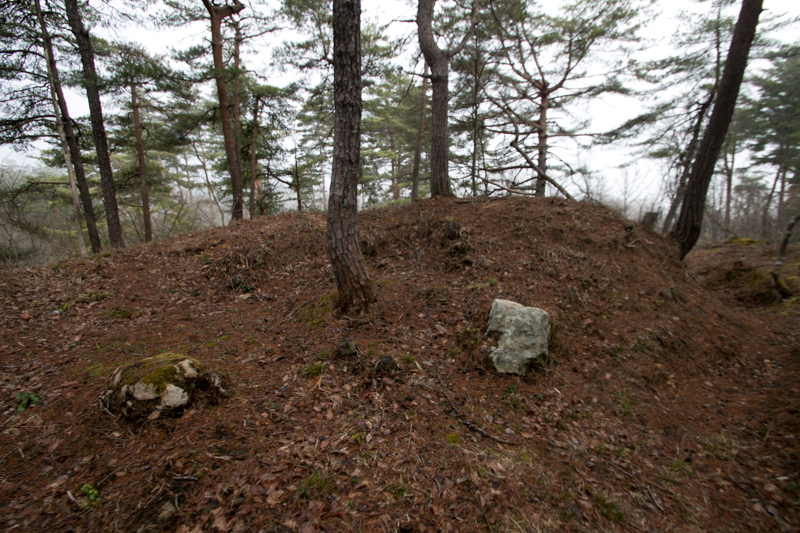 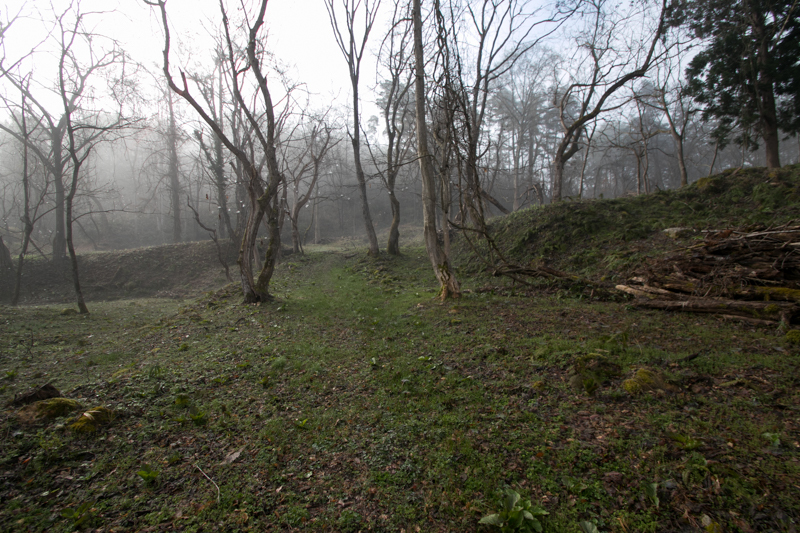 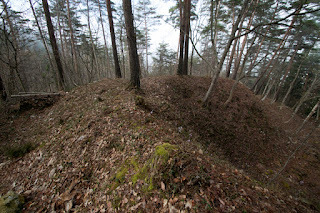 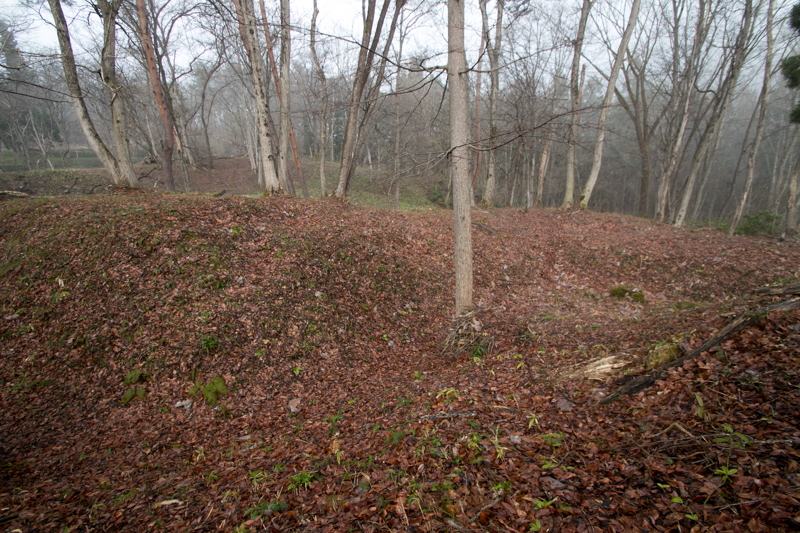 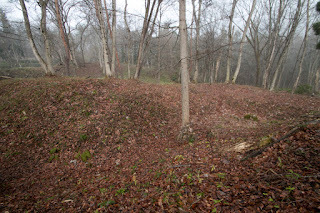 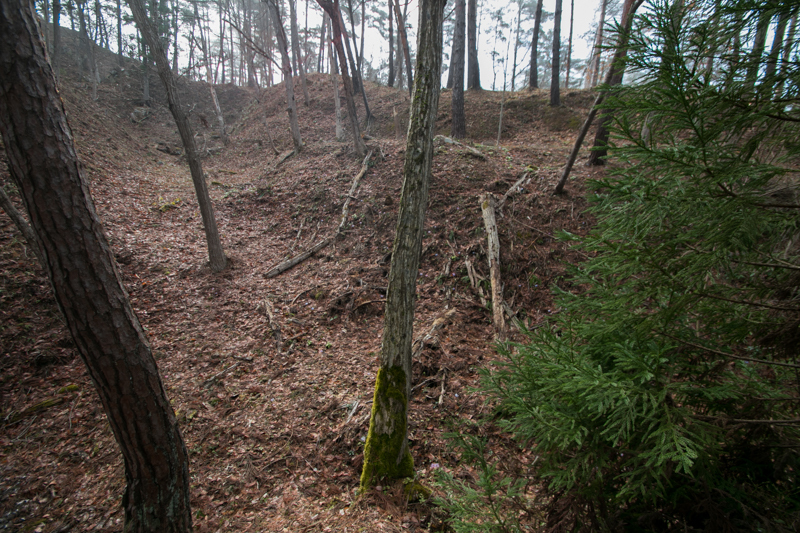 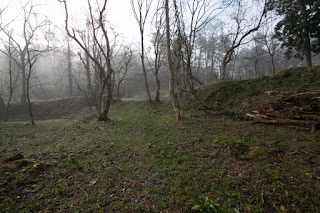 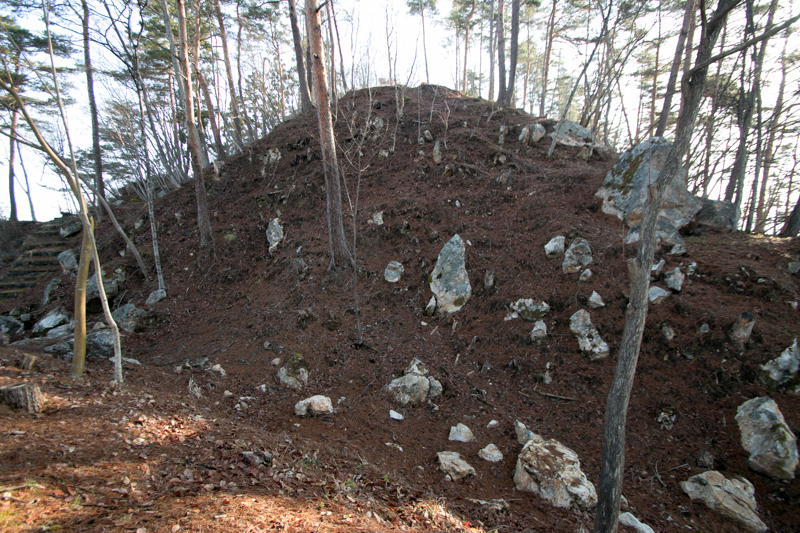 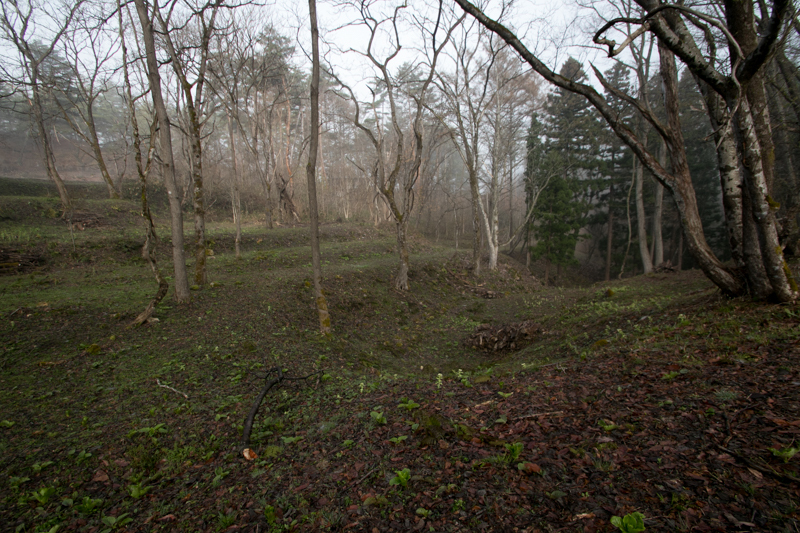 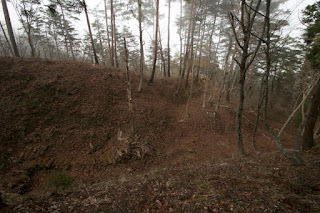 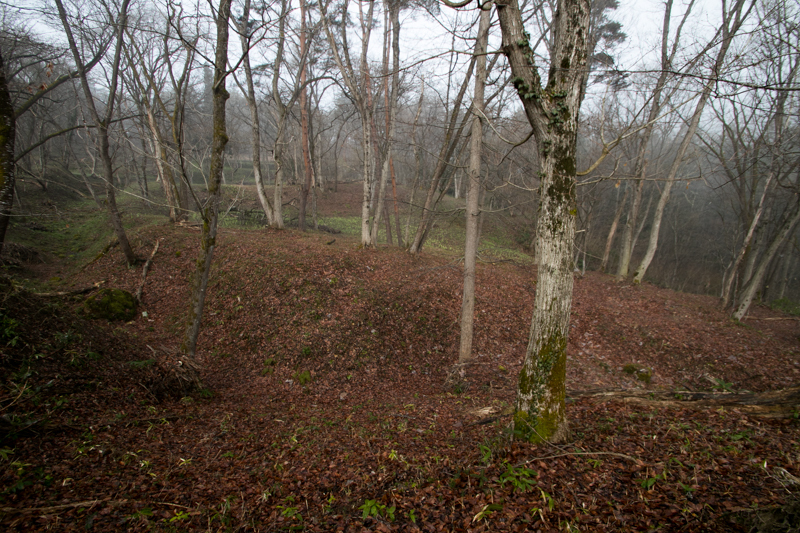 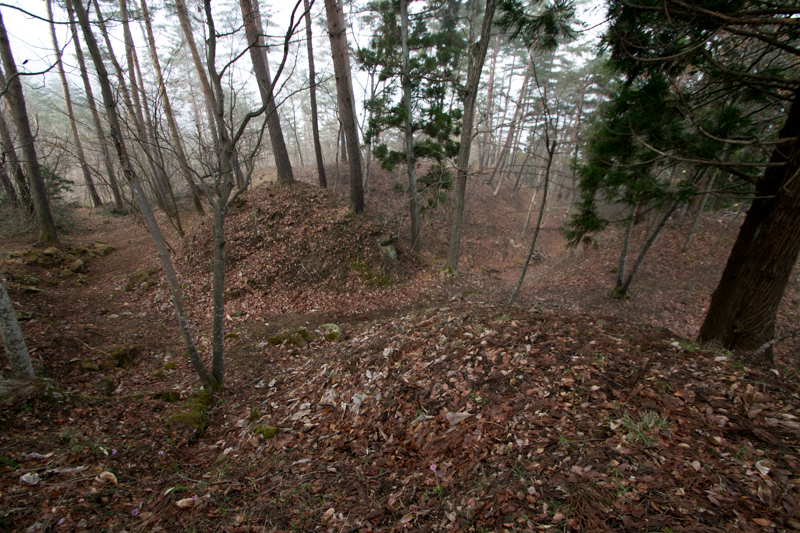 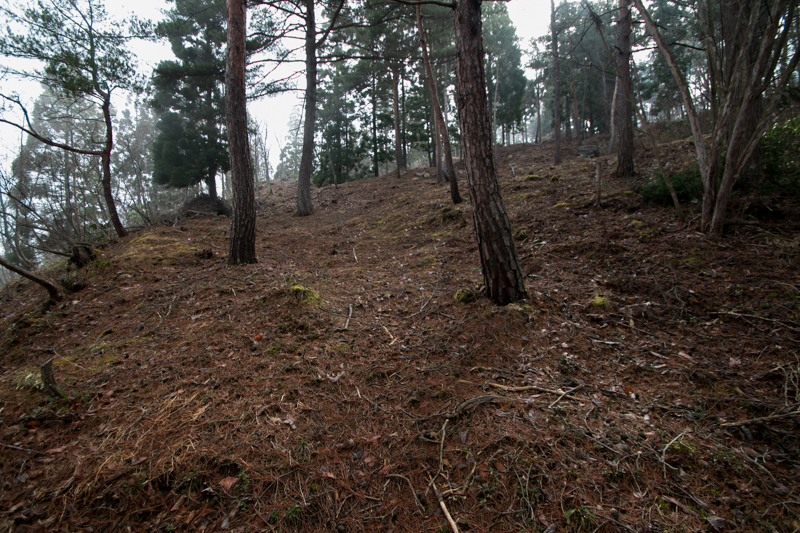 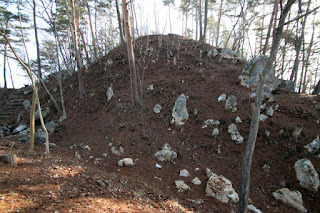 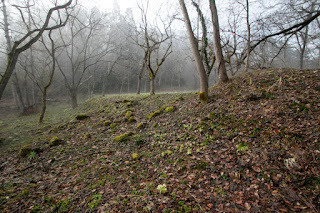 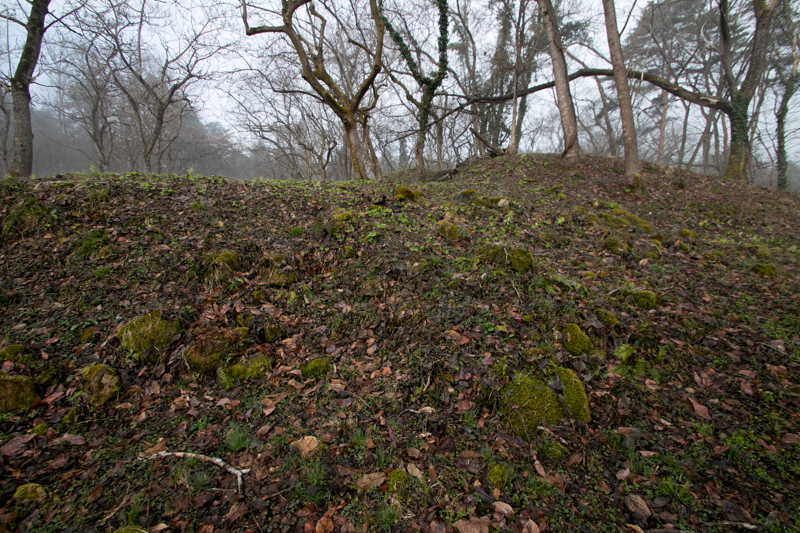 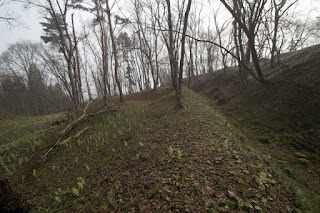 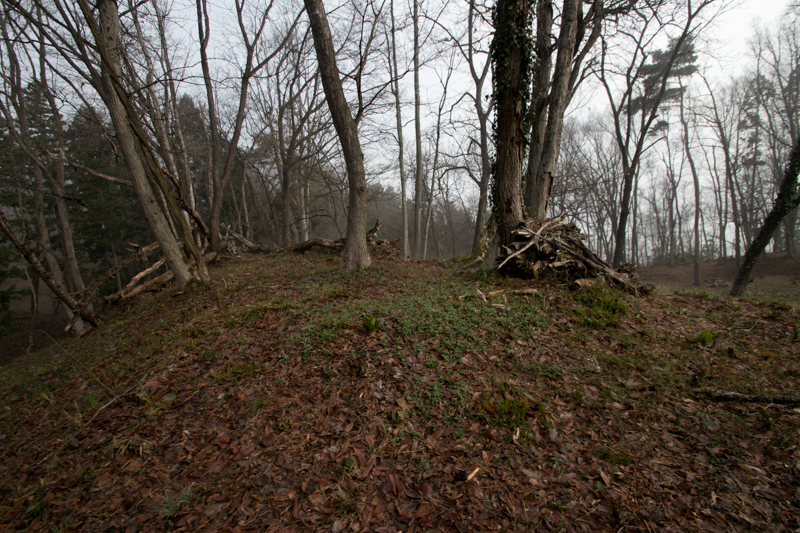 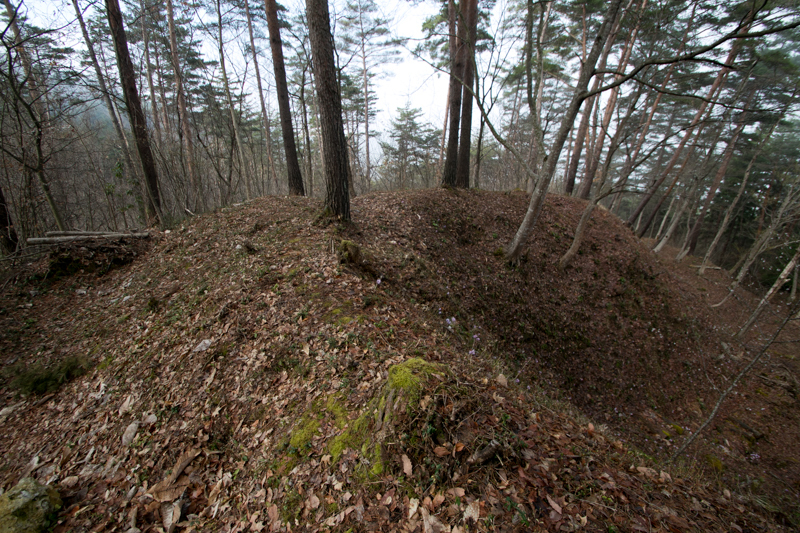 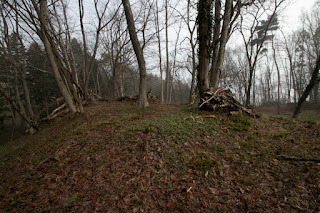 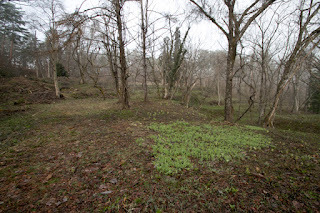 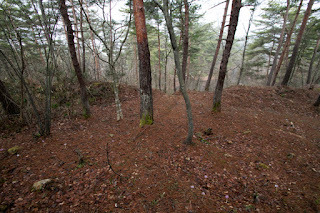 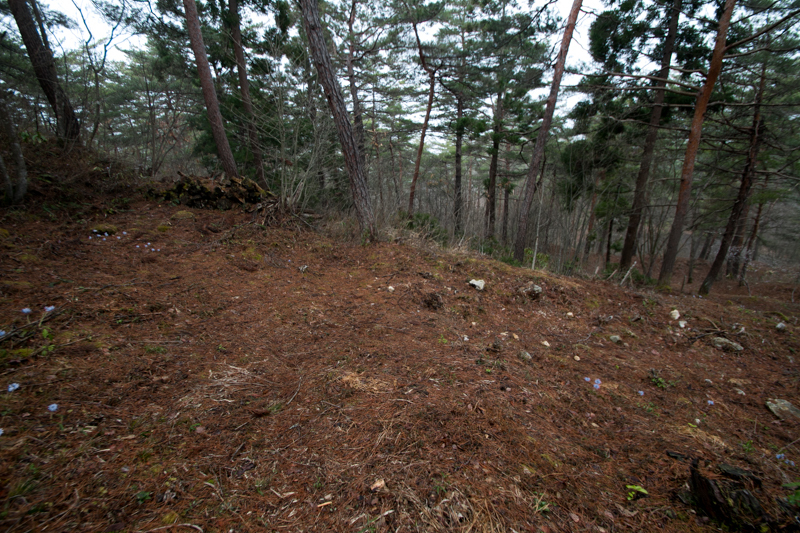 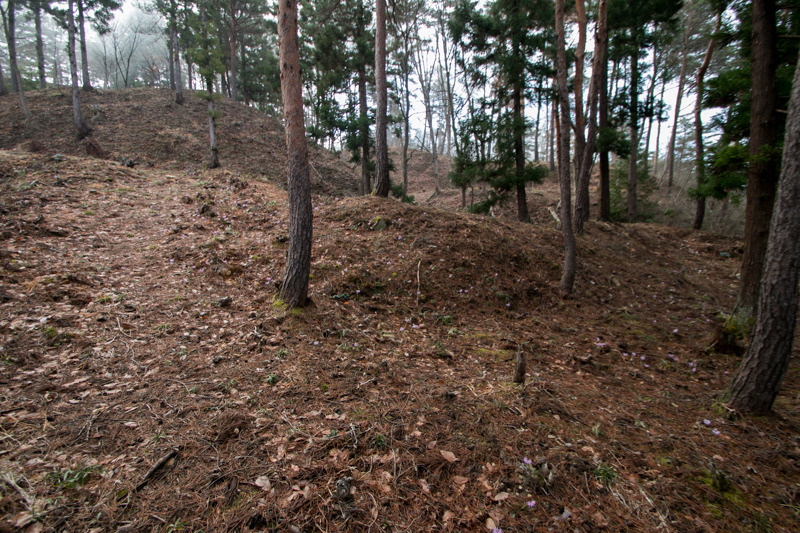 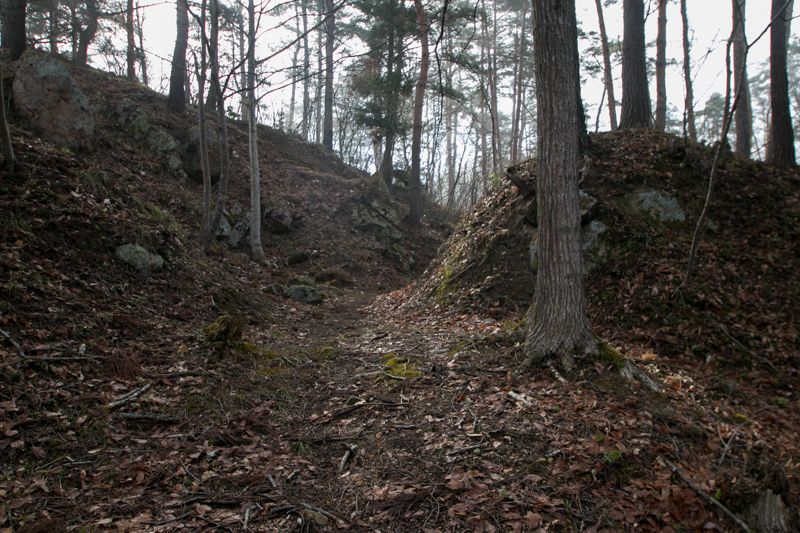 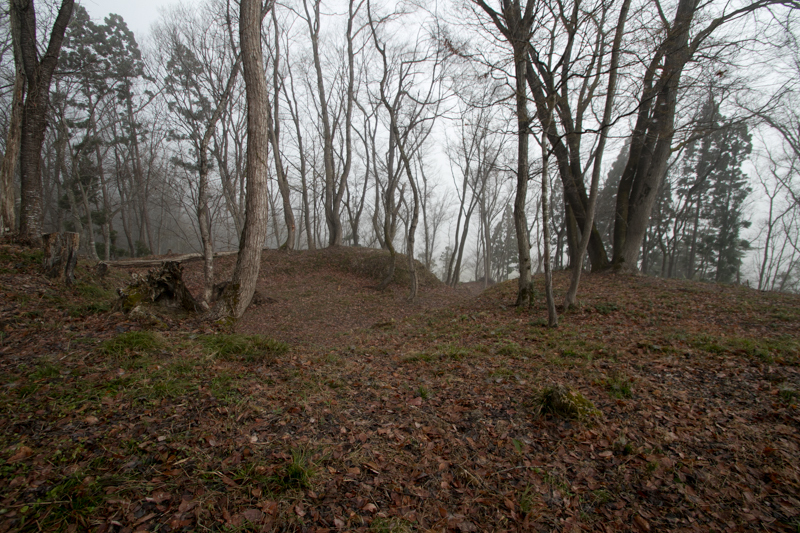 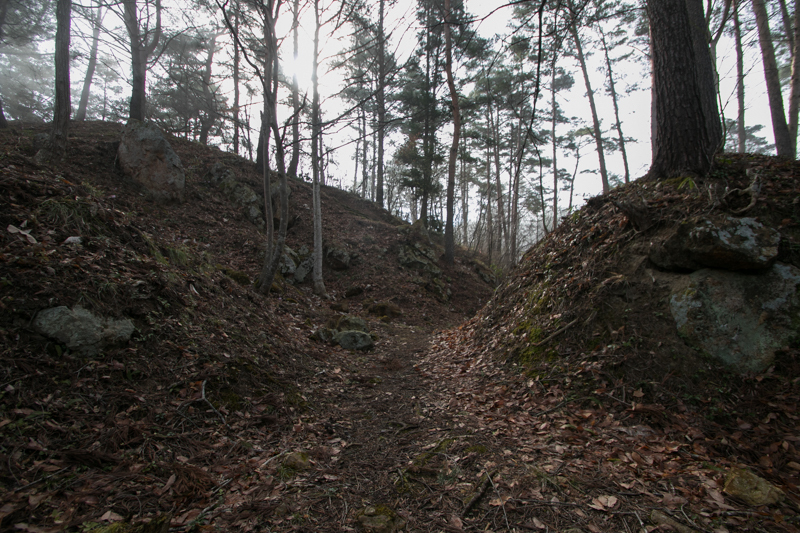 Third area spread near the saddle point is the front fort of the castle consist of large areas. 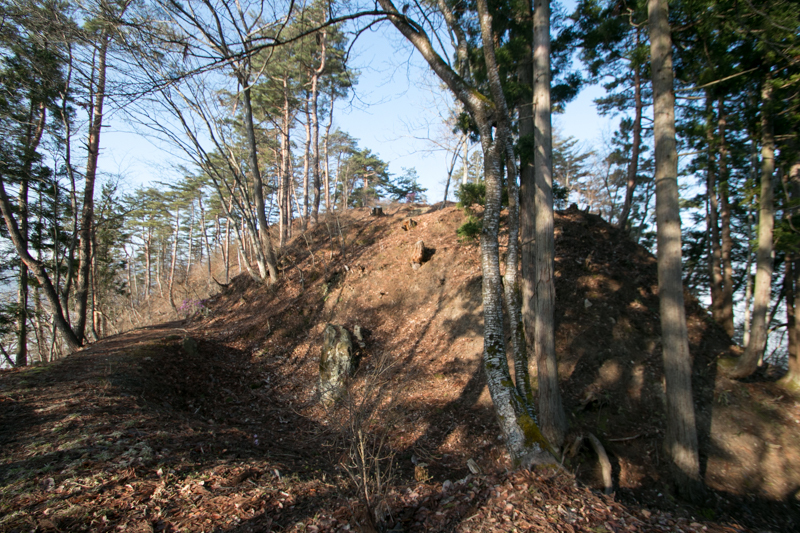 It is said that these areas were used at training space, and huge size clay wall and dry moat separated the castle from outside area. Although Ashina clan enjoyed its prosperity with Mukaihaguroyama caste, that period did not continue long. 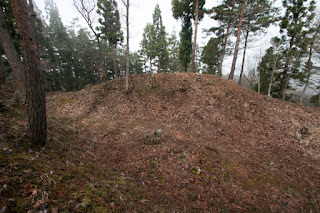 After the death of Moriuji in 1580, the power of Ashina clan significantly and rapidly decreased due to short lived leaders and internal conflicts. 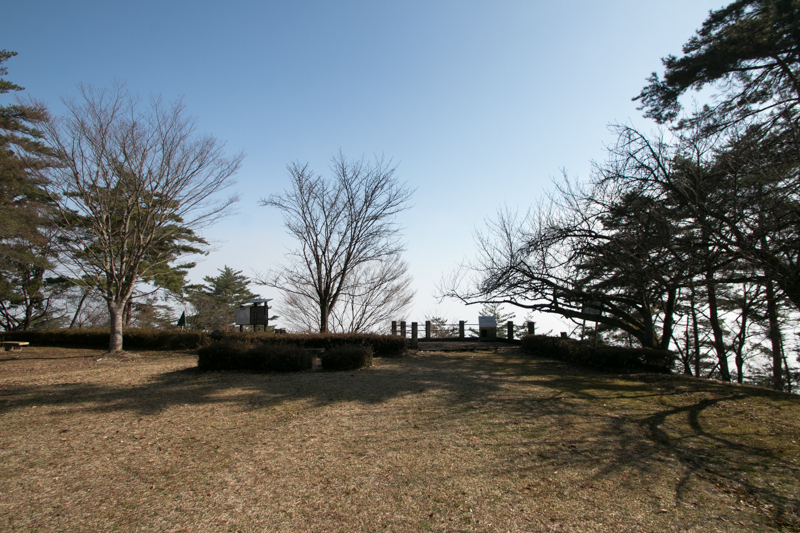 Moritaka Ashina (1561-1584), successor of Moriuji, strengthened or built Mukaihaguroyama castle, Inawashiro Castle and Kashiwagi castle as a triangle to protect their territory. 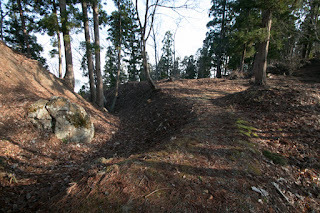 But after further disorder, Ashina clan substantially fell by the defeat at the battle of Suriagehara against Masamune Date (1567-1636) in 1589 and ruined. 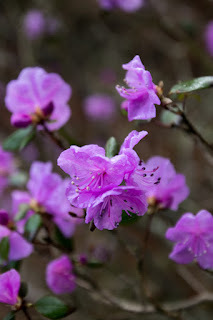 Date clan which captured Aizu region was moved to Sendai area by Toyotomi government in 1590, and later Gamo clan and Uesugi clan became the lord of Aizu region. 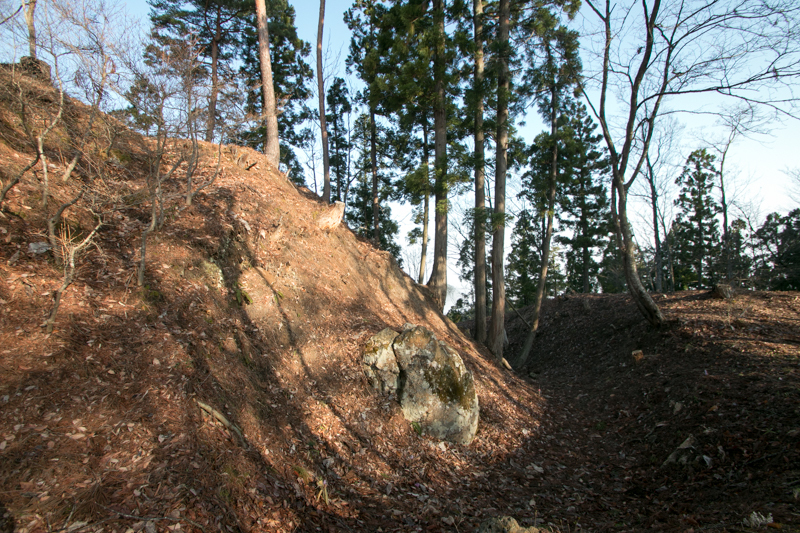 As Aizu Wakamatsu castle, the main castle of Aizu region was a plain castle not suitable for defense, Gamo clan and Uesugi clan kept Mukaihaguroyama castle as a final base. Especially Kagekatsu Uesugi (1556-1623), who expected defensive battle against Ieyasu Tokugawa (1543-1616) at the battle of Sekigahara in 1600, might strengthen Mukaihaguroyama castle. But after the battle of Sekigahara, along with the arrival of peace period, the necessity of Mukaihaguroyama castle was lost and finally this castle was abolished around 1620. Today all building was lost but structure of the castle such as clay wall and dry moats almost completely remain in the mountain. 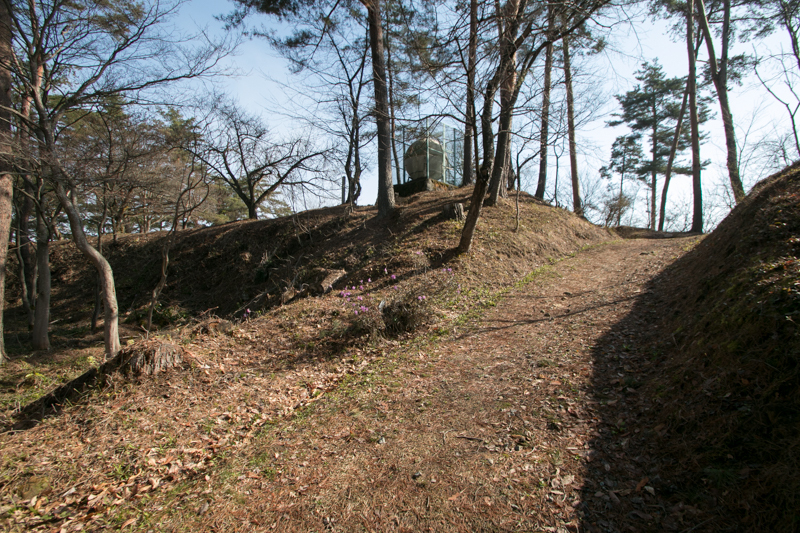 Although this castle is not so famous due to its short usage and rapid fall of Ashina clan, but the largeness and security of the castle well shows the glorious period of Ashina clan, and also shows the element of medieval castle clearly to us. 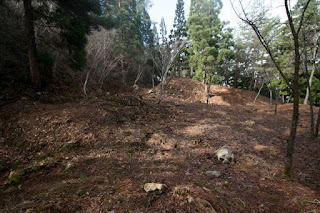 Note that visitors have to be cautious about bears from spring to autumn. 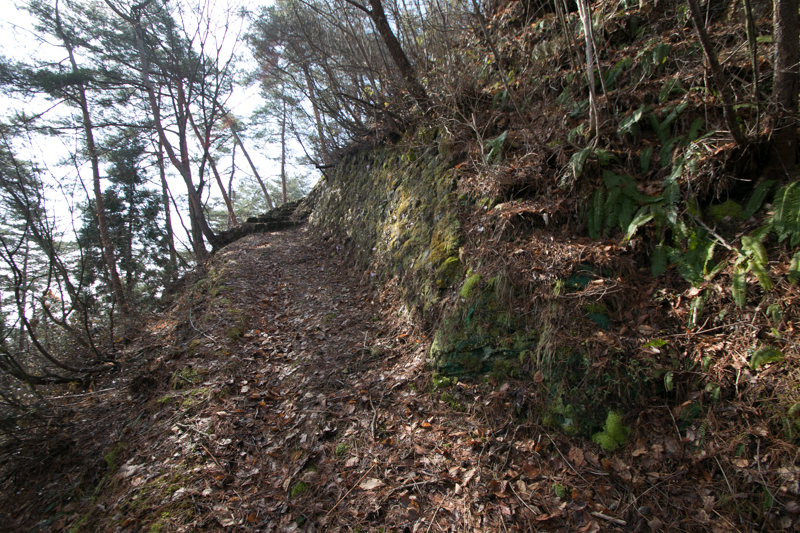 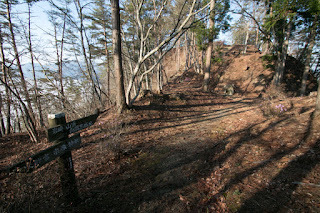 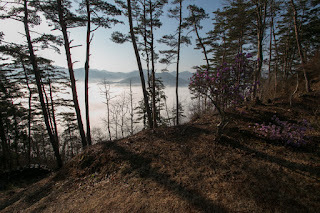 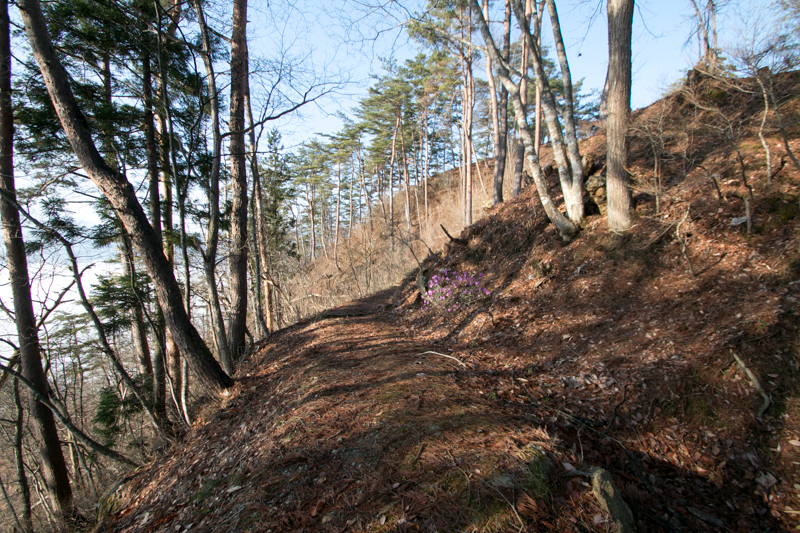 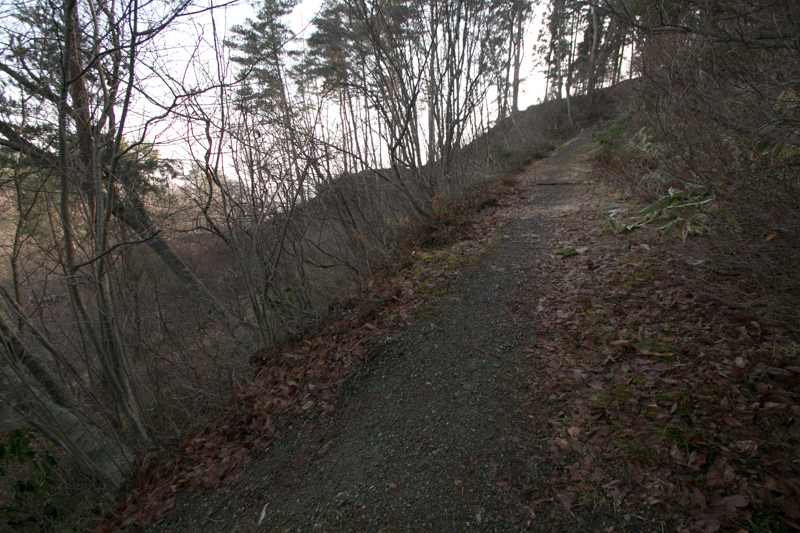 60 minutes walk from JR East Tadami line Aizu-Hongo station. 40 minutes drive from Banetsu Jidoshado Expressway Aizu-Wakamatsu interchange.